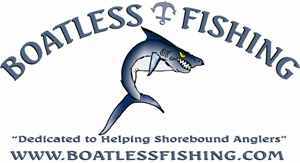 I spent a couple of weekends getting my jigging gear ready and couple others catching bait for our trip to the Dry Tortugas. 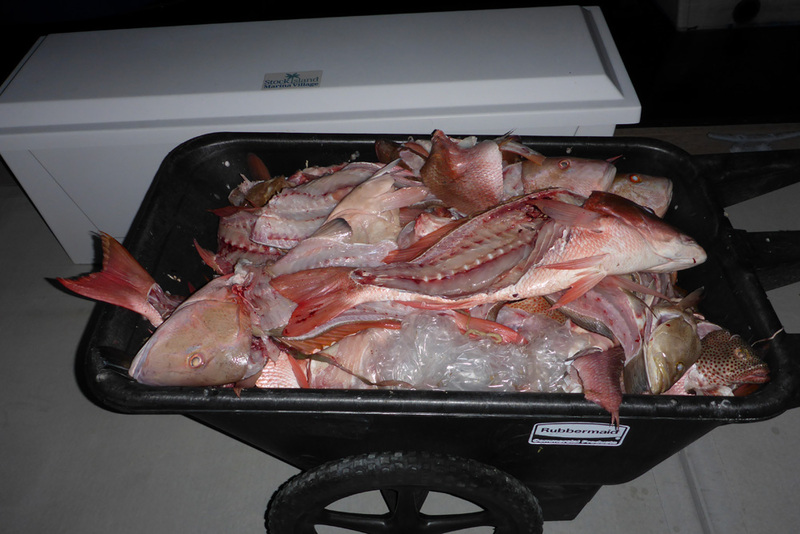 On one night I had hell netting with a 3 foot cast net but managed to net 136 ballyhoo of which I a gave a bag of over 20 to each on the trip. 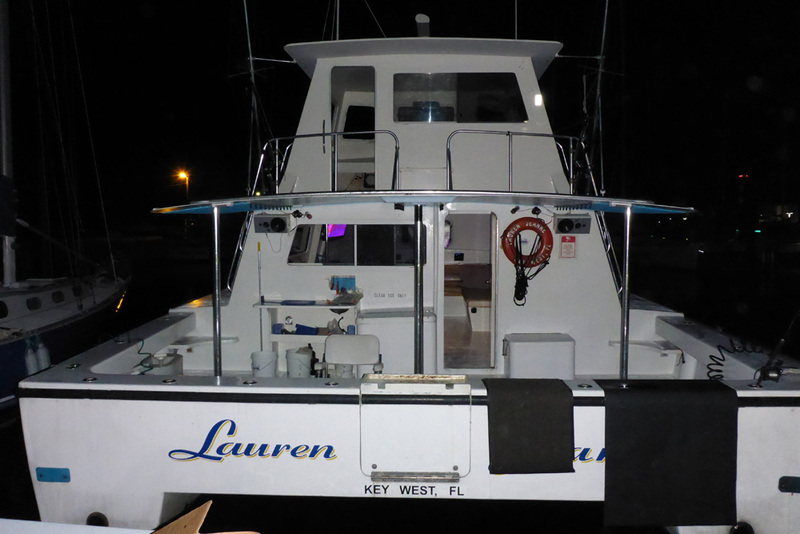 Before the trip we had one more night scheduled to catch bait and this time I was to bring a 6 foot cast net to make things easier once I got to the dock Adam got the boat ready to go but it was a no go. 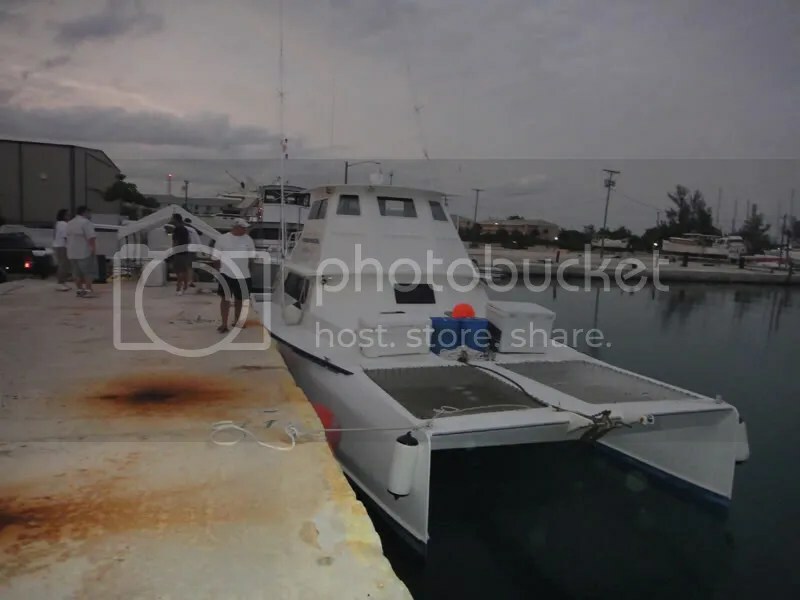 The bridge between the dock and the liberty of the ocean was blocked by higher than normal low tide, we were not able to get past the bridge to get fresh bait that we would keep brined to take the same day. 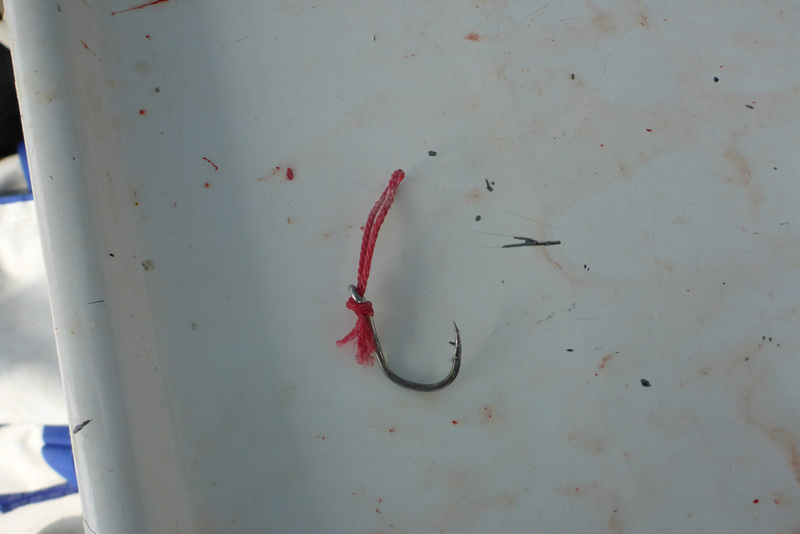 In the end of bait gathering we all managed to get a few goggle eyes and bought a few as well. 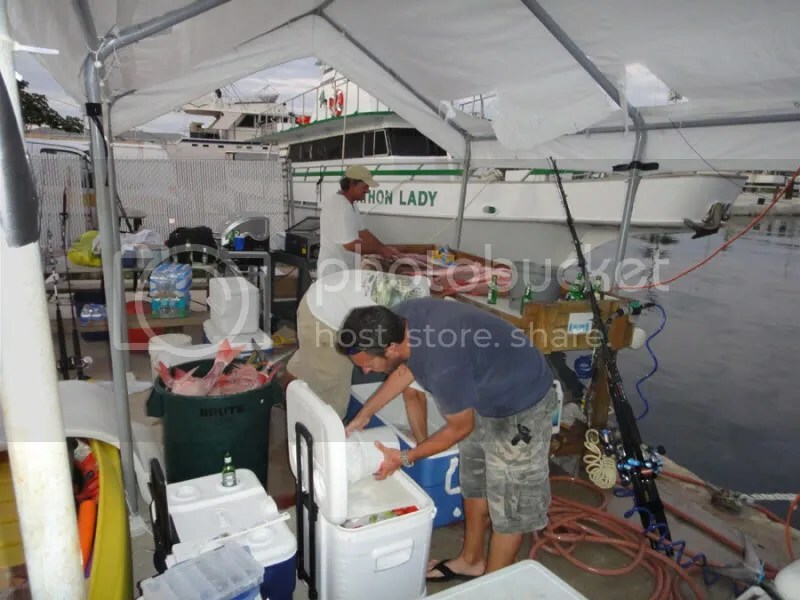 With the bait in our freezers and our gear ready to go we thought all was 100% when all of a sudden we were on weather watch as the weather could make a bad turn to cancel our trip as it did in 2013. 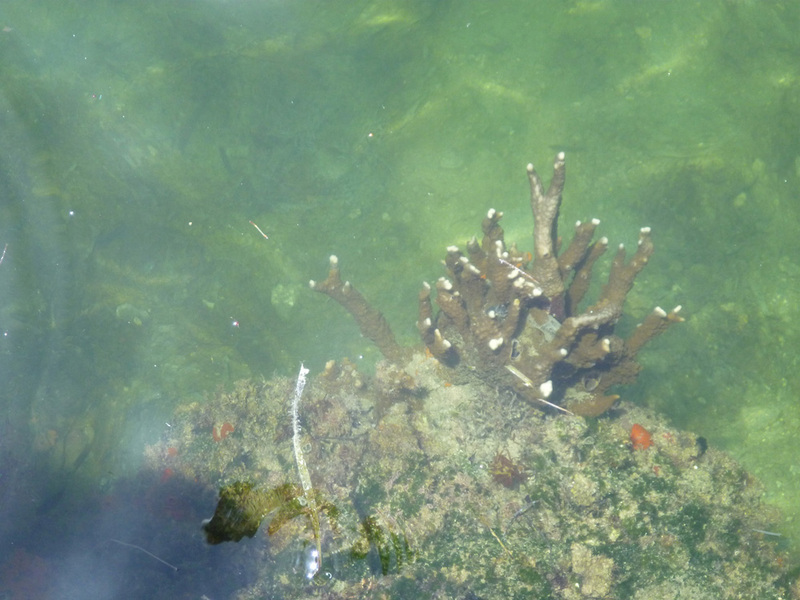 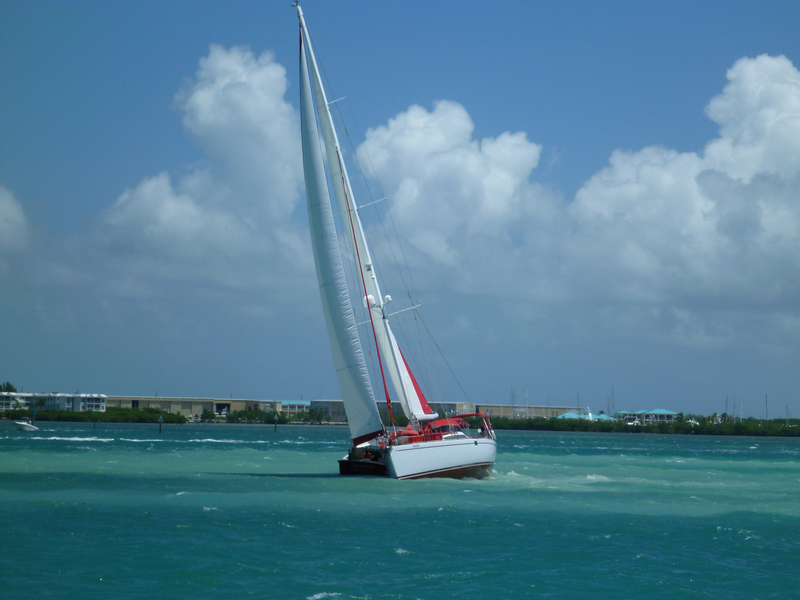 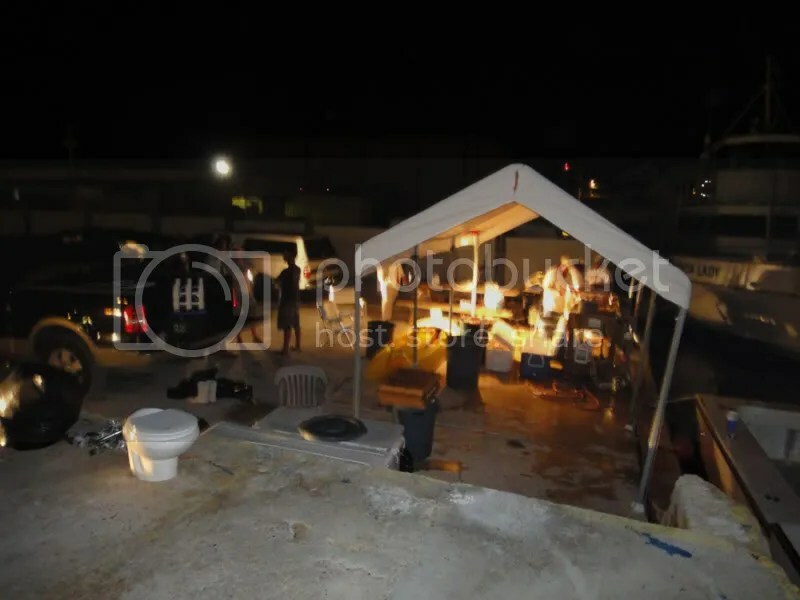 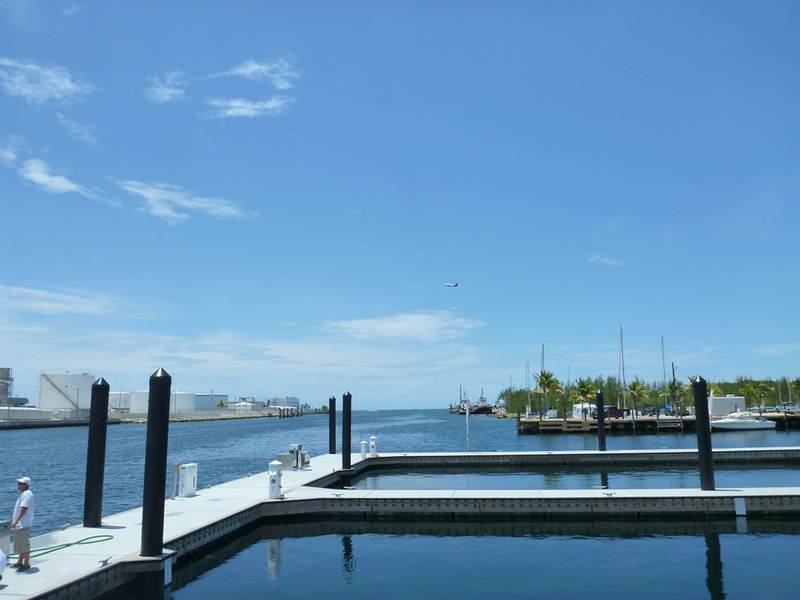 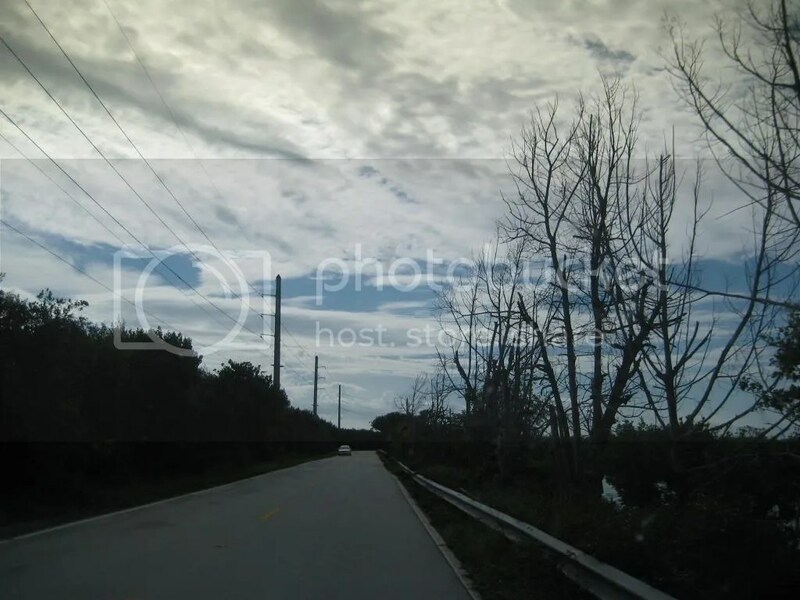 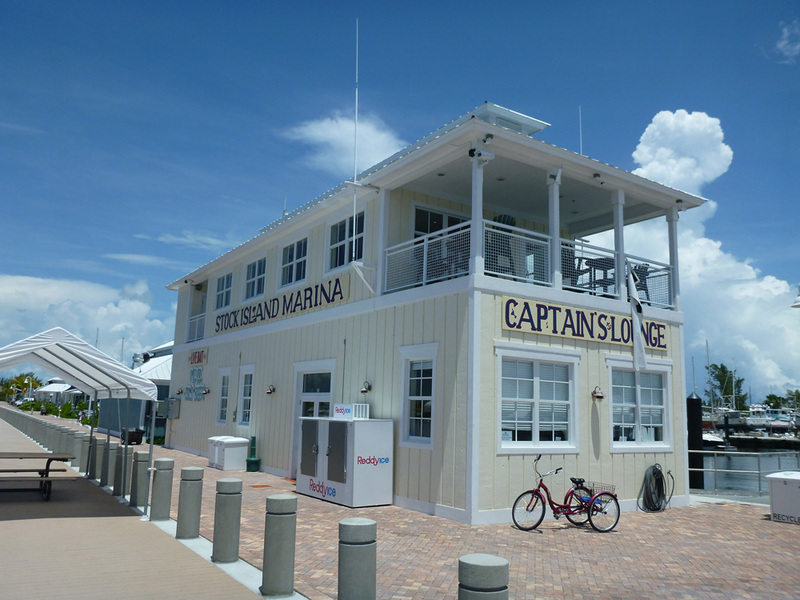 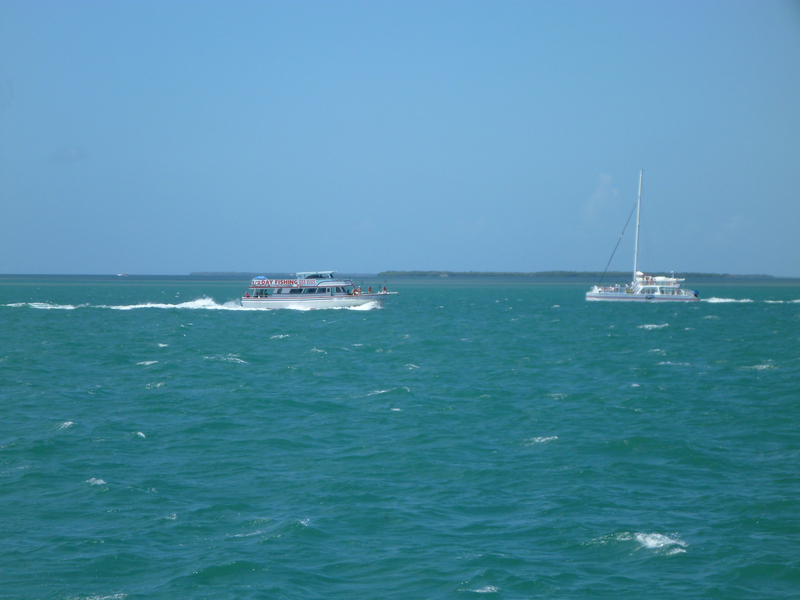 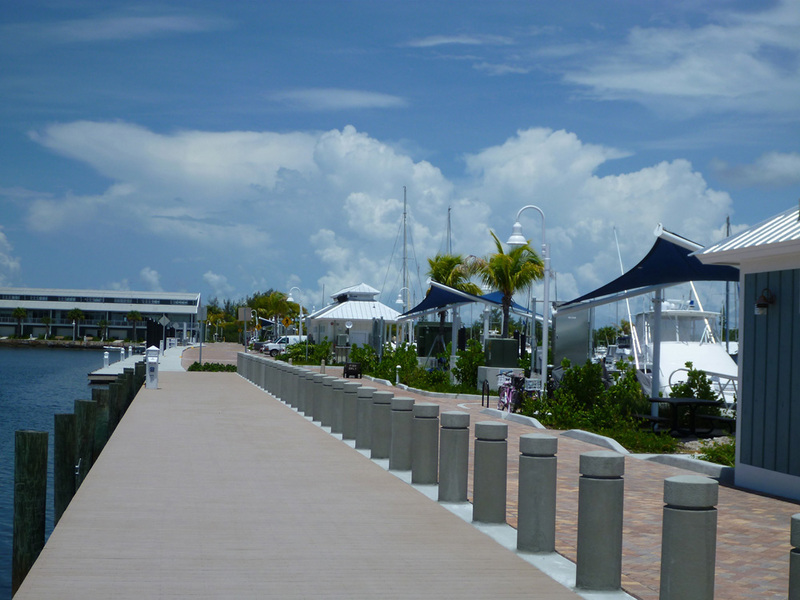 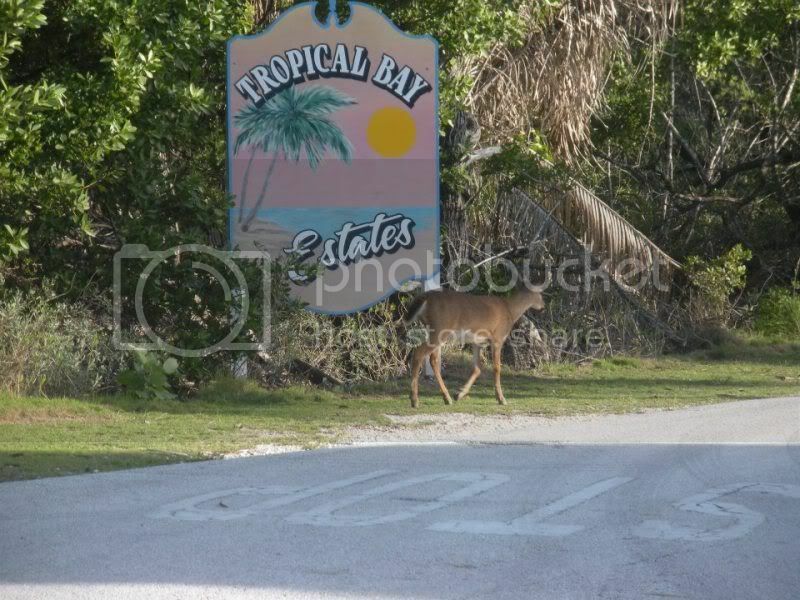 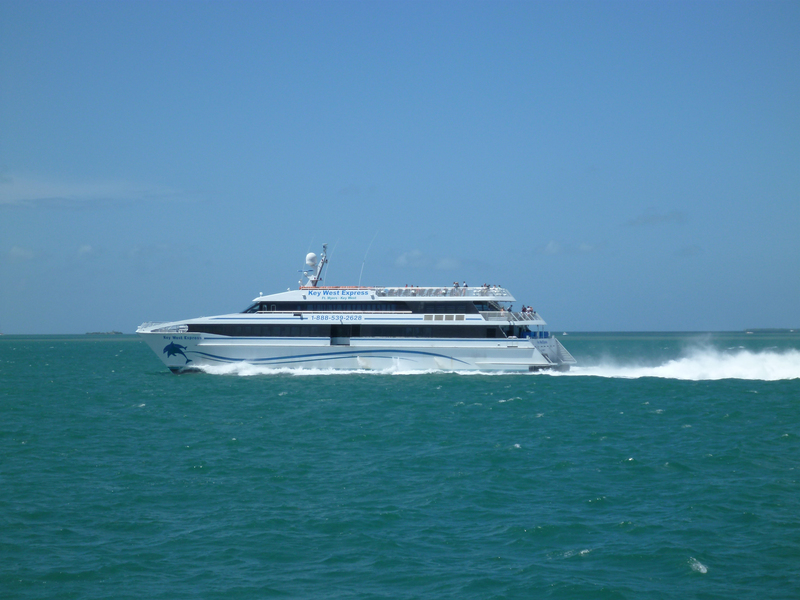 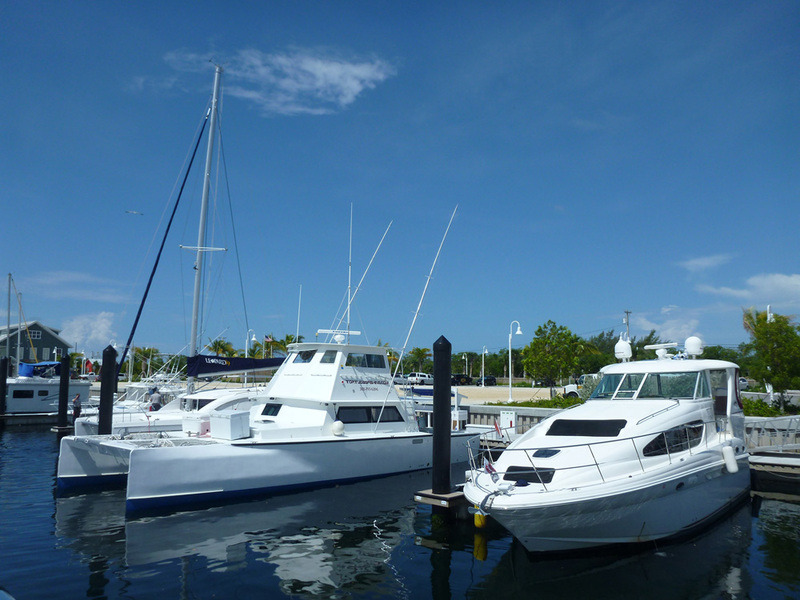 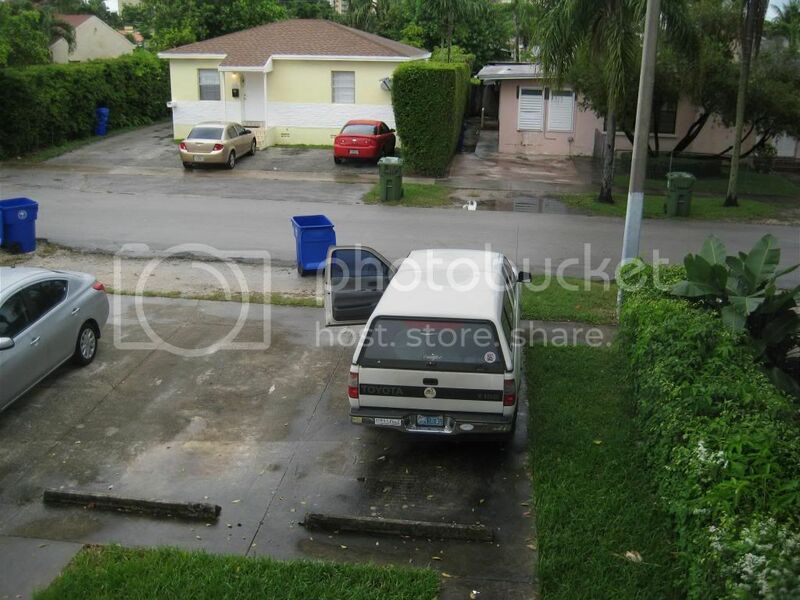 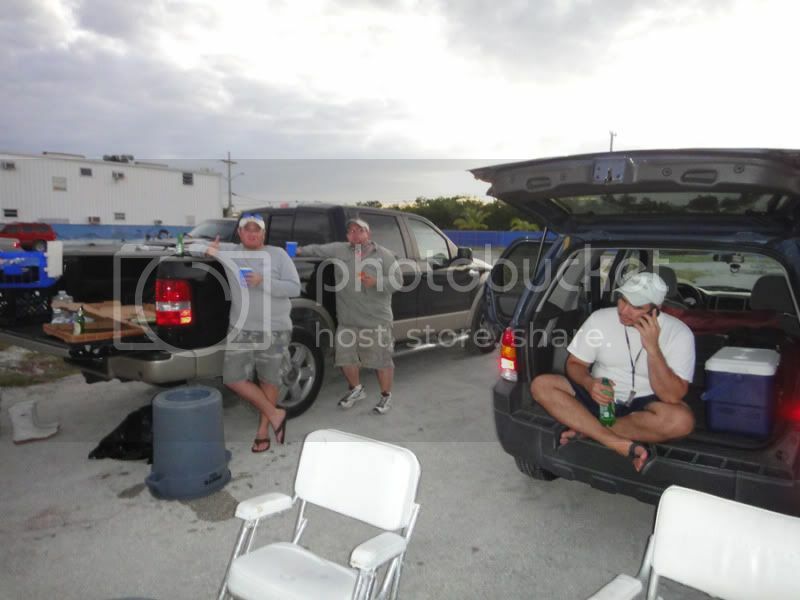 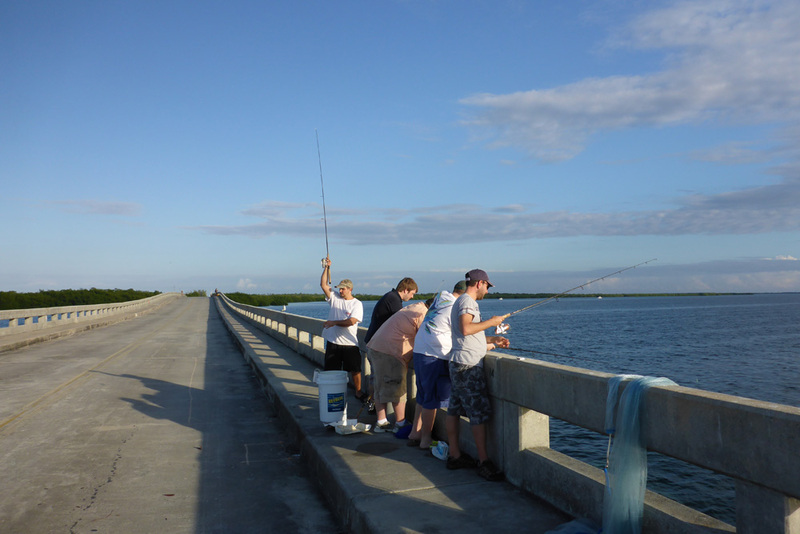 It was the last day and we got the go ahead to drive to Stock Island in the Florida Keys. 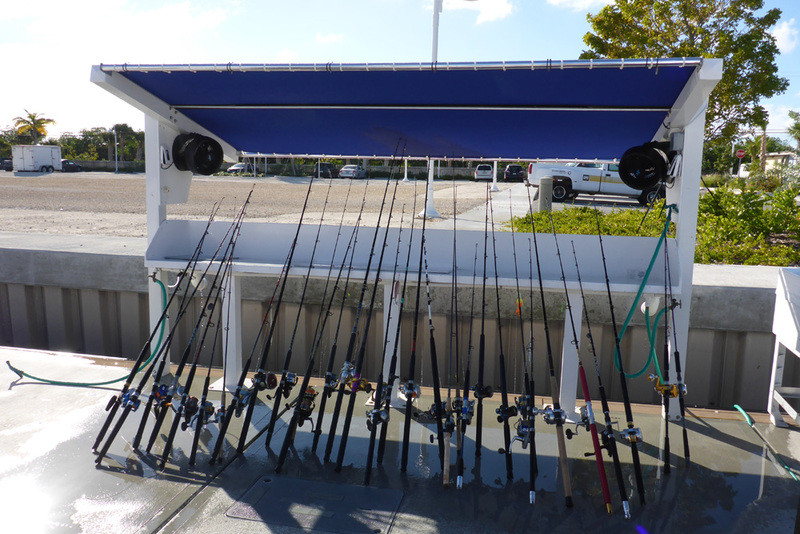 I had to leave some gear behind as this boat only allows 5 rods per person. 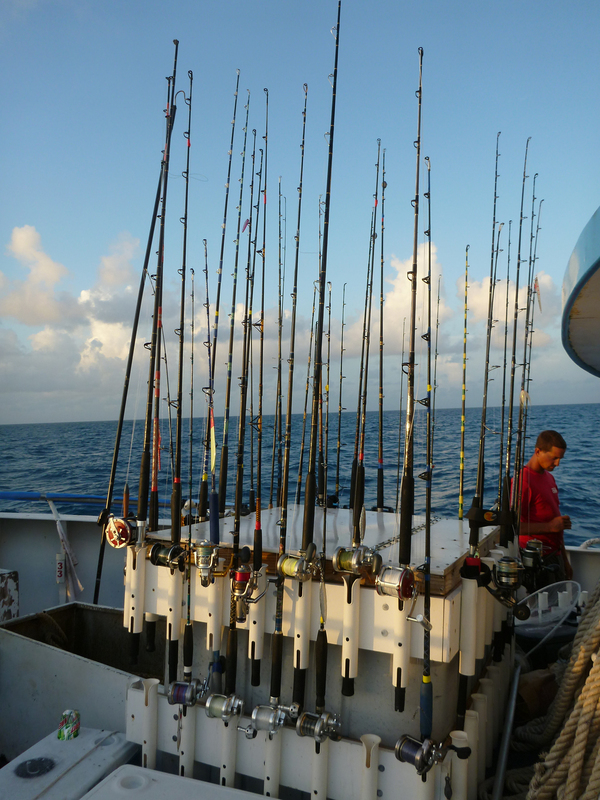 It was tough for me to do so as I like to bring 7 rods with me. 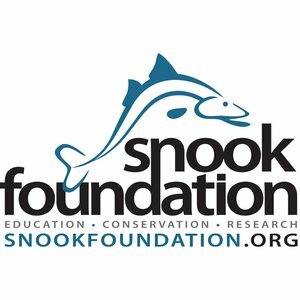 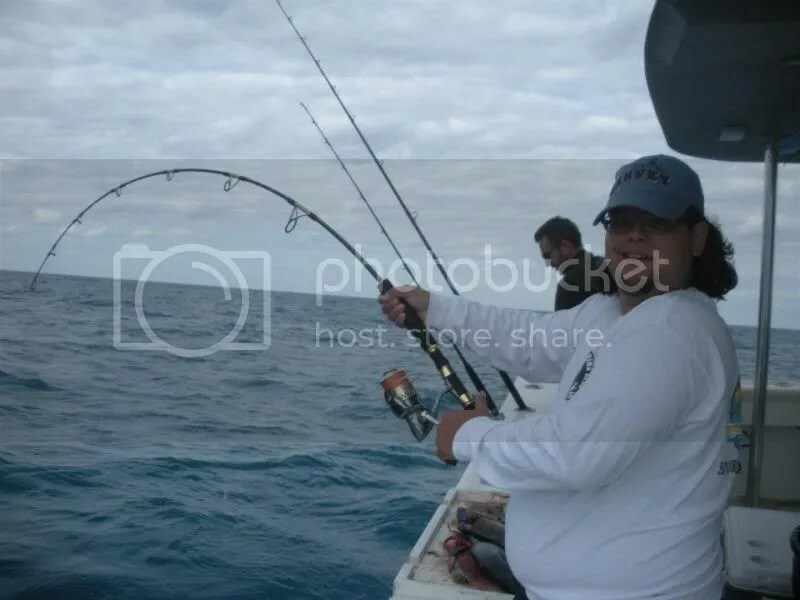 I ended bringing one bottom rod, 2 jigging rods, a top water rod that could double as a jigging rod, and a bait rod to catch gogs and Yellow Tail Snappers. 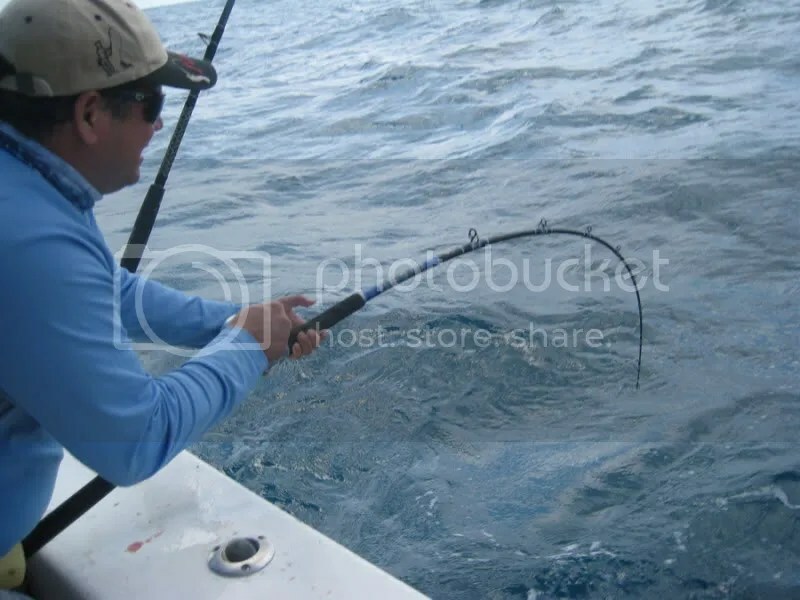 I also brought a YO-YO reel just in case. 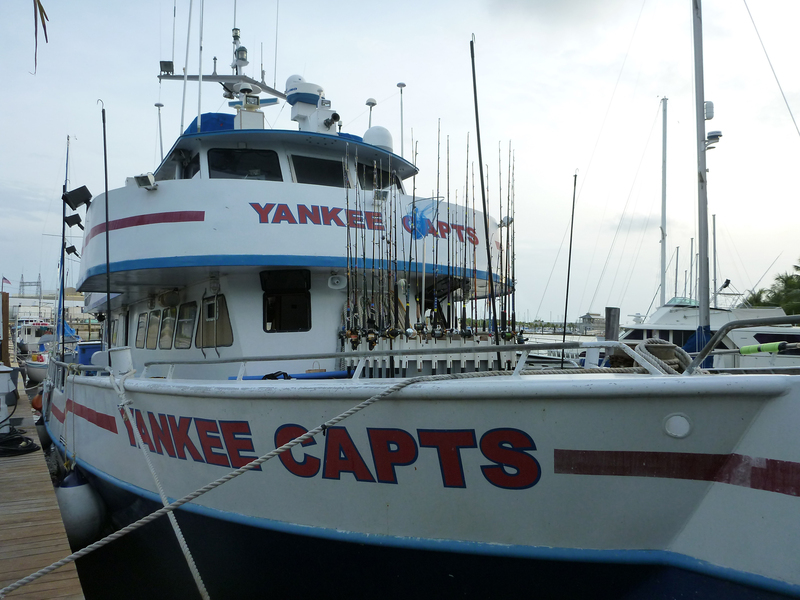 On the way we were notified that Captain Yury was on a hunting trip and Captain Shane Leonard was to be our Captain for this trip. 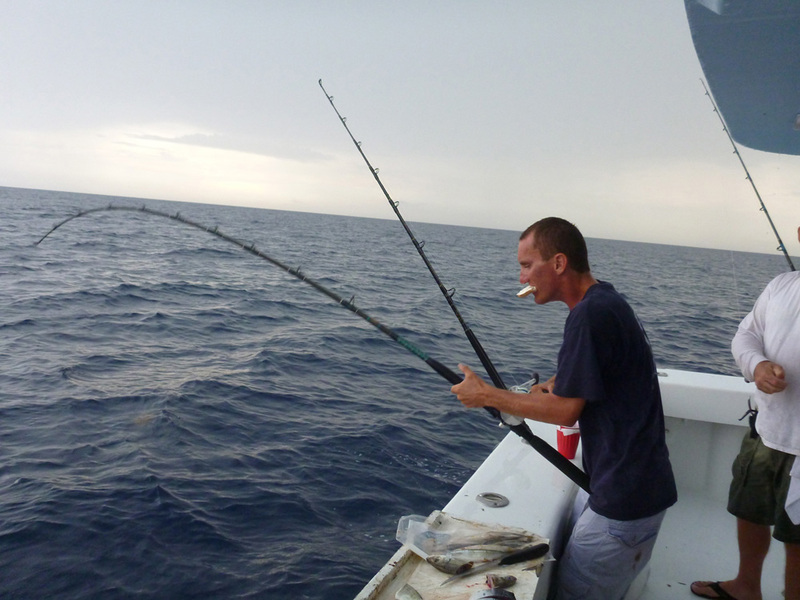 Most of us had fished with him three times before so I had no worries. 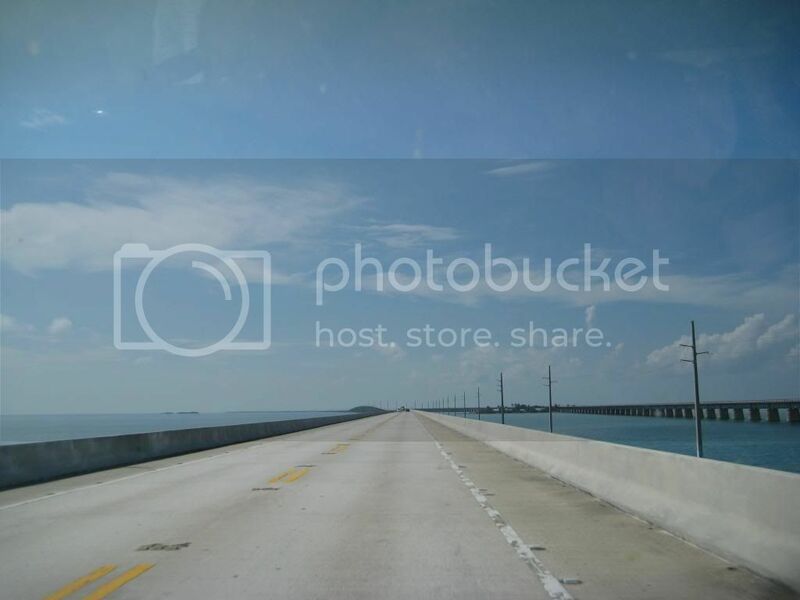 On the way to the boat. 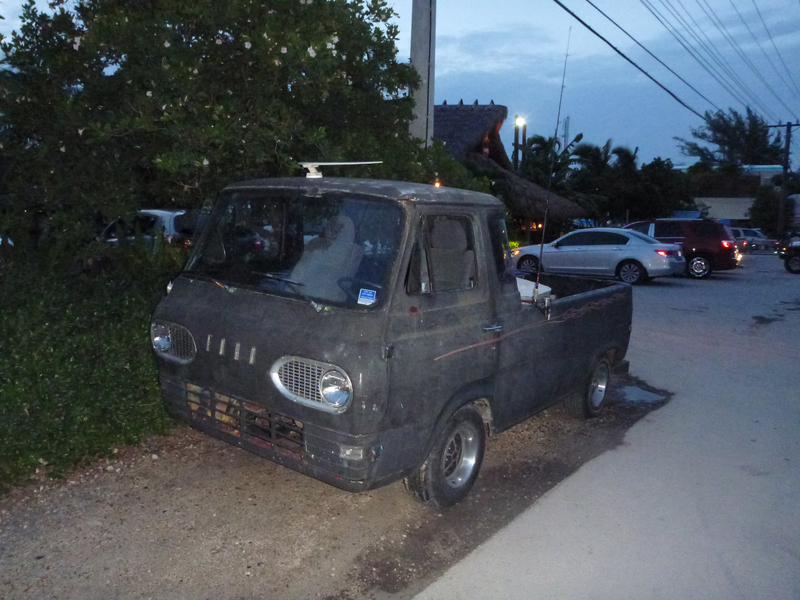 I picked up Nilson for the drive down to the Keys. 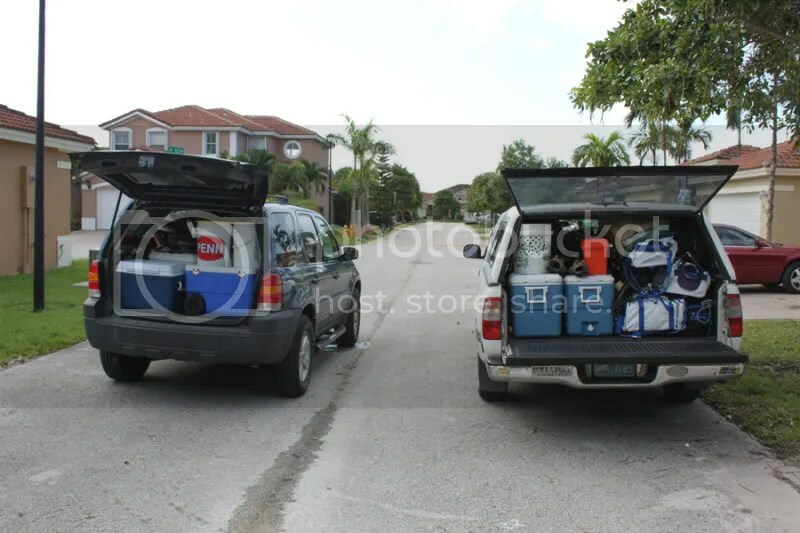 We played Tetris with our gear and coolers to get everything in the back of my Scion XB box car. We did it and did not leave anything behind. 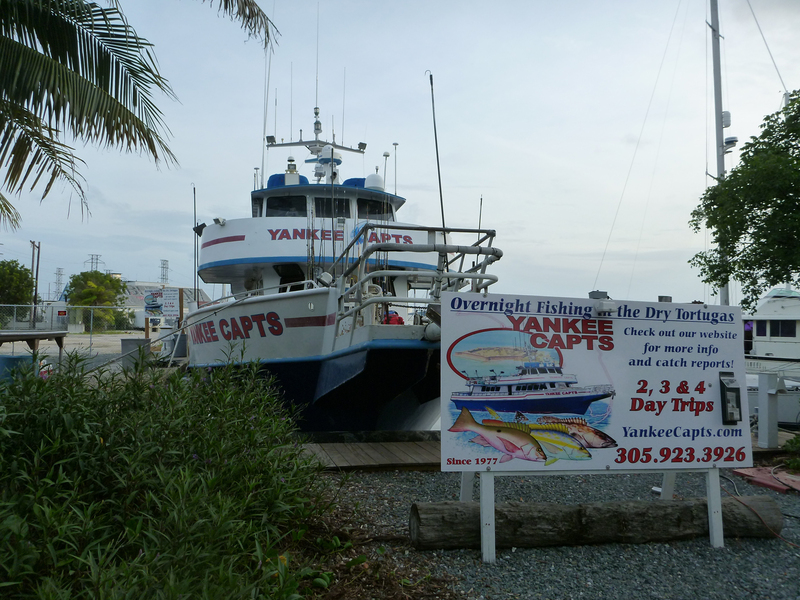 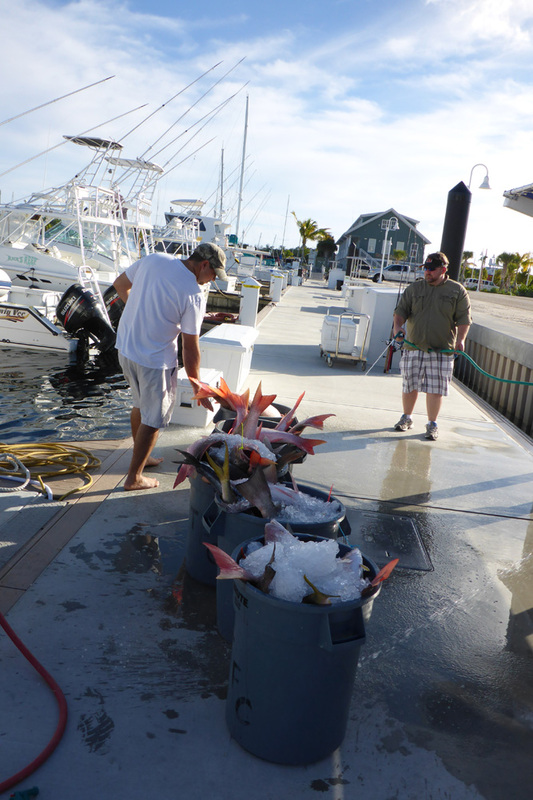 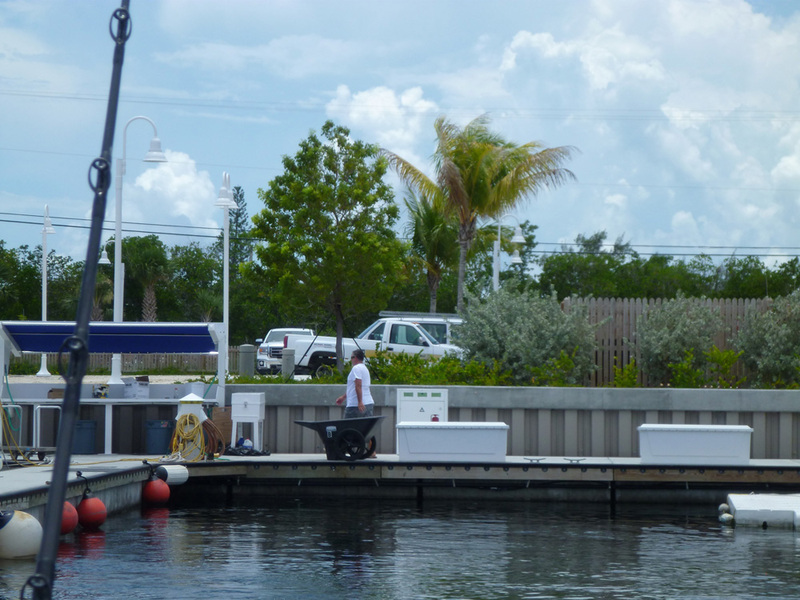 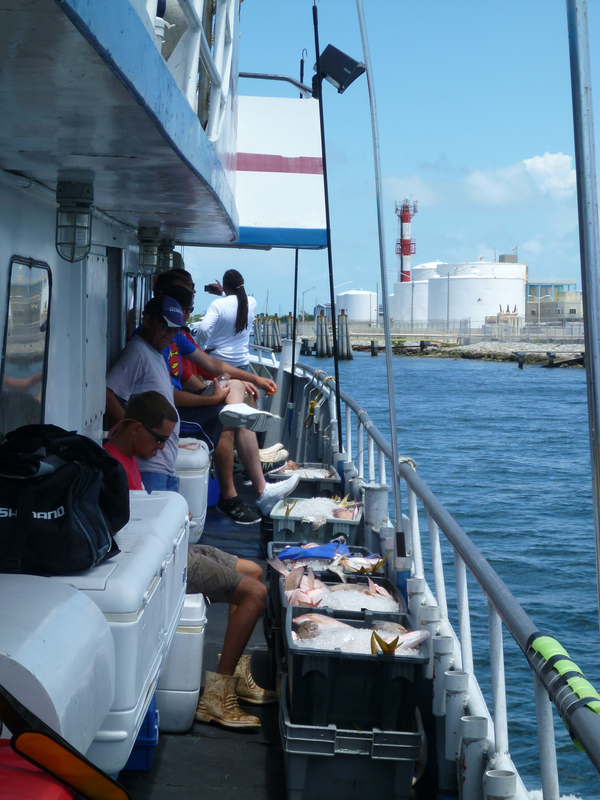 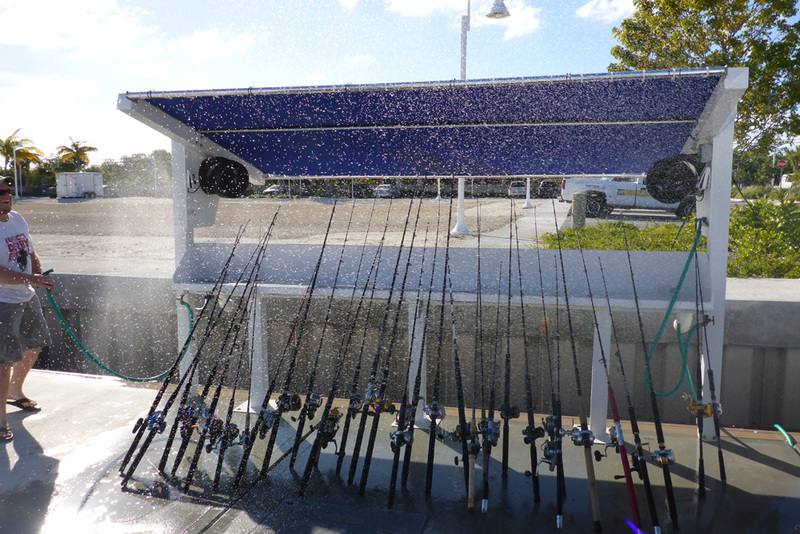 On we went for a few bait stops so we stopped at Key Largo Fisheries for some fresh ballyhoo, but they had none so while we were there we went over our memory list of things needed and of course we forgot a few things. 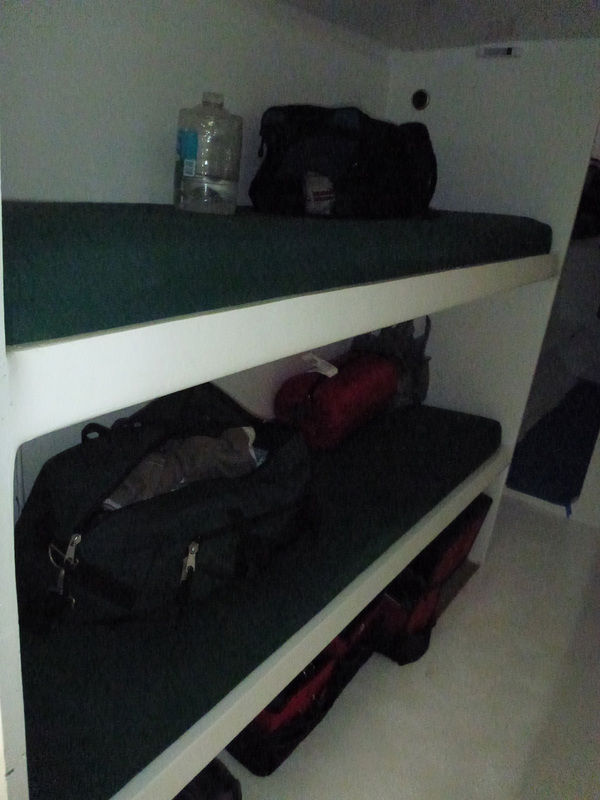 Towels, toothpaste, and soap, need to take at least one shower on this kind of trip you know plus you do need to brush your teeth everyday day. 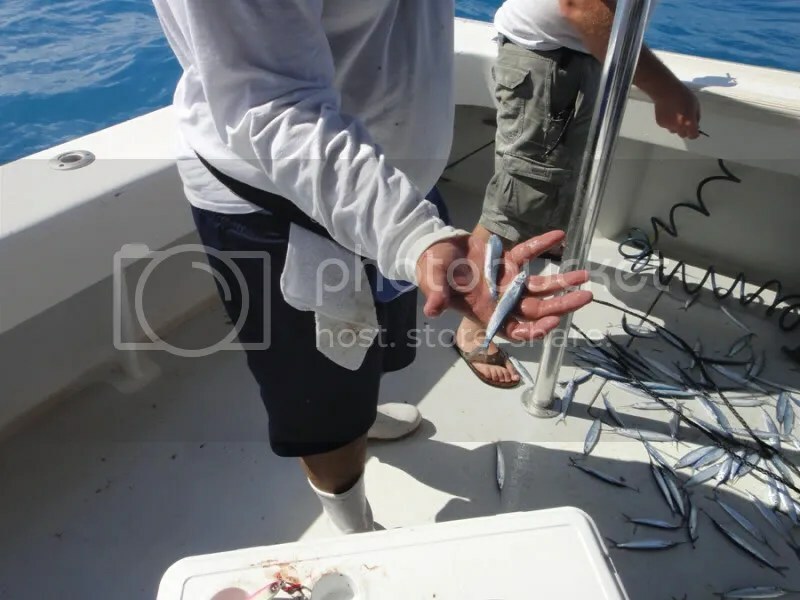 After getting that plus a few unneeded things like chocolate bars we went on the way to catch some bait. 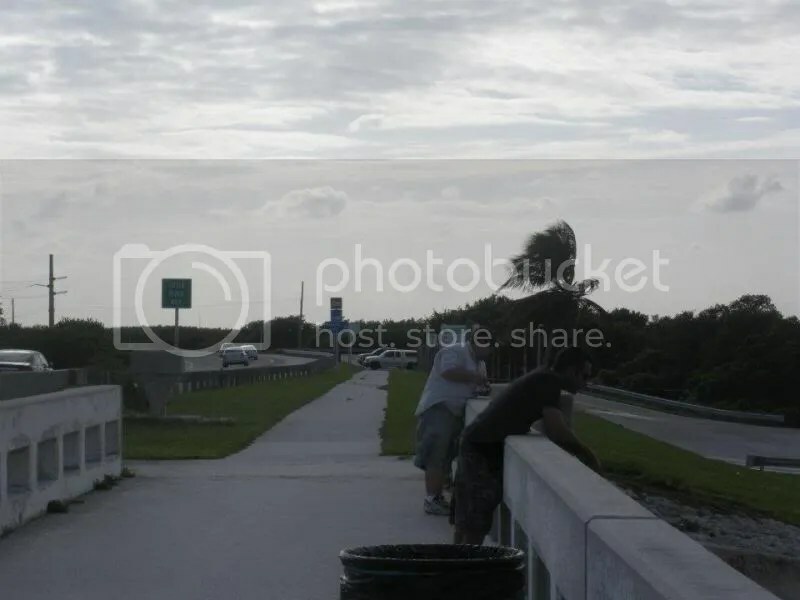 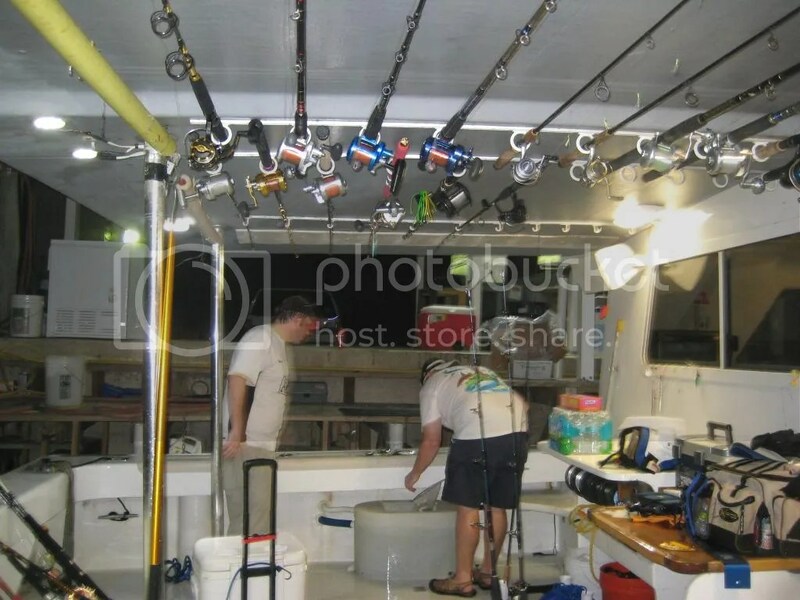 This time to the well known not a secret spot No Name Key where the boys loaded a 15 gallon bucket with live pinfish and prayed they made the journey to the boat. 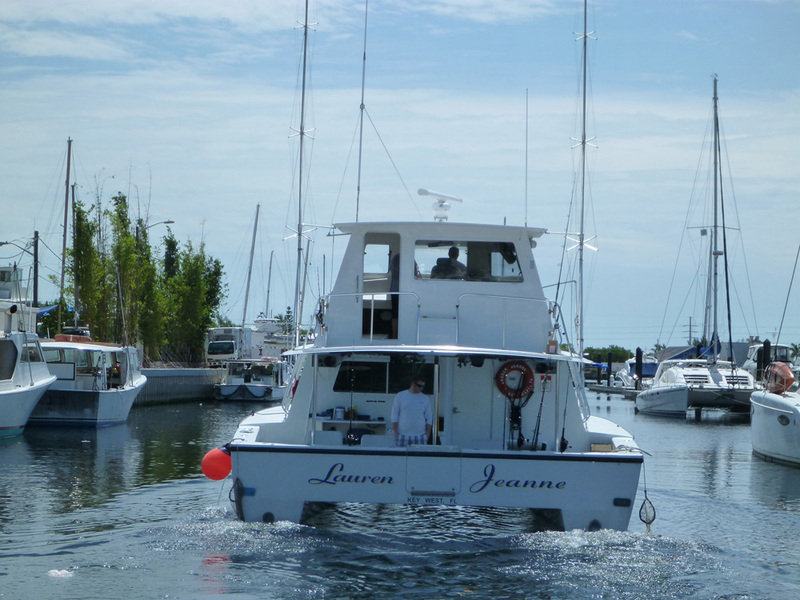 Well, we got to the boat and had to wait for Stevie the Wonder to finish cleaning it. 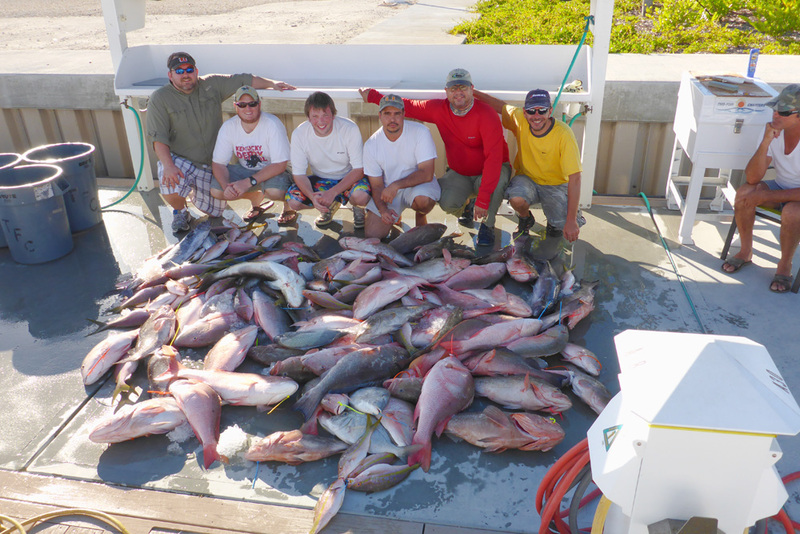 We let the boat dry out a bit and loaded our gear in it. 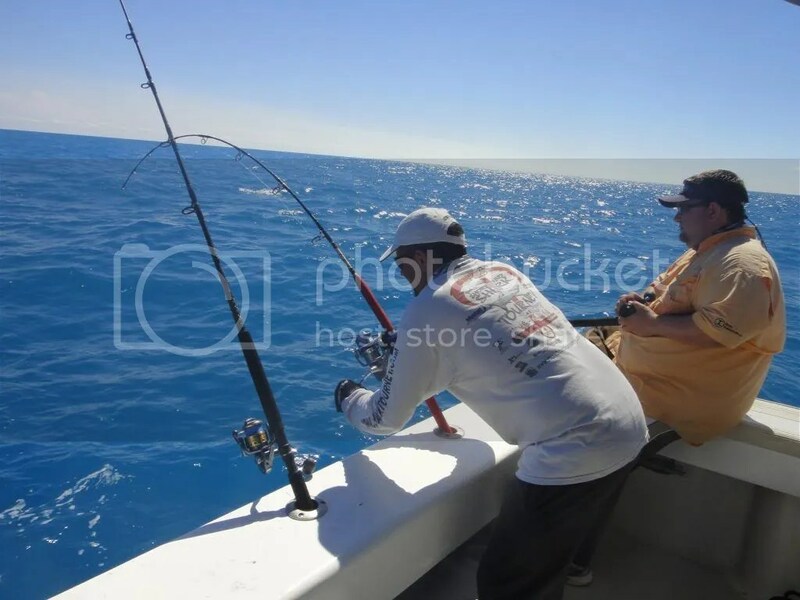 As we were waiting just about all of us had good hope for a good fishing trip as we stared at the fileted fished in a cart. 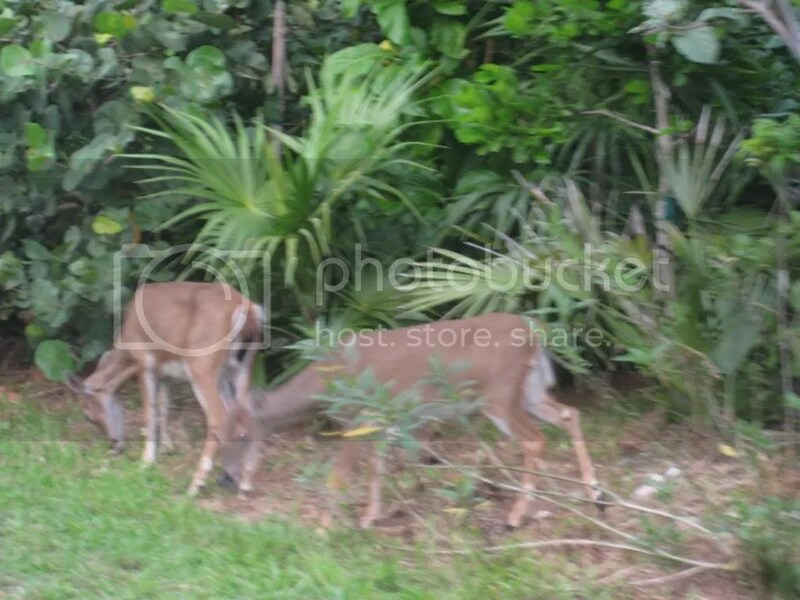 These were from the trip before us. 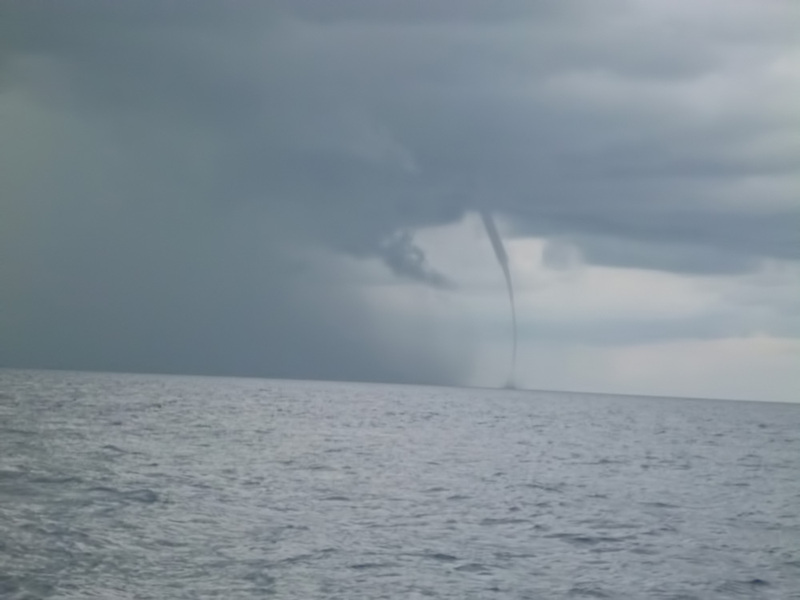 Looked like a nice load. 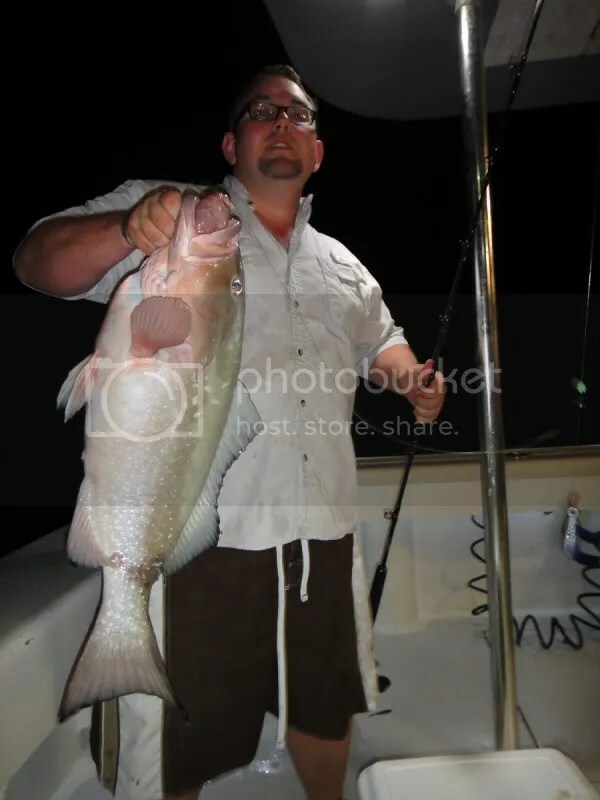 Things started slowly with me getting a small Cobia on bait. 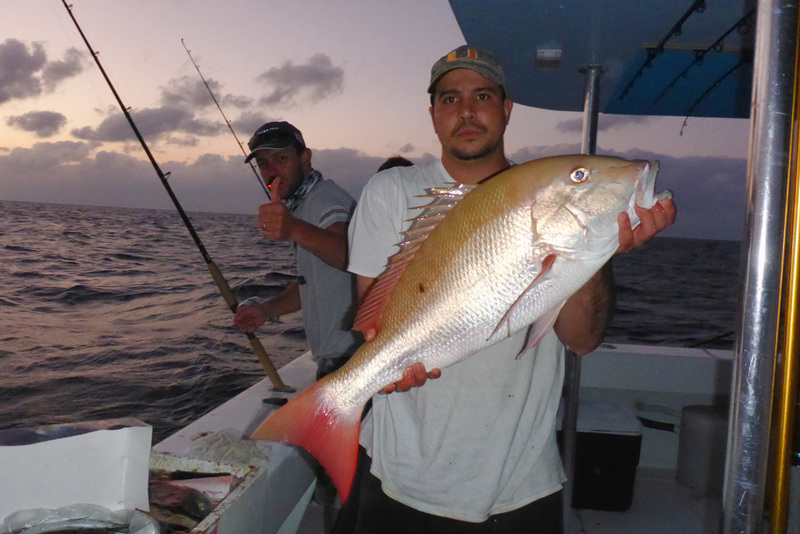 Robert started with the mutton snappers by nailing a decent size one then Rory put a bigger one in the box. 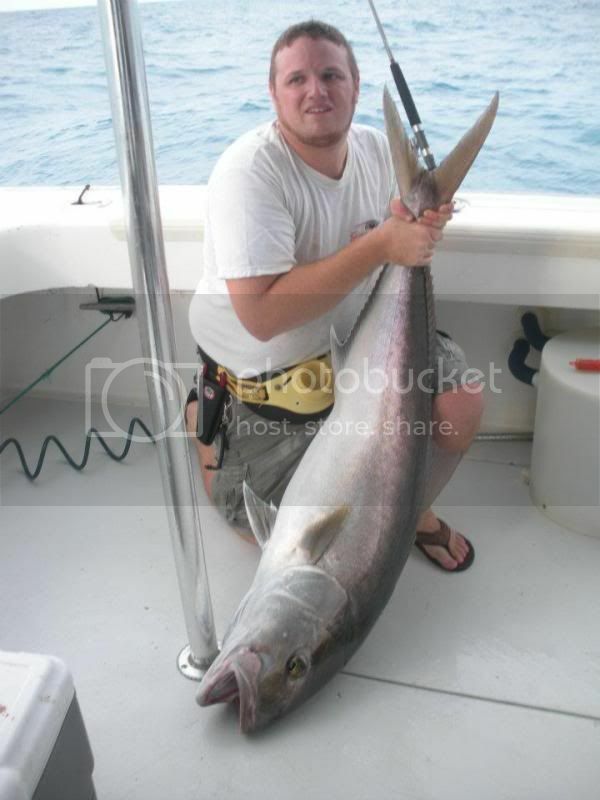 A bit later I switched to a jig and then got another small cobia, and then another. 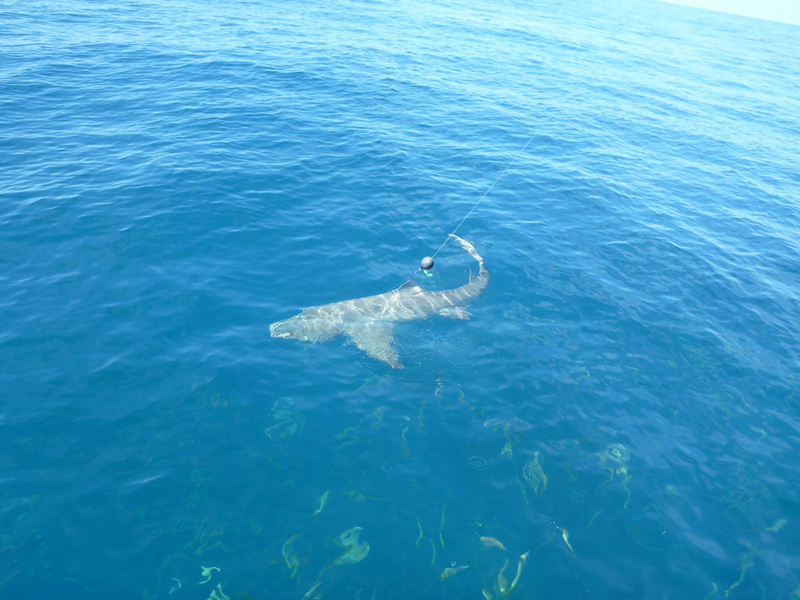 I thought there might just be one out there that was of size but there was no luck for me. 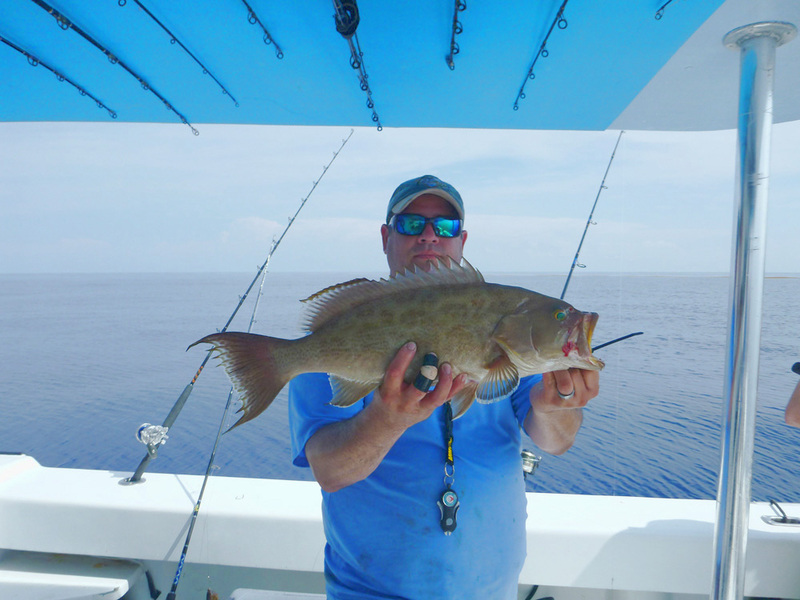 I started jigging and was able to connect with a Red Grouper a story that would repeat over and over for about 20 times. 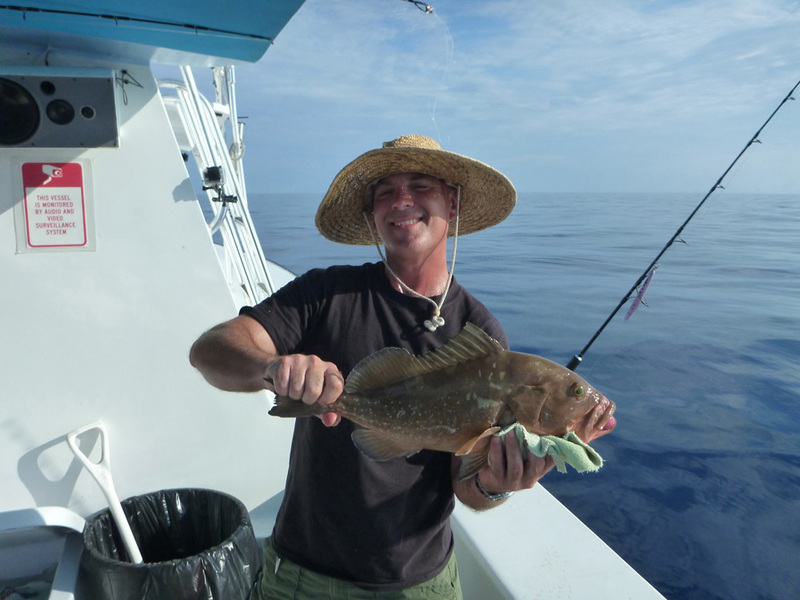 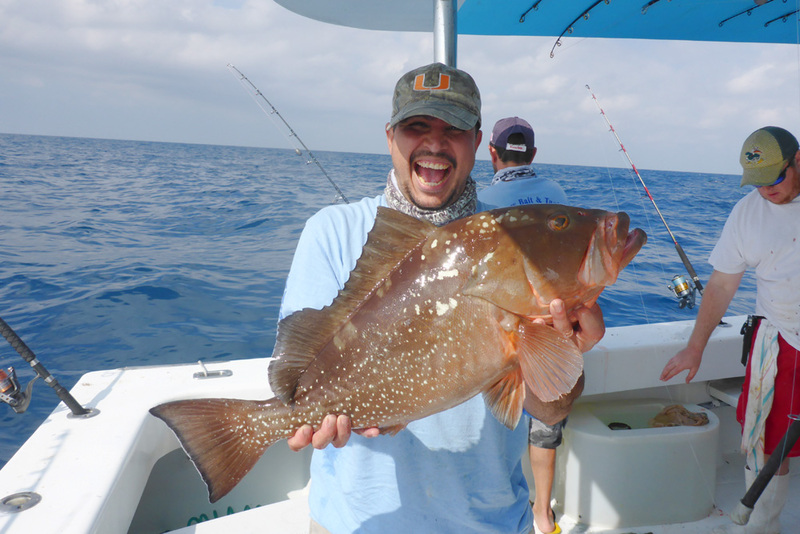 On this trip the Red Groupers seemed to like jigs slowly moved near the bottom. 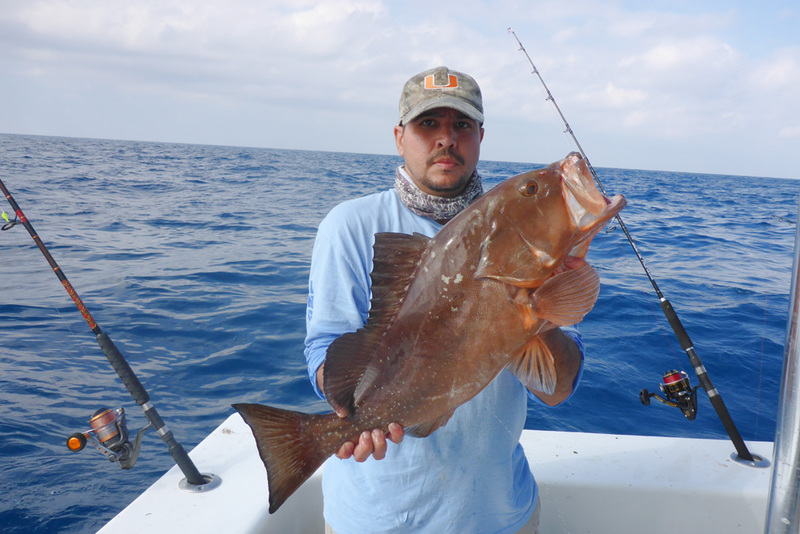 Below is a Red Grouper on a Supplex jig. 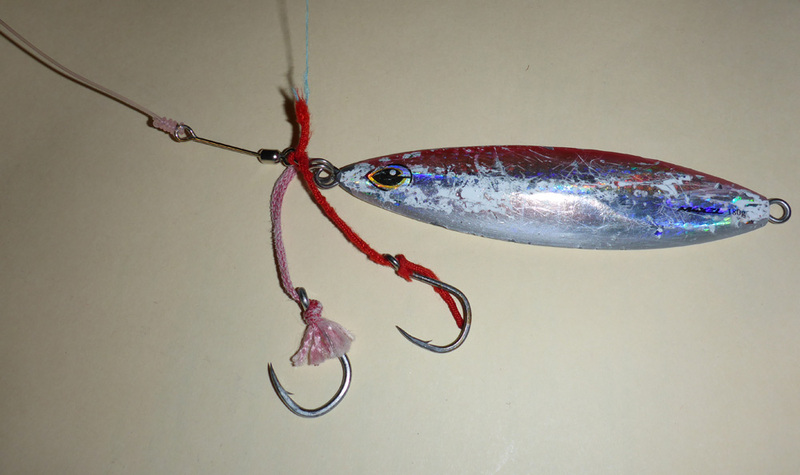 Next I got a porgie on the same Supplex jig. 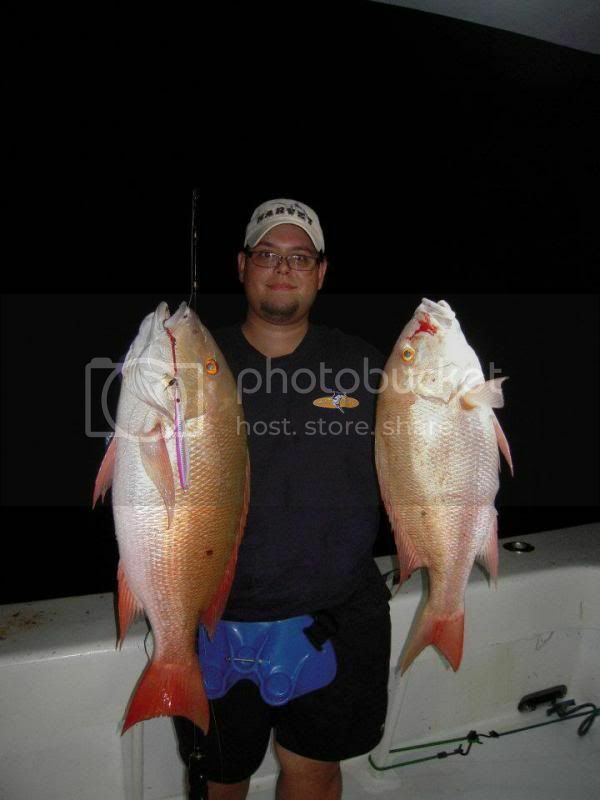 Rory was onto the Mutton Snappers with live bait. 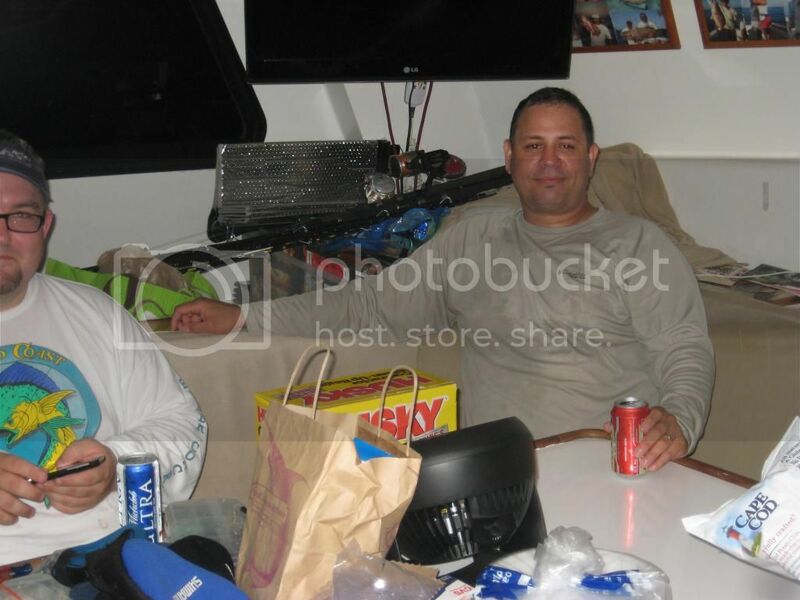 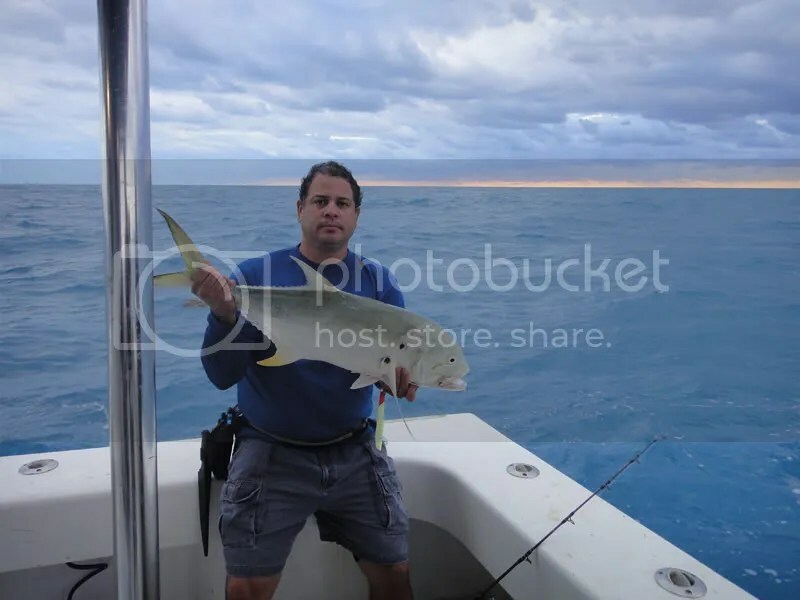 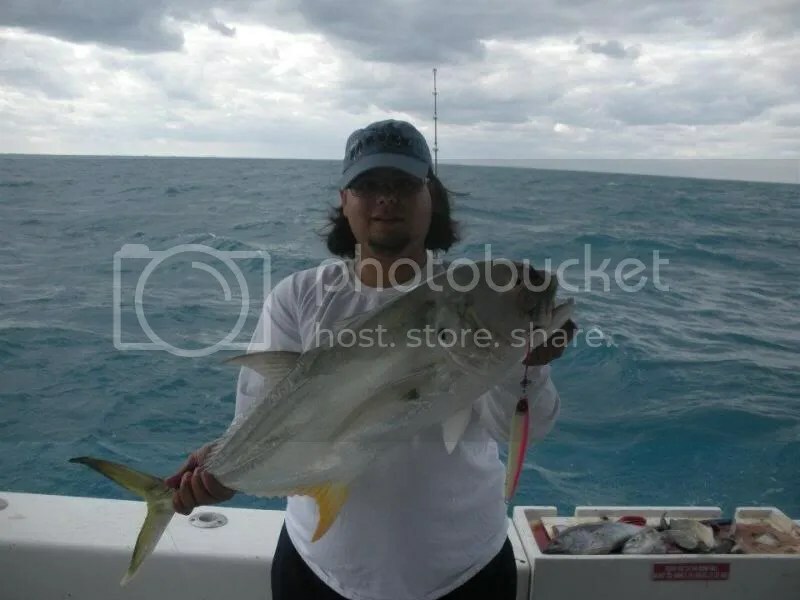 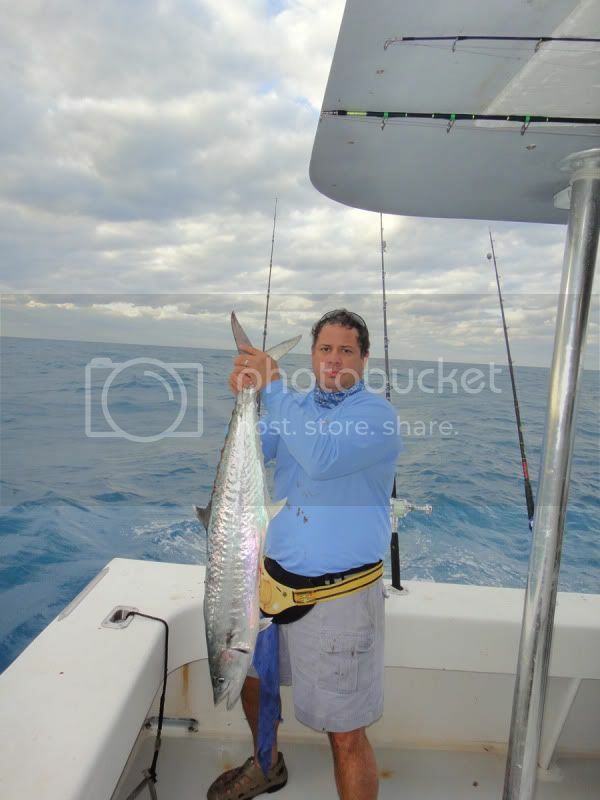 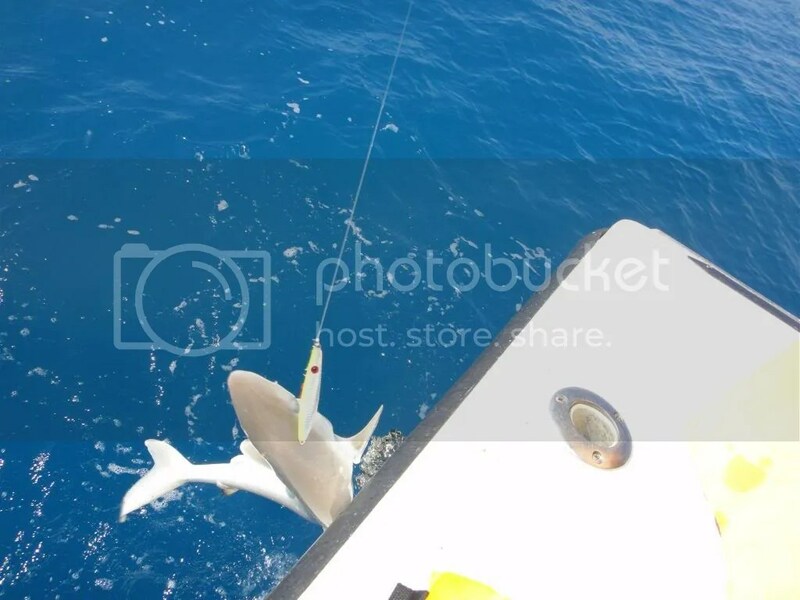 When he decided to jig a shark came up and claimed it’s Dry Tortugas taxes. 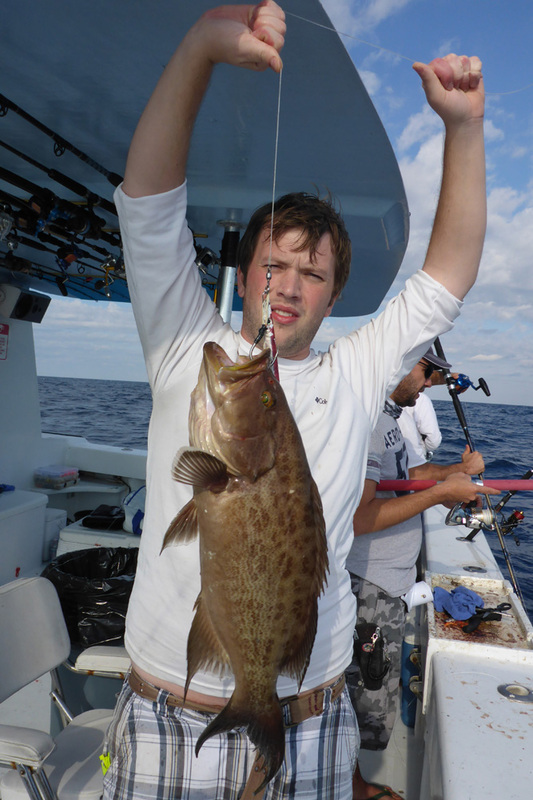 Adam got this nice Scamp Grouper on a vertical jig. 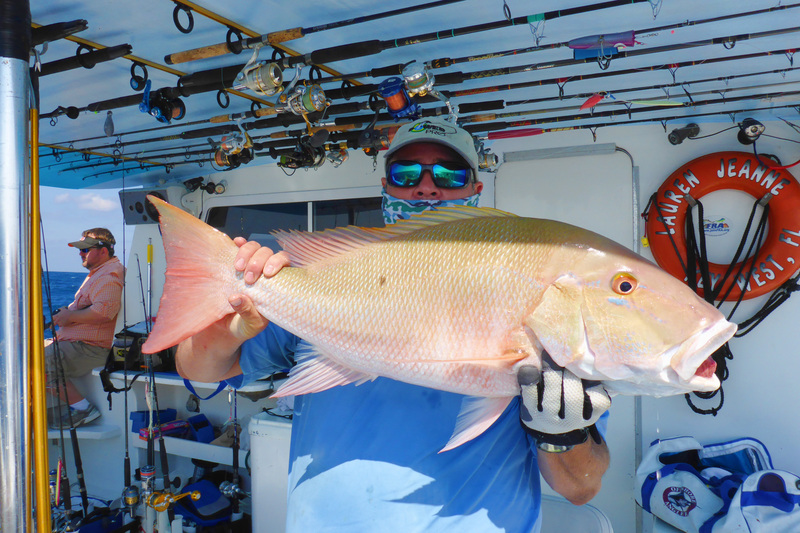 At noon I took a rest from the jigs and used a live bait to get this nice 12 pound Mutton Snapper. 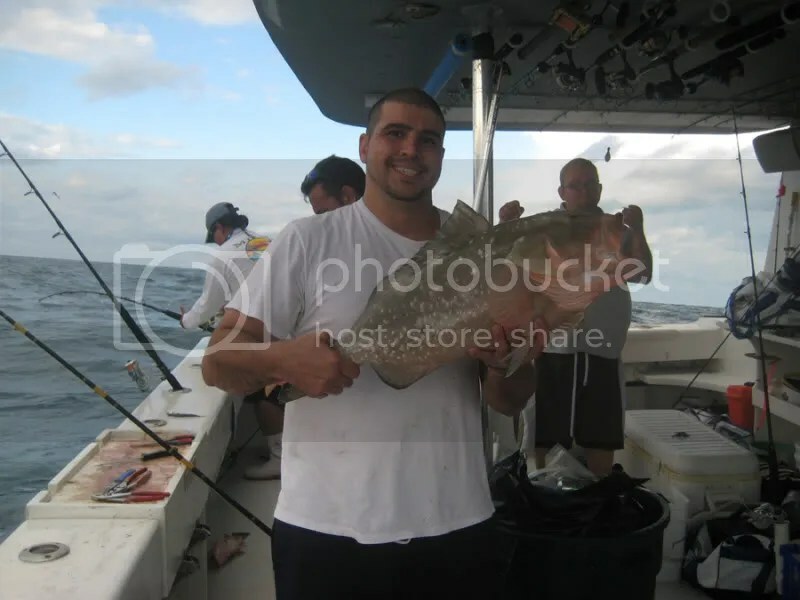 Shortly after at 1:15 pm I got another beauty of 12 pounds as well. 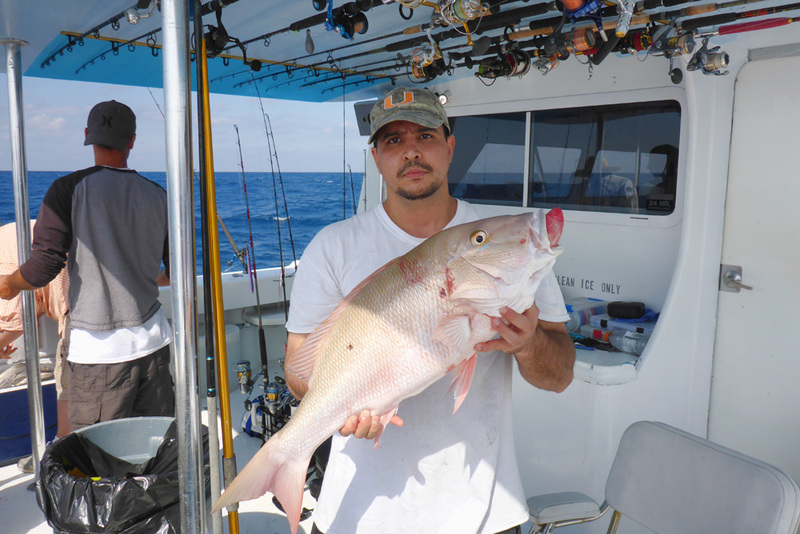 Nilson joined us and got his Mutton Snapper. 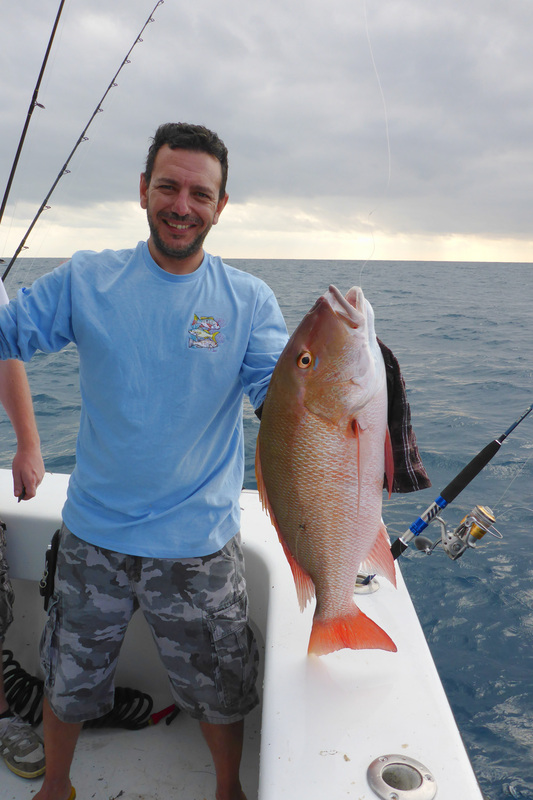 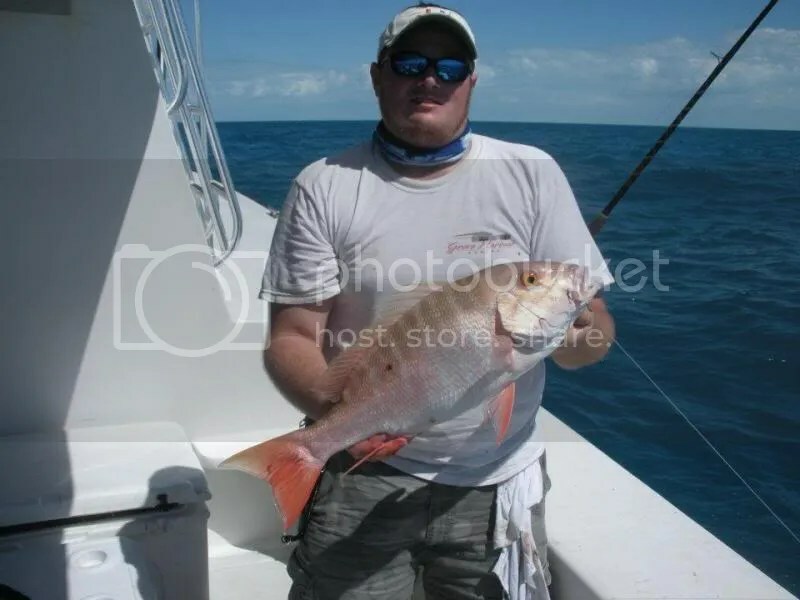 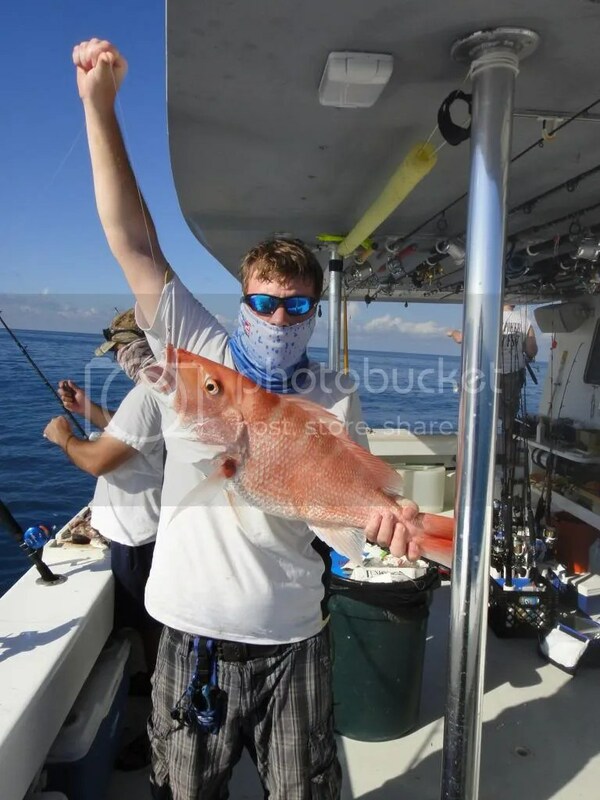 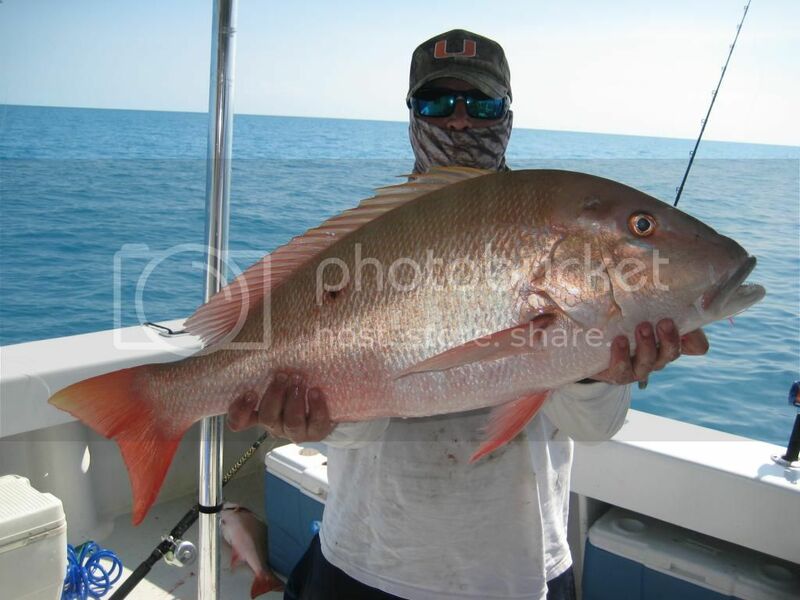 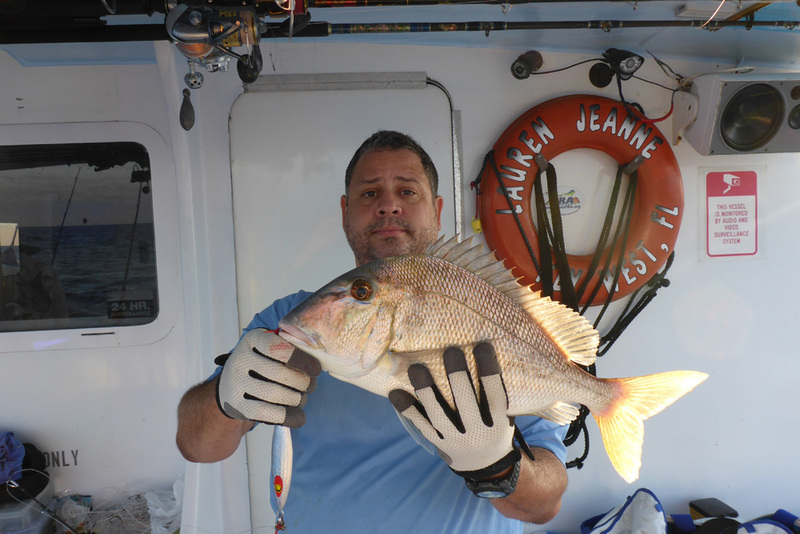 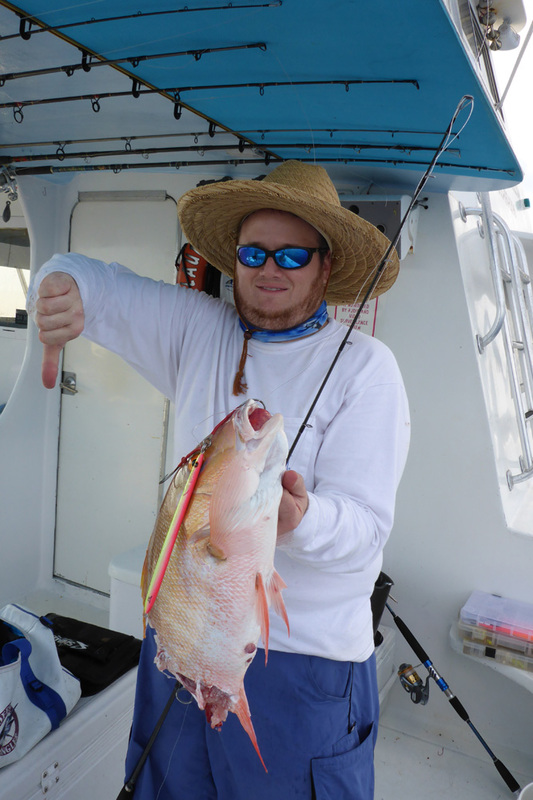 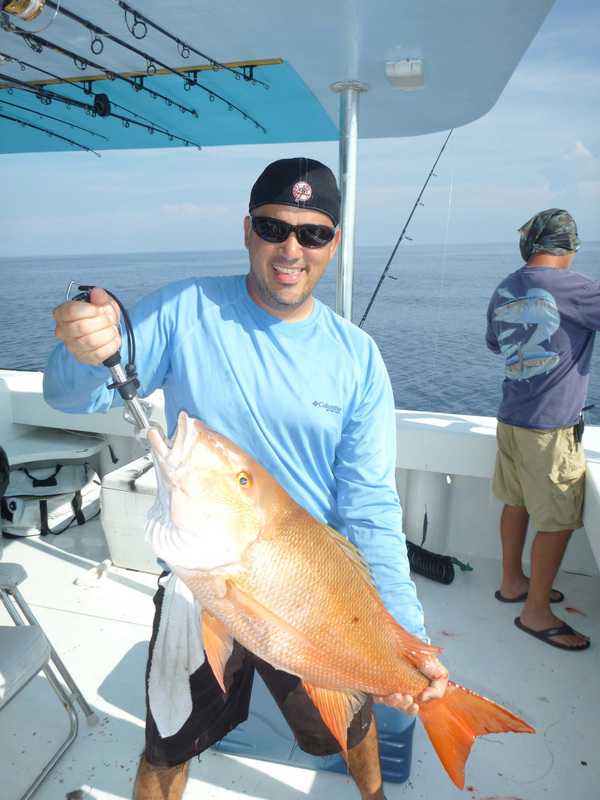 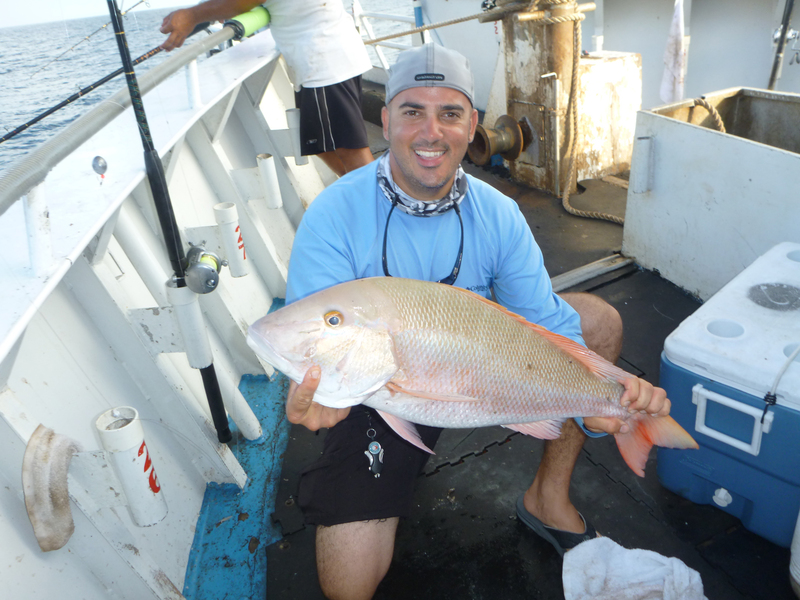 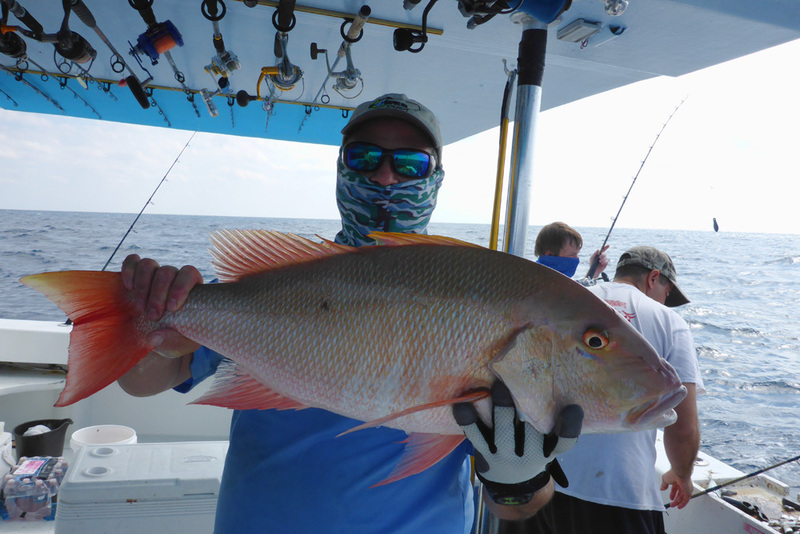 Adam went back to bait and landed his Mutton Snapper. 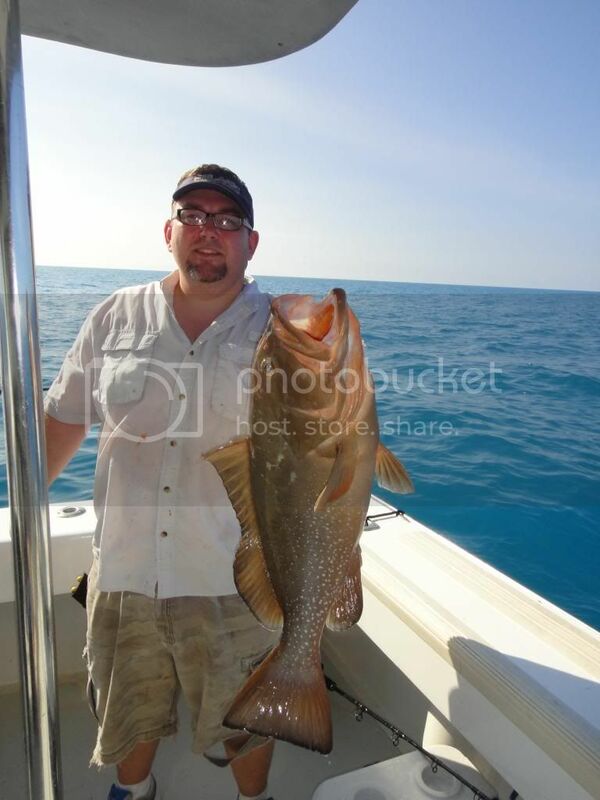 I decided to go back to jigging and landed a nice Red Grouper. 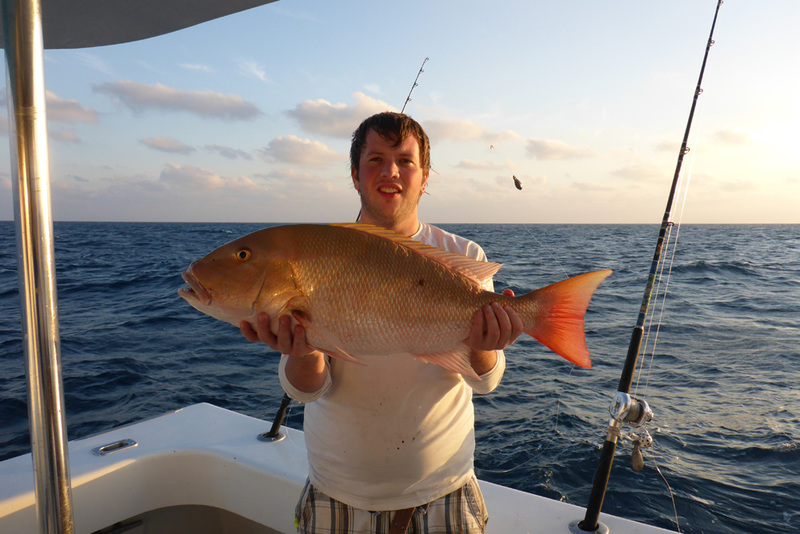 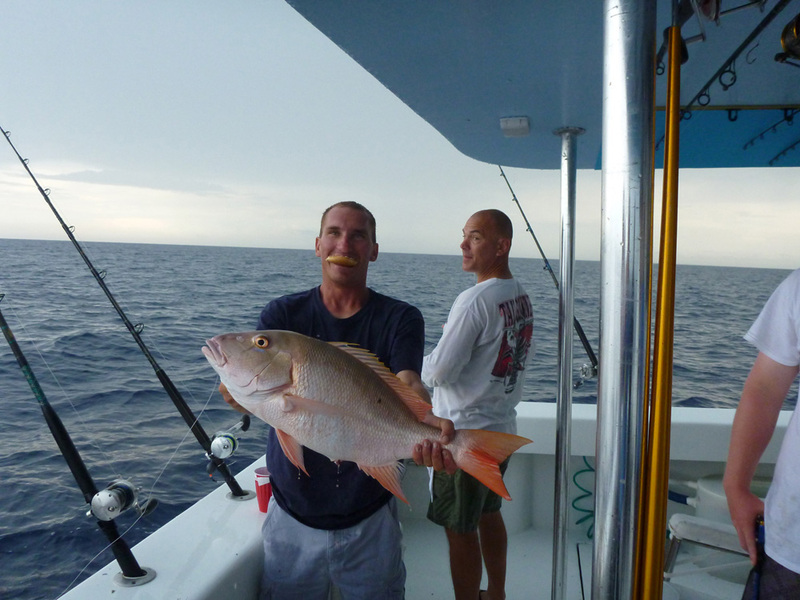 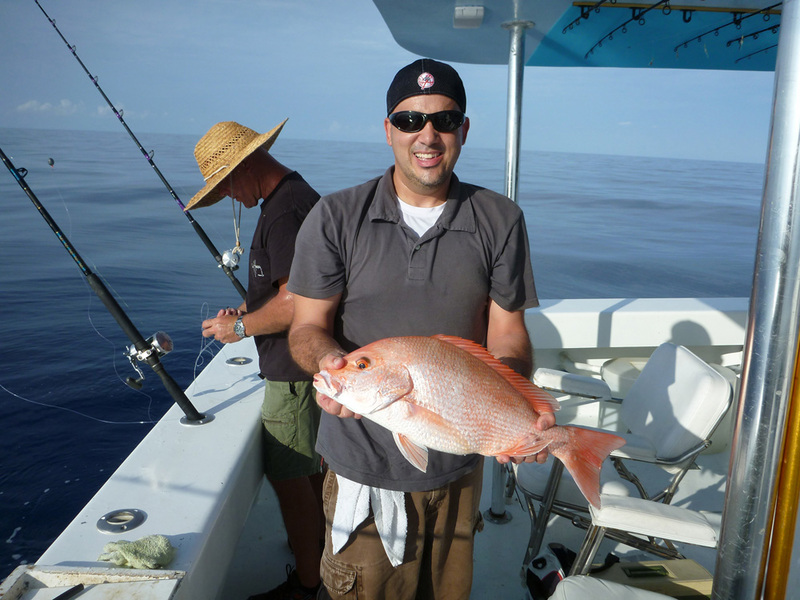 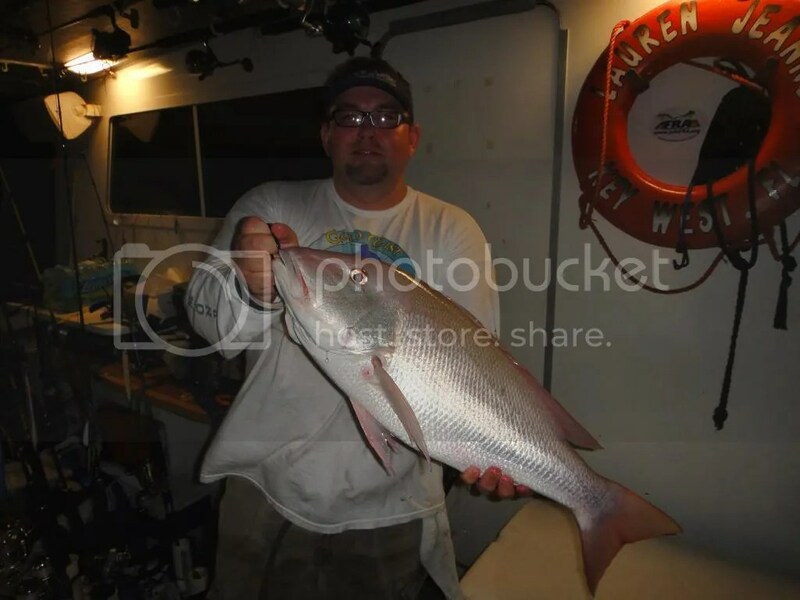 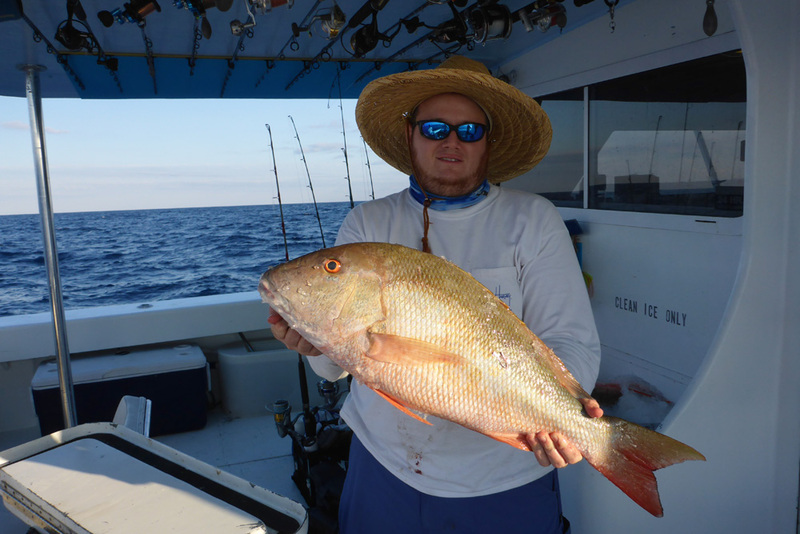 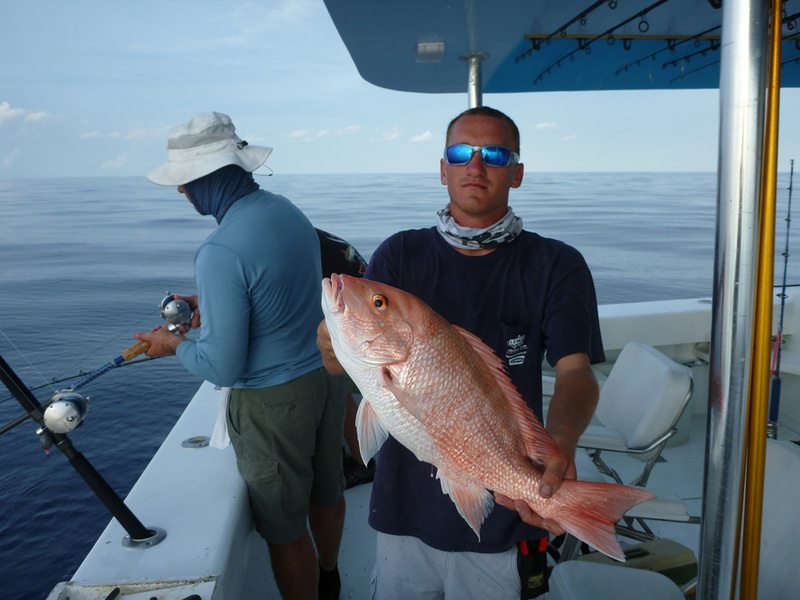 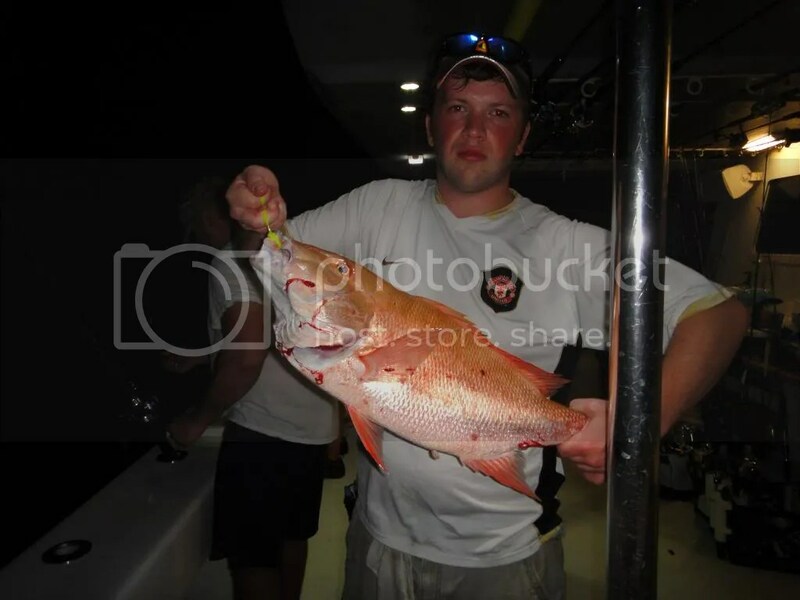 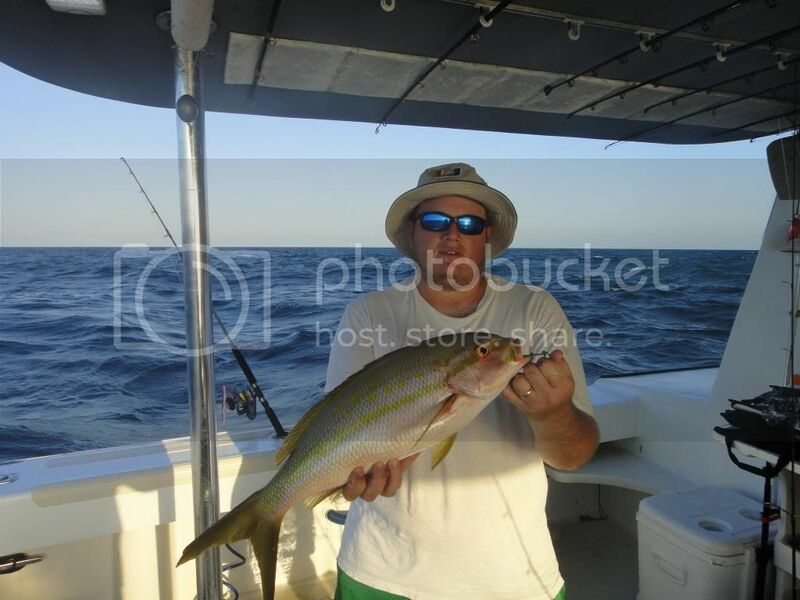 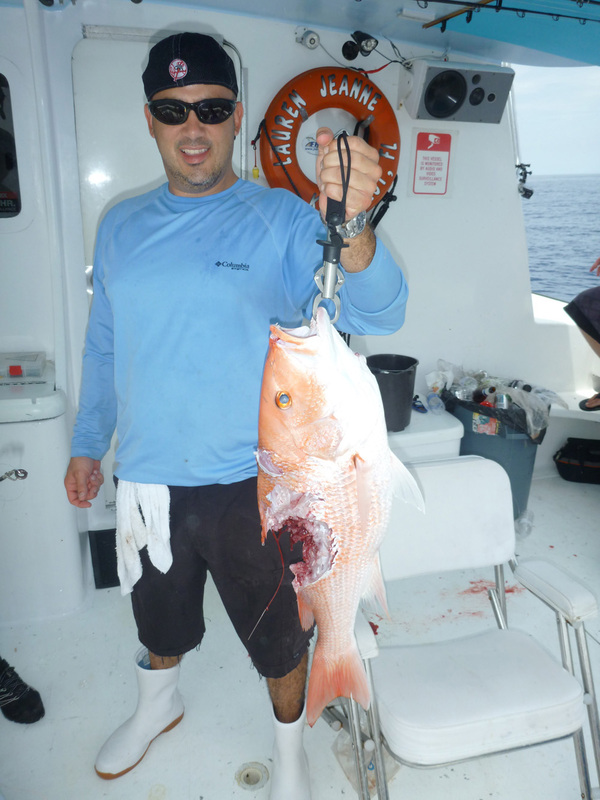 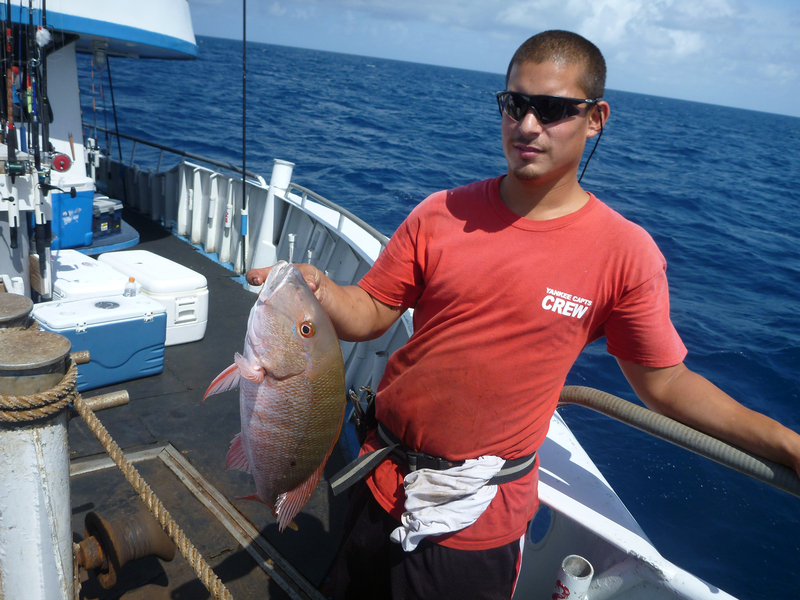 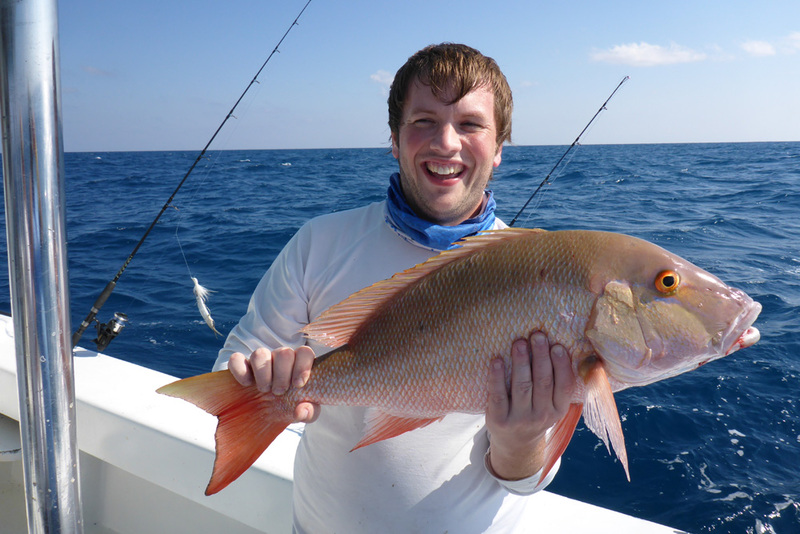 Adam kept on bait fishing and landed the biggest mutton of the trip, a 14.5 or so Mutton Snapper. 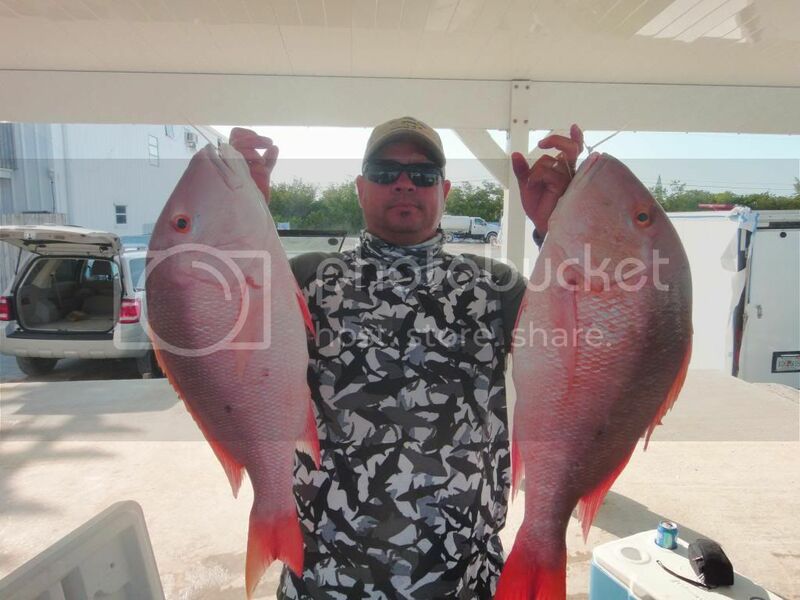 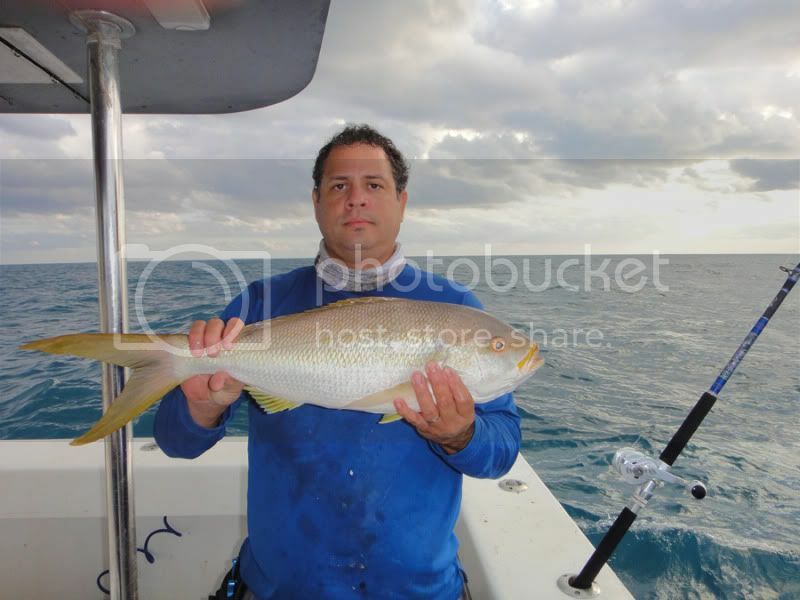 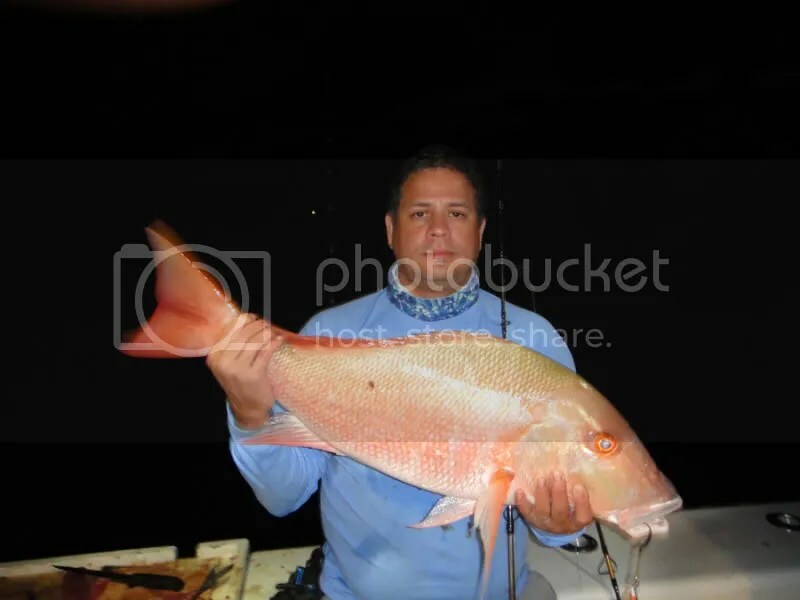 Nilson went on and also got a 14 pound Mutton Snapper. 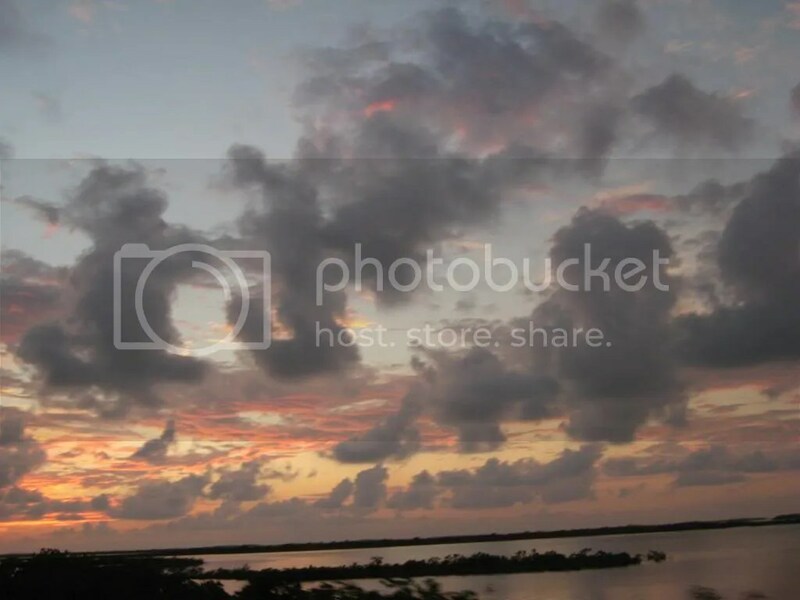 Night time came by and I do not know what happened, I fell as sleep. 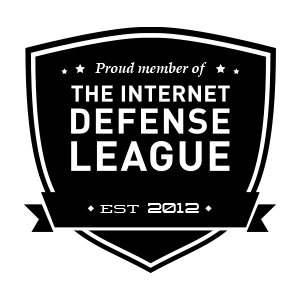 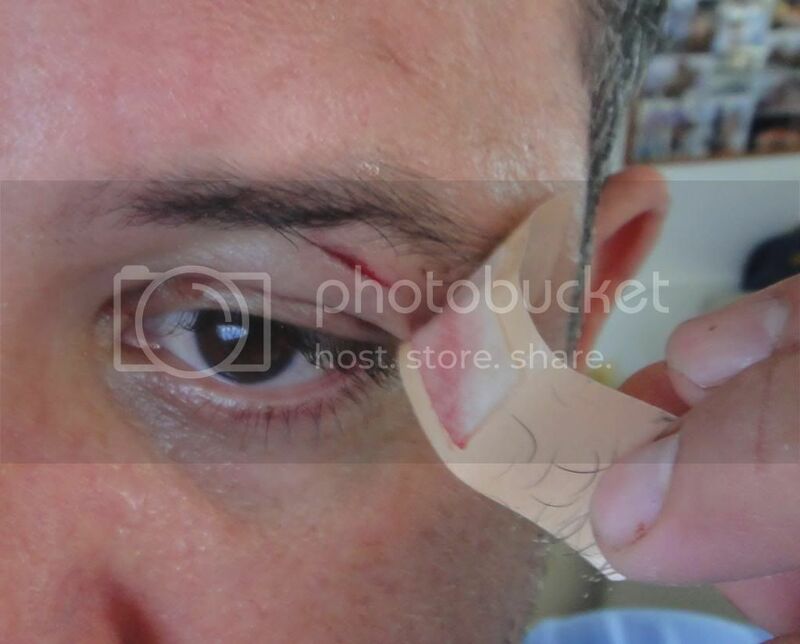 Yes I did! 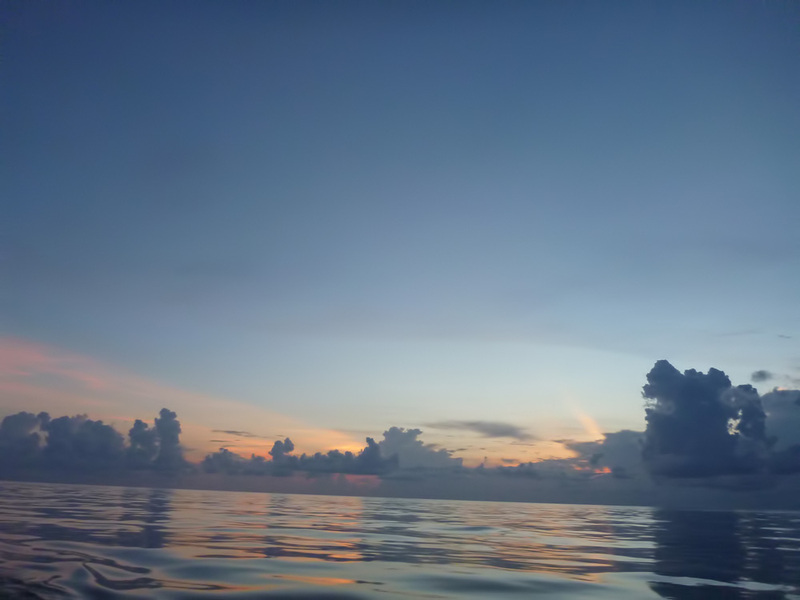 I guess I am getting to that stage in my age where the non exercise couch potatoness is setting in and by 9 pm I start to get sleepy just to wake up at 5:00 am. 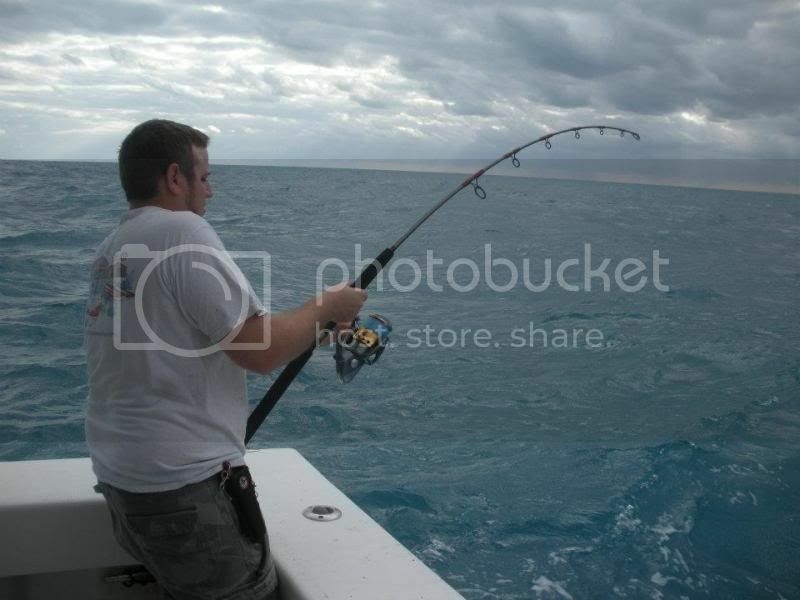 Oh well I missed out on some good fishing, I think. 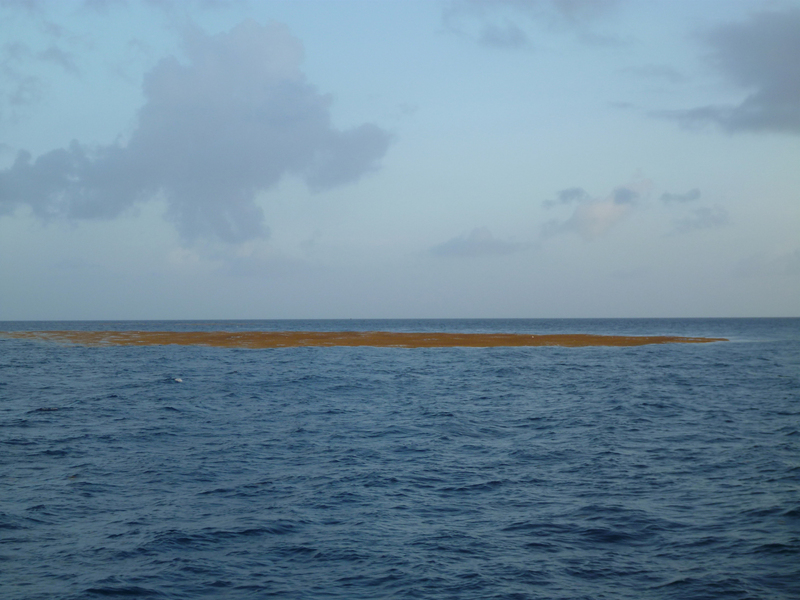 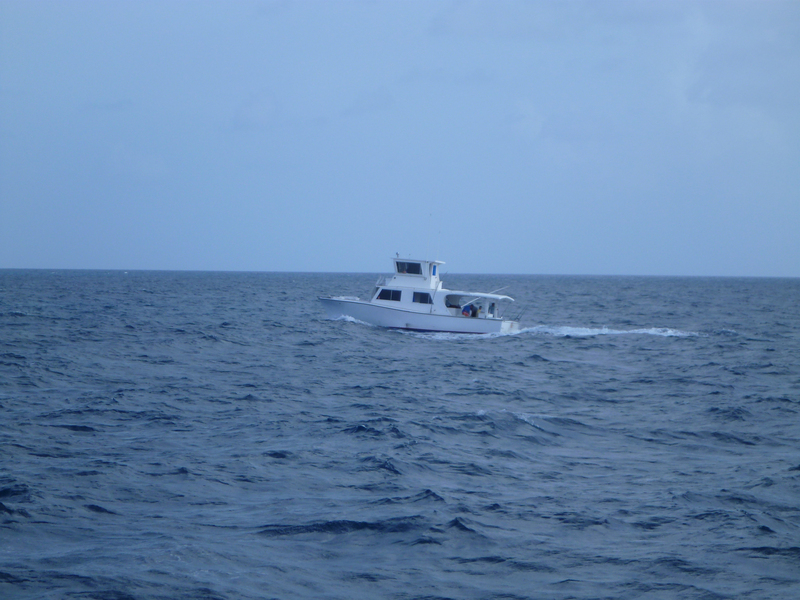 Well, I was told that the seas would be rough so we were to move behind the Fort for cover. 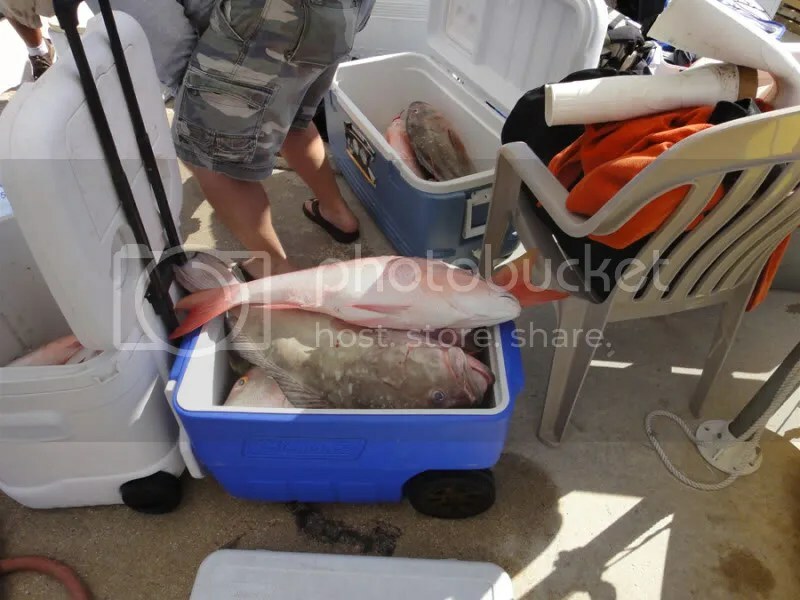 The morning of the 14th things got hotter, we were fishing in shallow water and fishing was hot. 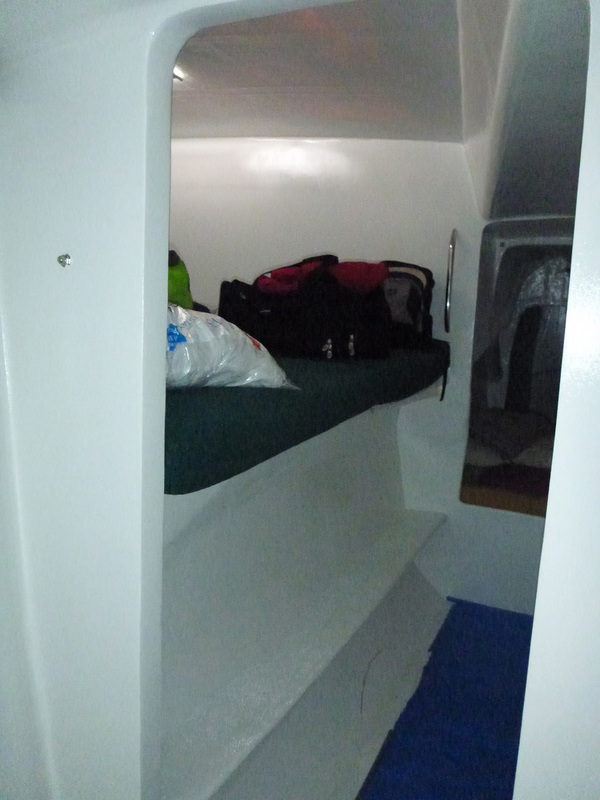 I was glad I slept well and so did others. It was no surprice, I spelt a hell of a lot more than I ever done on a fishing trip. 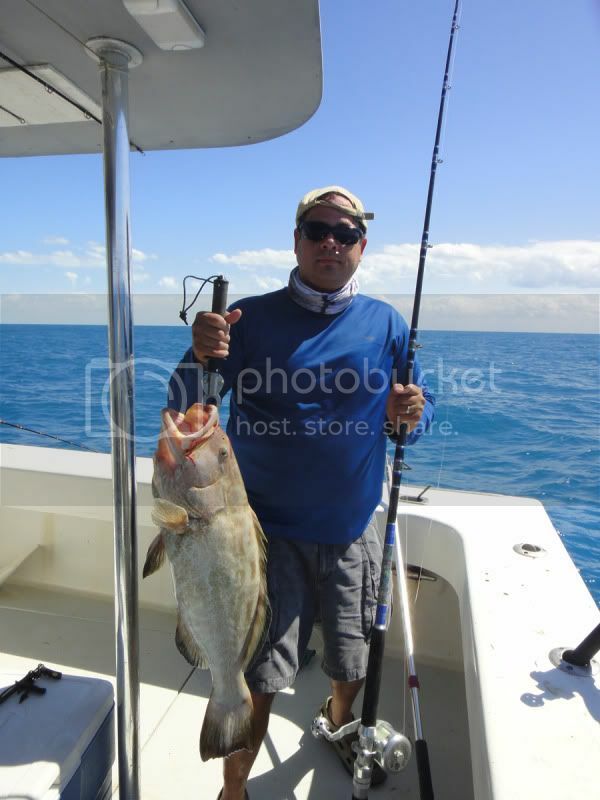 Ricky started into the good fishing by nailing a decent mutton around 8:30 am. 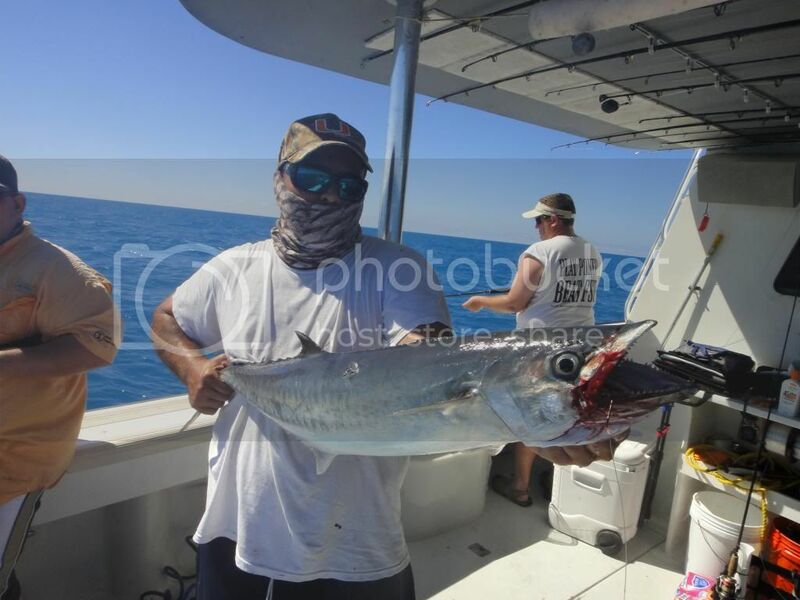 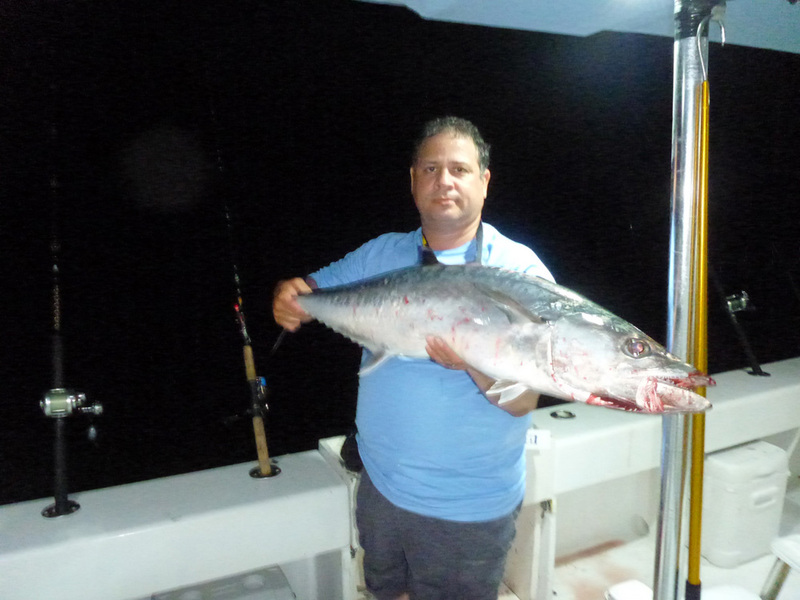 I kept with my jigging and after catching a few more small Red Groupers I lost my Supplex jig to a King Mackerel. 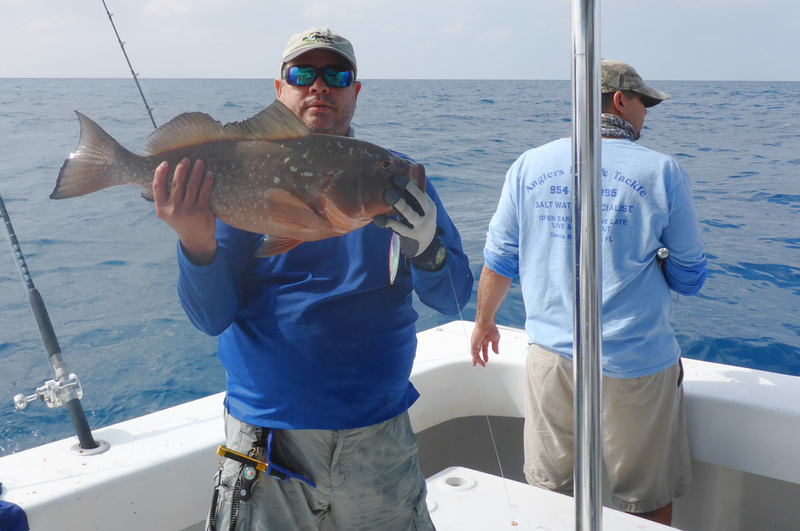 I switched to a Blue Blue jig and at 11:30 am landed this nice Red Grouper. 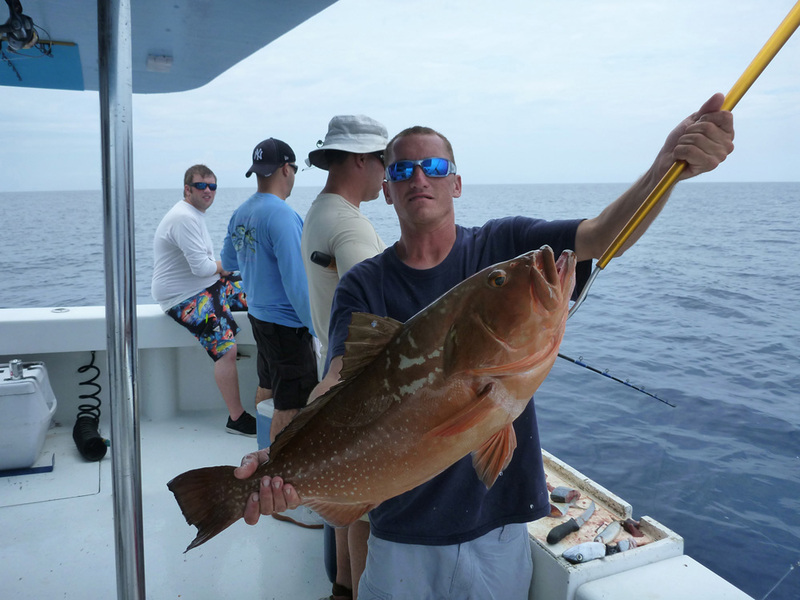 Meanwhile Adam kept with the bait fishing and landed this nice 14 pound Red Grouper. 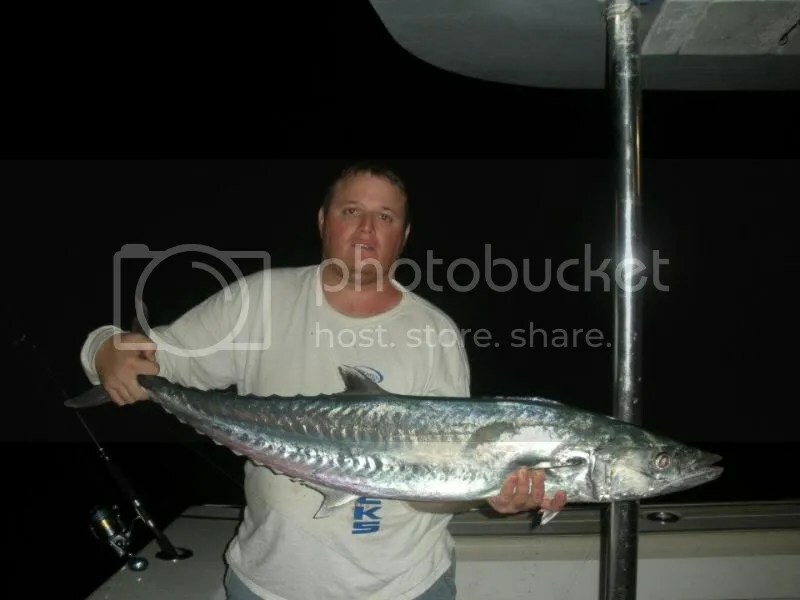 My Blue Blue jig got cut off by another King Mackerel so I switched to a Maxel Dragonfly in 180 grams. The result, another Red Grouper and this time it was a double header as Adam got one a minute later with live bait. 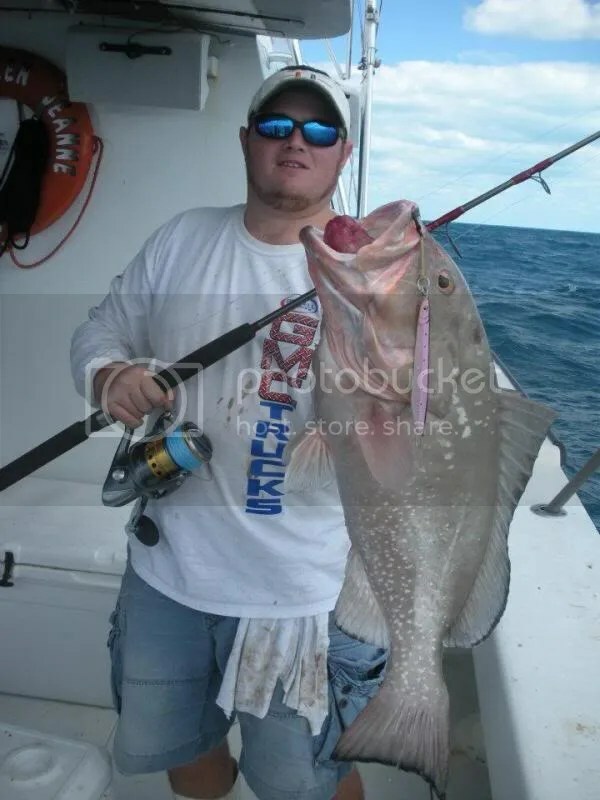 The above grouper was a stubborn one and rocked me, I managed to get it out and almost lost it as my reel drag got loose and then the Shout 1/0 hook bent but did not bend enough to loose my fish. 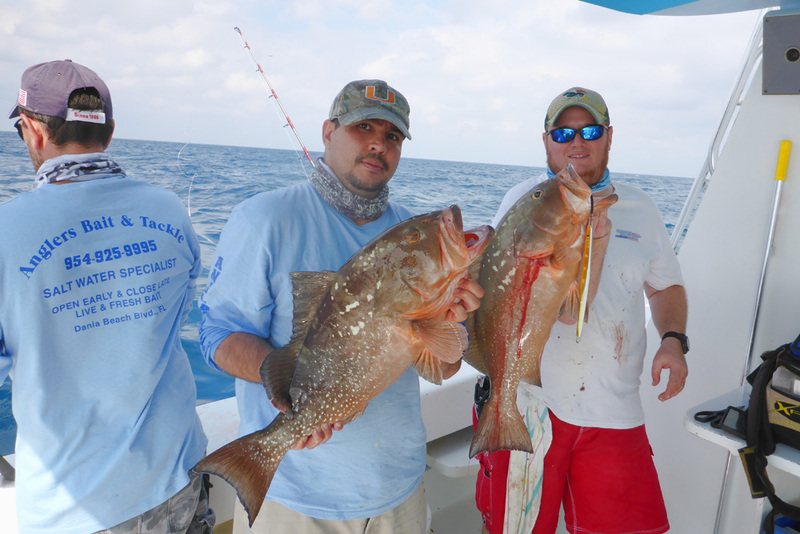 In the Red Grouper madness Rory and Robert also had a double header. 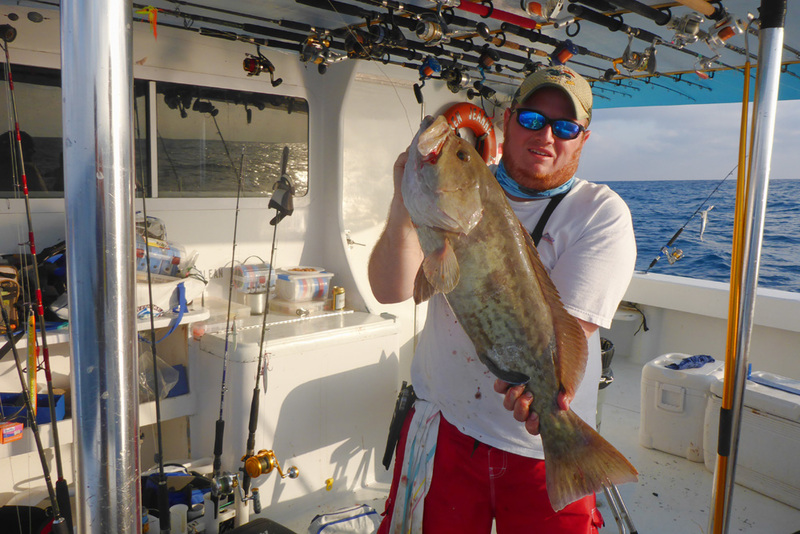 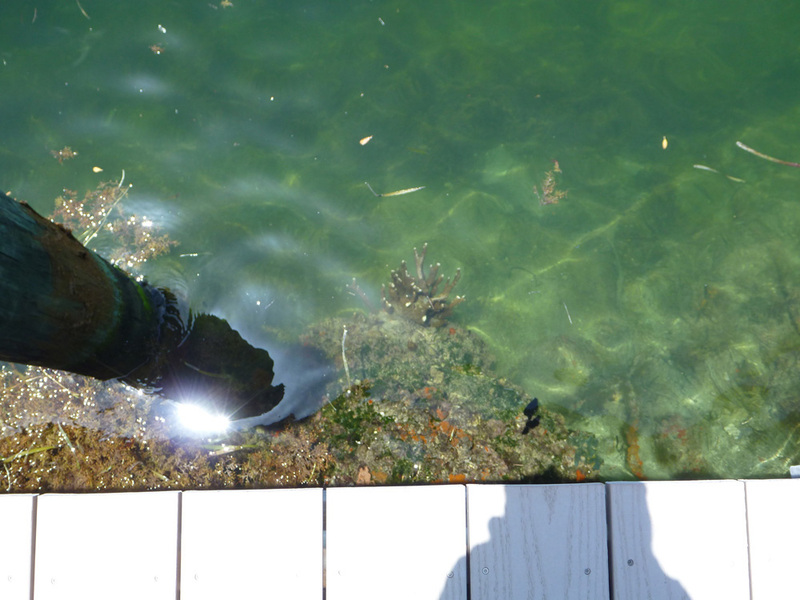 Ricky was drifting a Hookup Jig (Troll Right) in the chum slick when a very nice Red Grouper hit the tiny morsel. 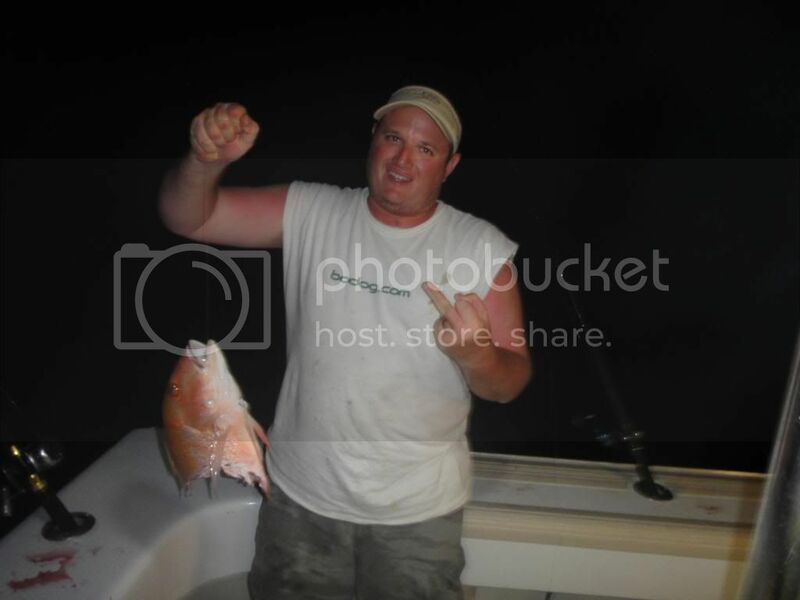 He had a good fight trying to get the fish in the boat. 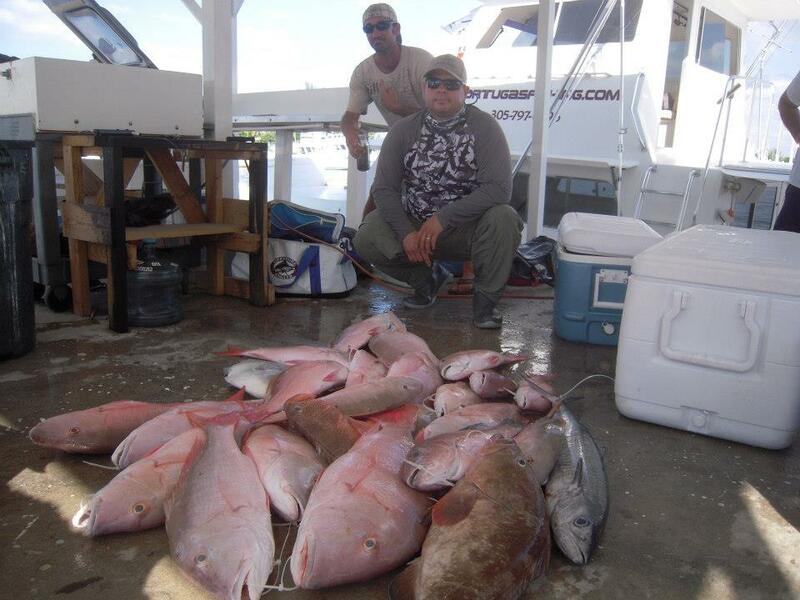 I kept on with the Maxel jig and kept getting more Red Grouper after Red Grouper. 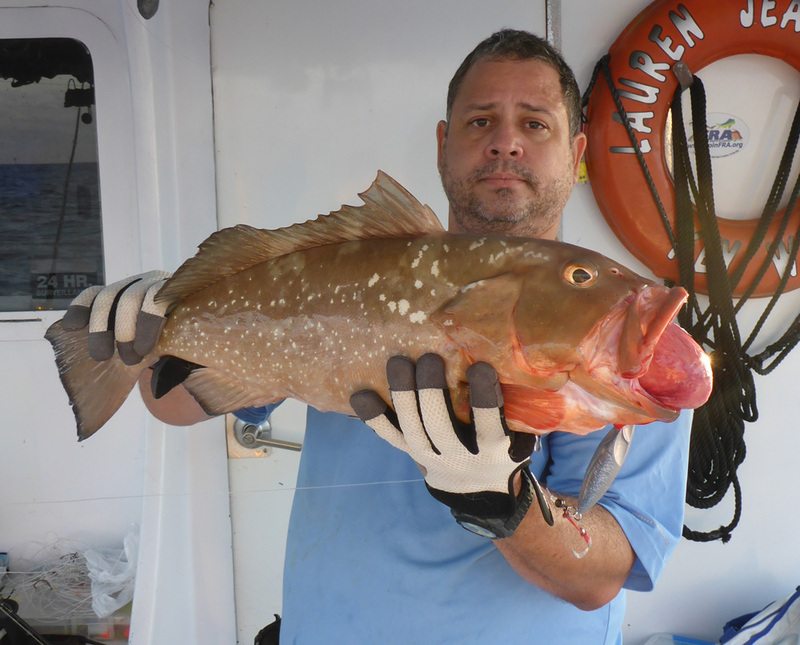 Nilson it was still around 1:30 when Nilson also got into the hot Red Grouper bite and landed a few very nice Red Groupers. 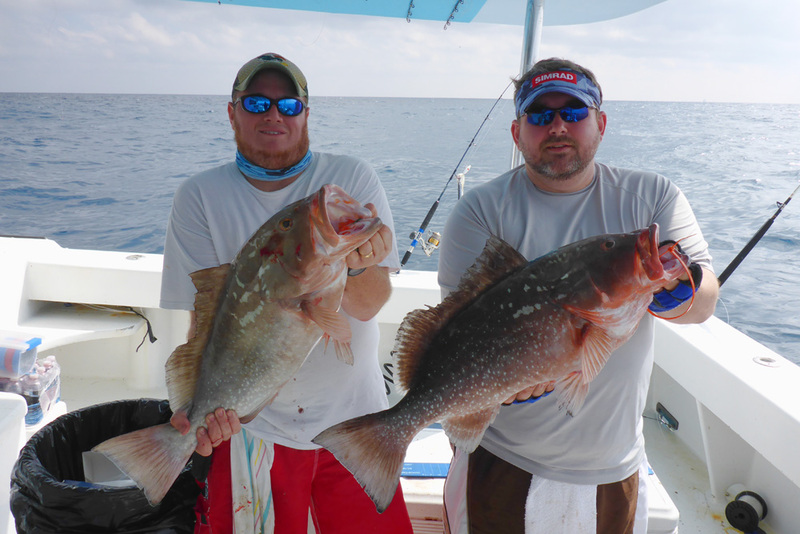 After the bite slowed down we made a move to deeper water but the current was just too much, 2 pounds would not hold so we moved to another shallow spot. 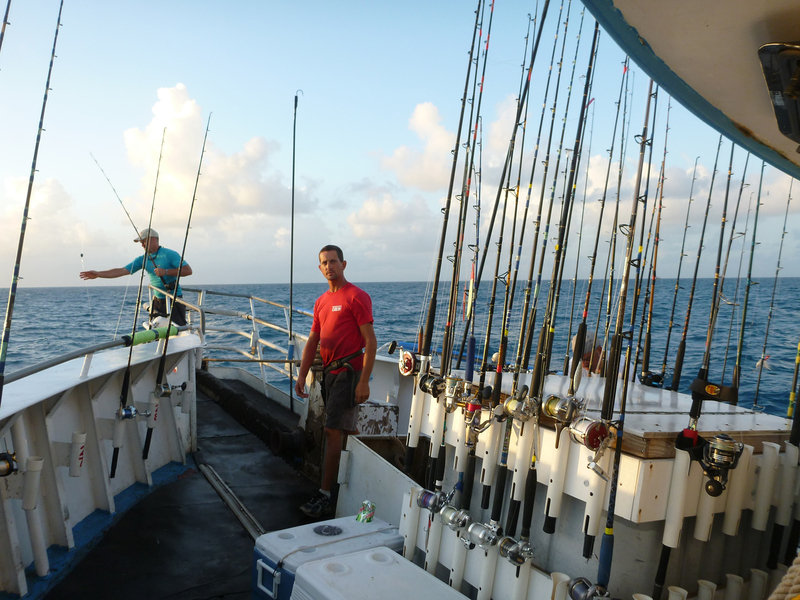 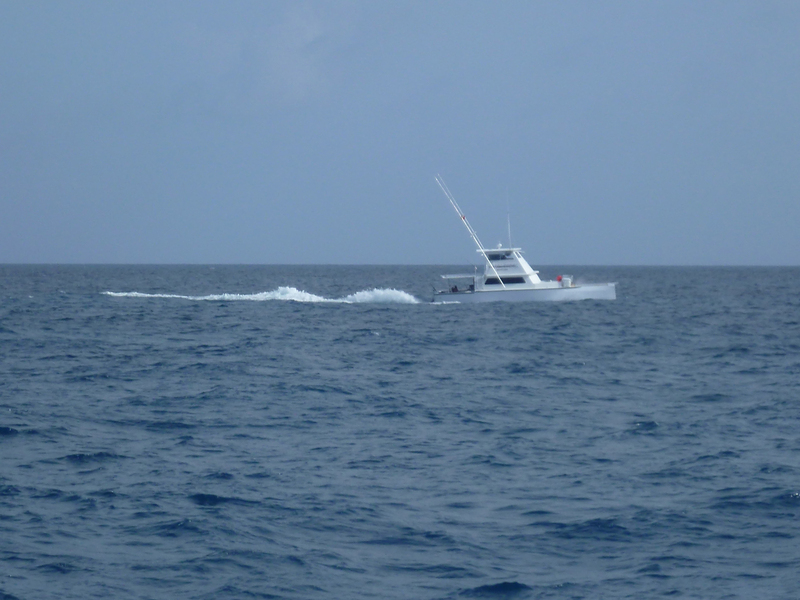 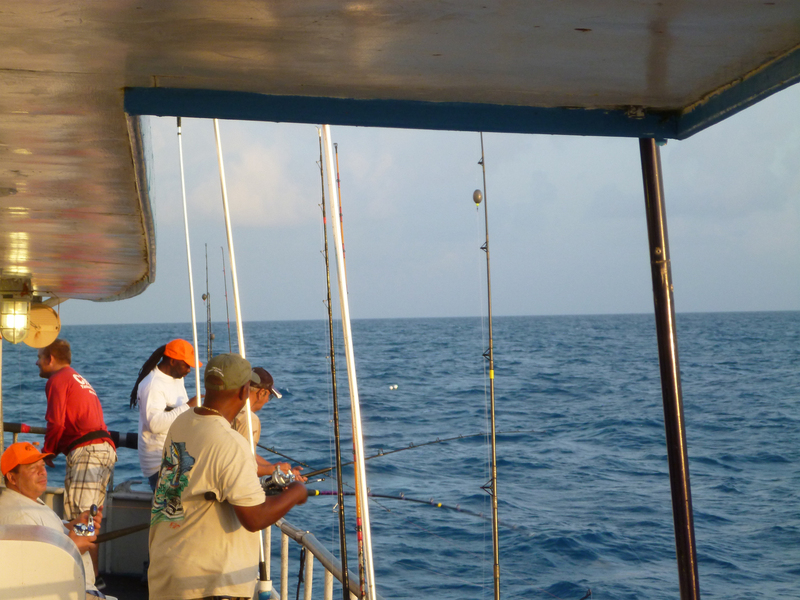 The Captain told us to get our heaviest gear and put a big live bait down. 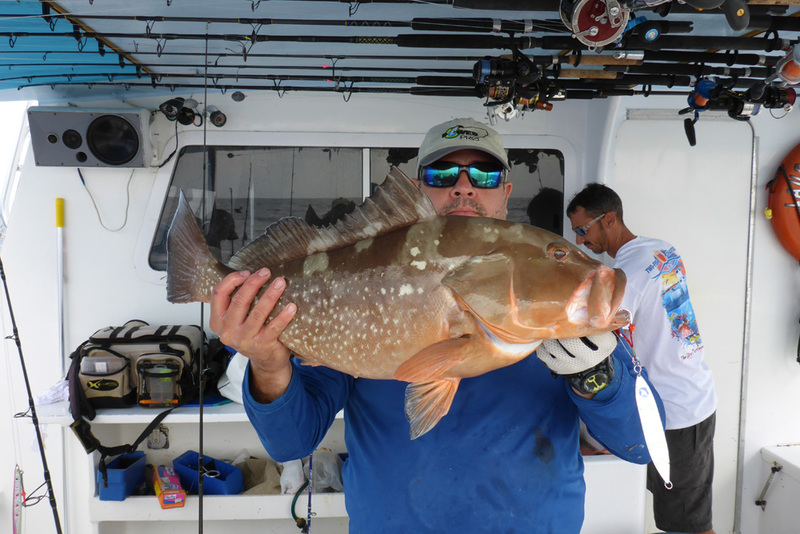 Adam decided to use his jigging gear with a Jigging Master hook, he made the right choice and was able to land a nice Goliath Grouper. 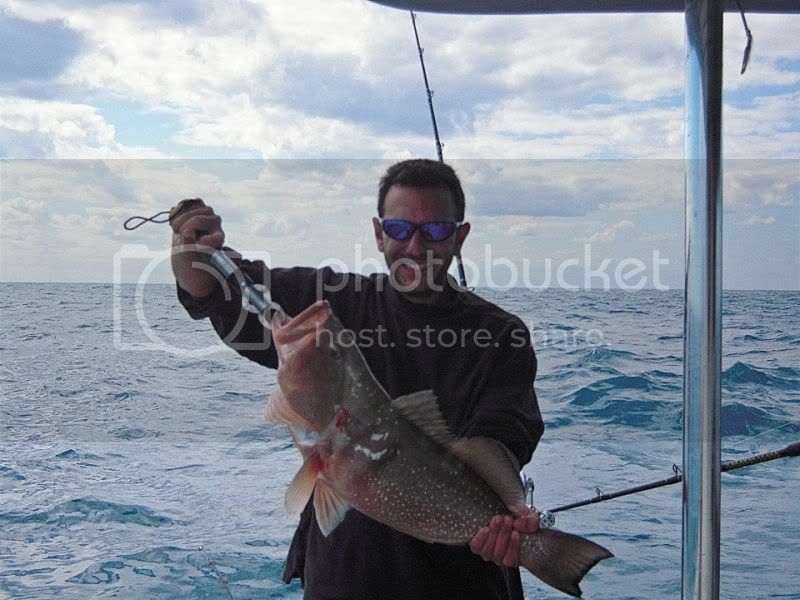 Then shortly after Rory landed on of the few non Red Groupers. 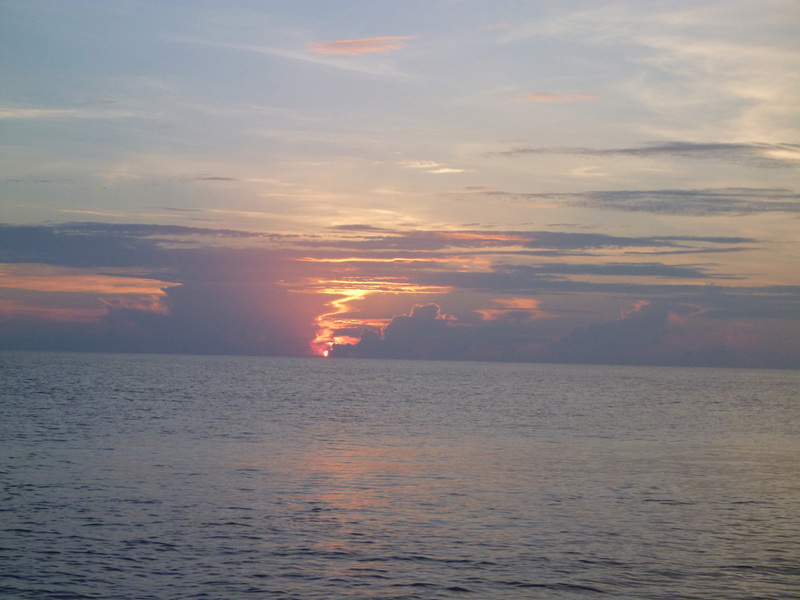 Night time fell upon us and was to be the last night of the trip. 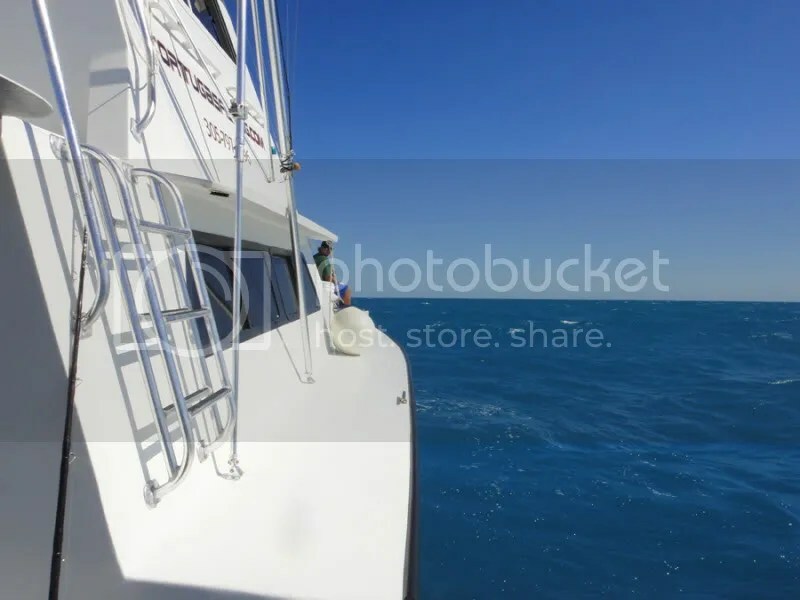 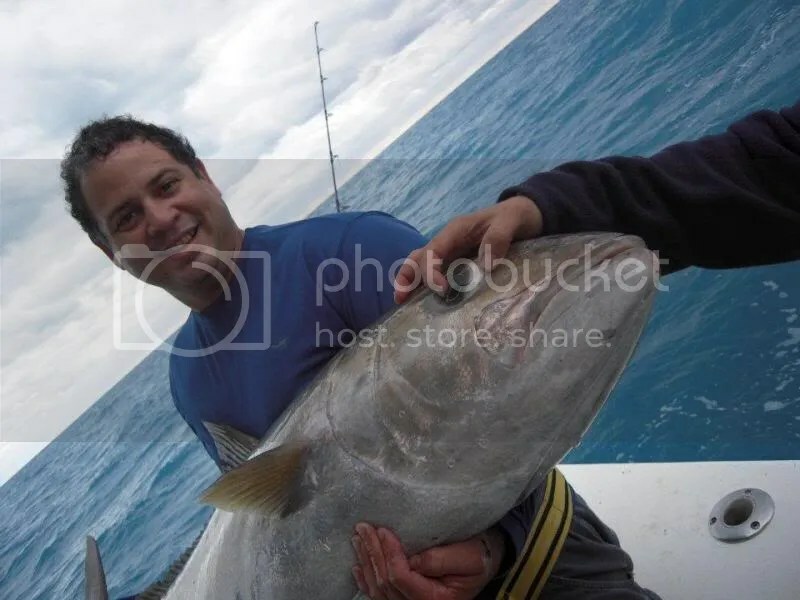 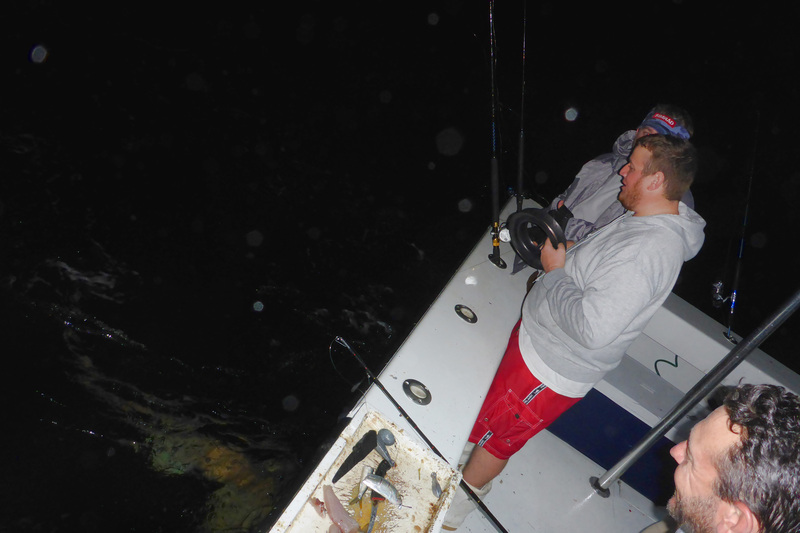 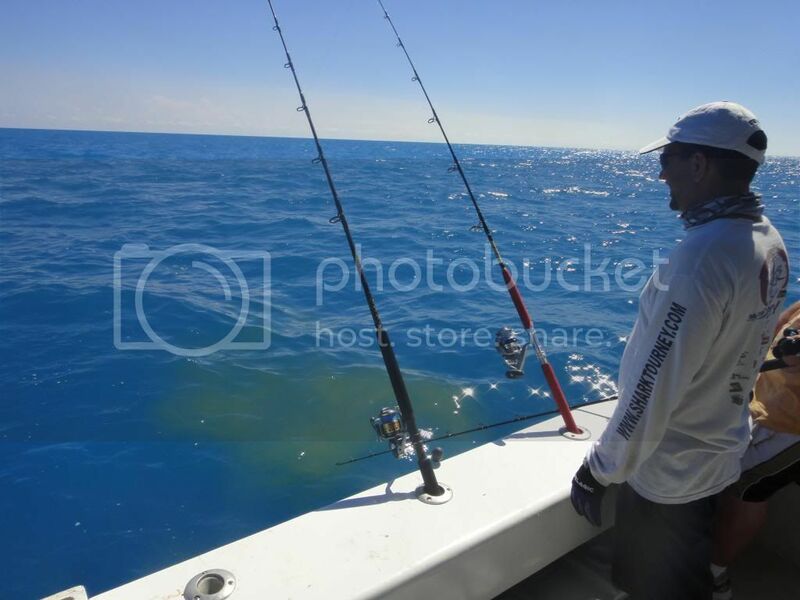 The highlights were Rory thinking he was stuck on the bottom and using a YO-YO to pull his rig but surprise, surprise, the line kept on coming and coming until a big Nurse Shark was revealed. 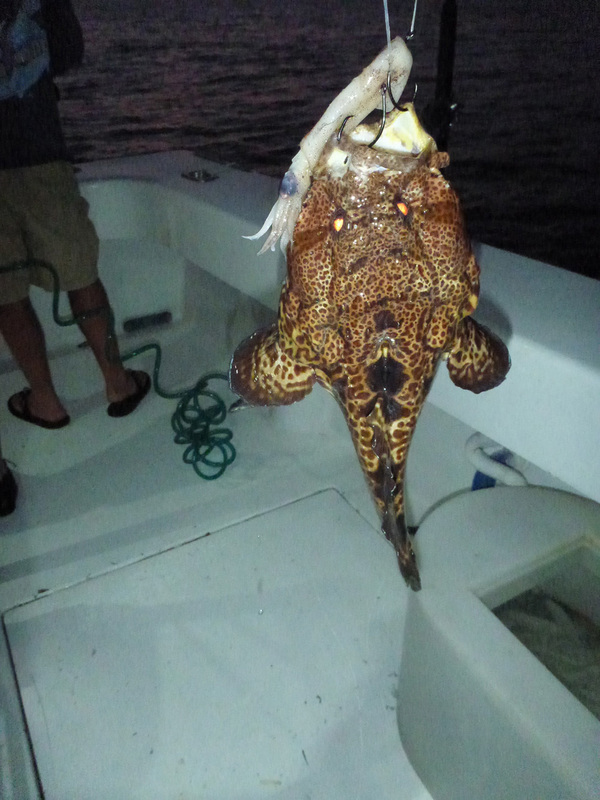 Rory always seems to find one of these cats no matter where he fished, well most of the time. 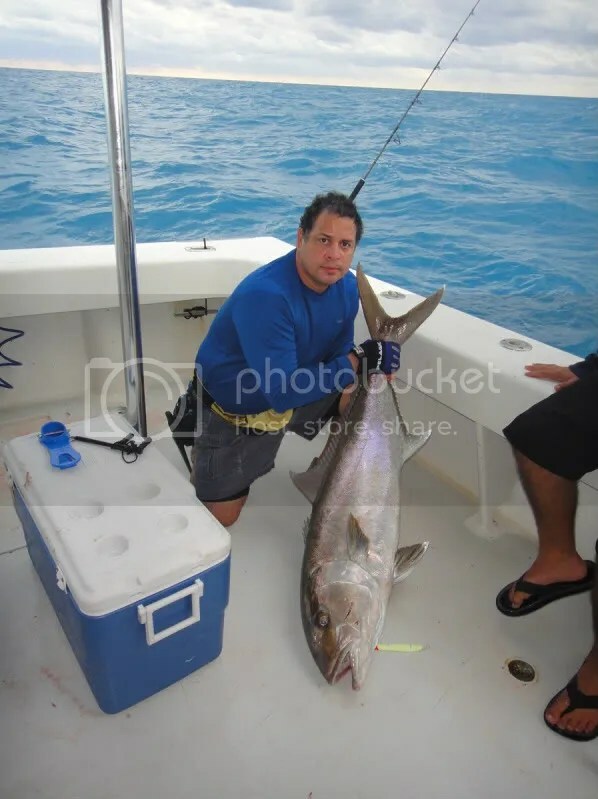 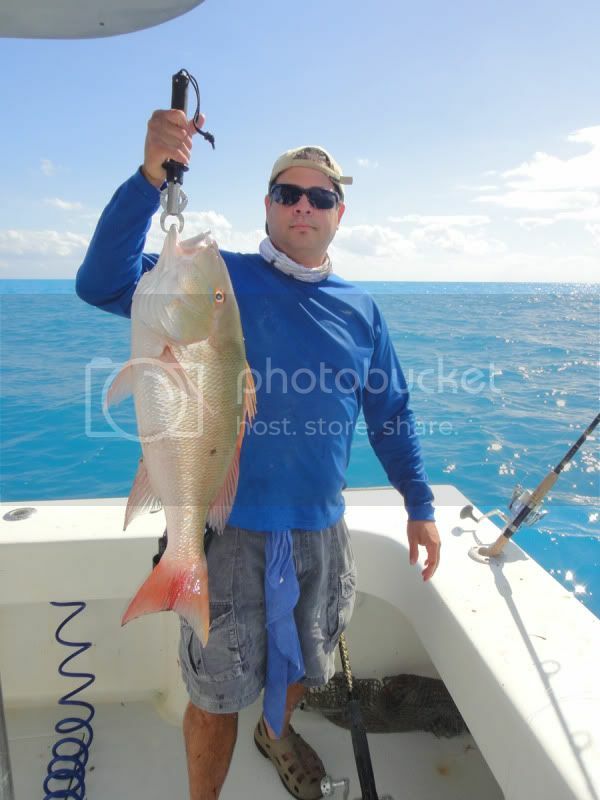 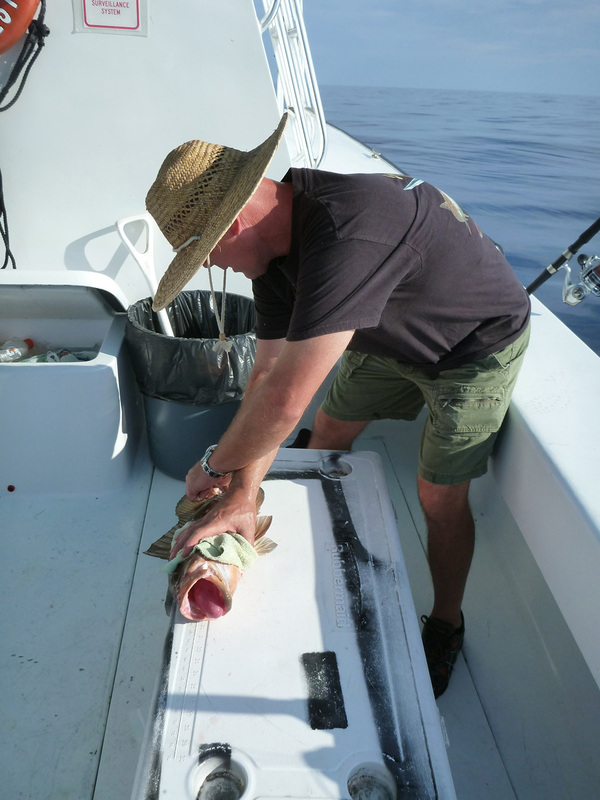 After the Nurse Shark was released unharmed Adam landed an 18 pound cobia. 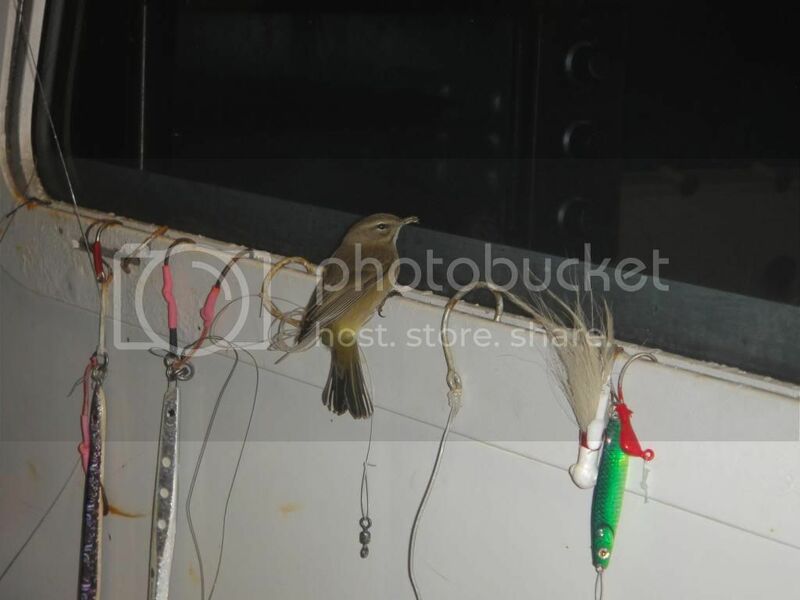 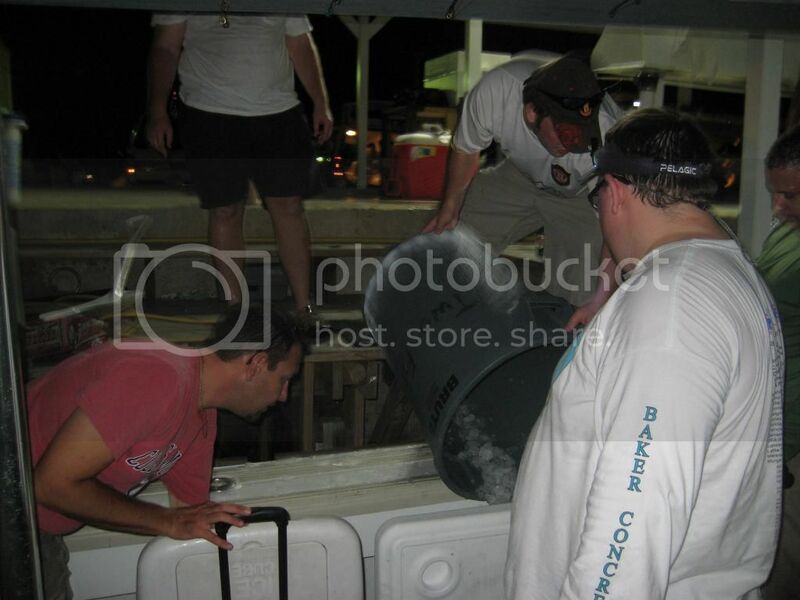 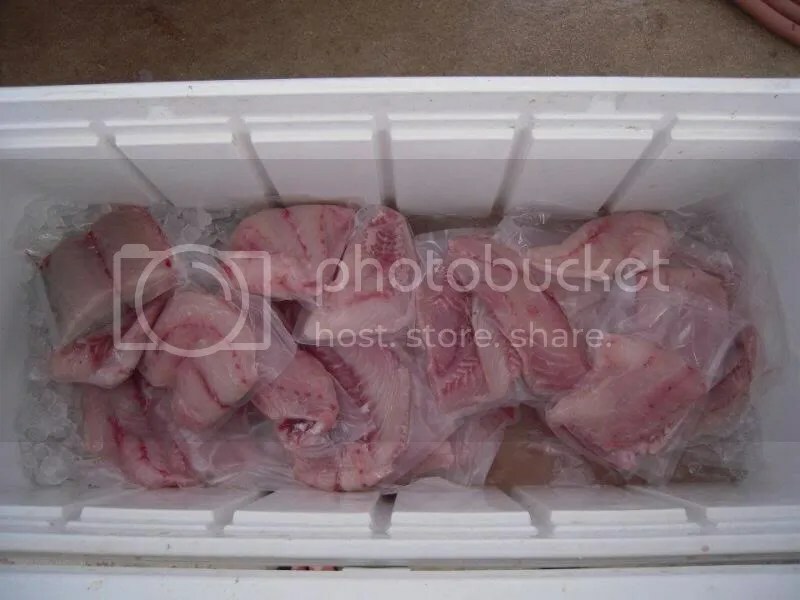 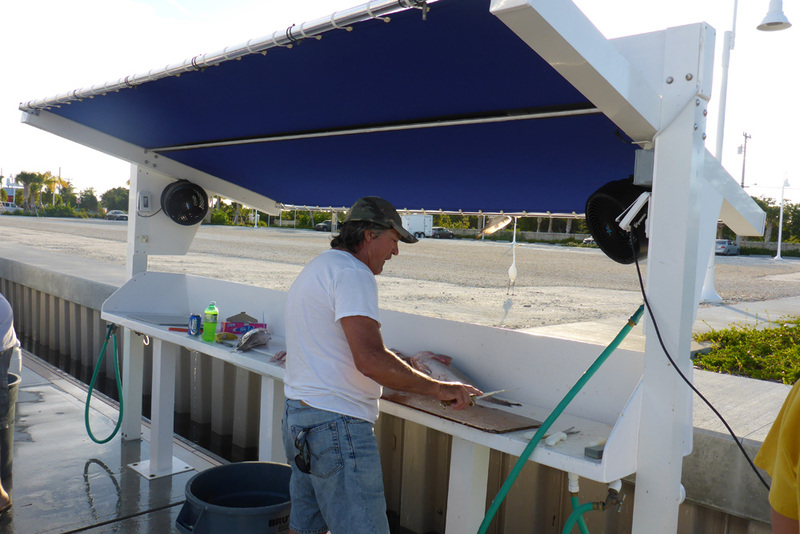 it went nuts in the boat as they always do, so we had to put it in a cooler until it calmed down. 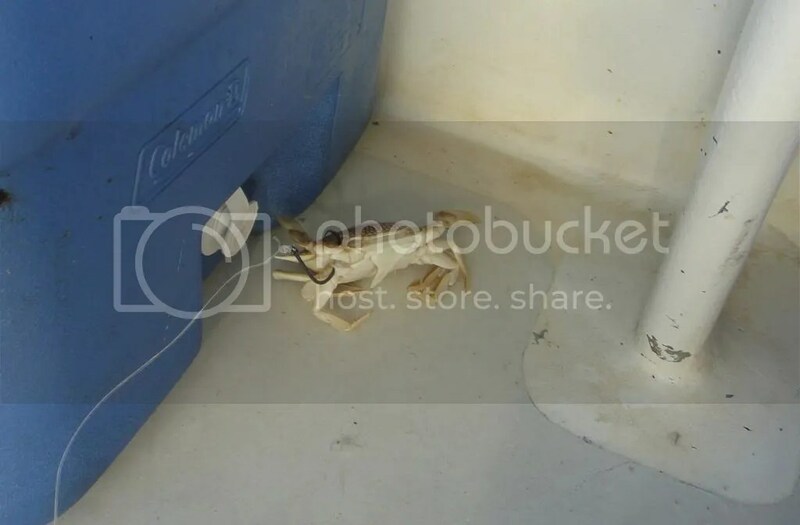 We forgot all about it and did not take a pic. 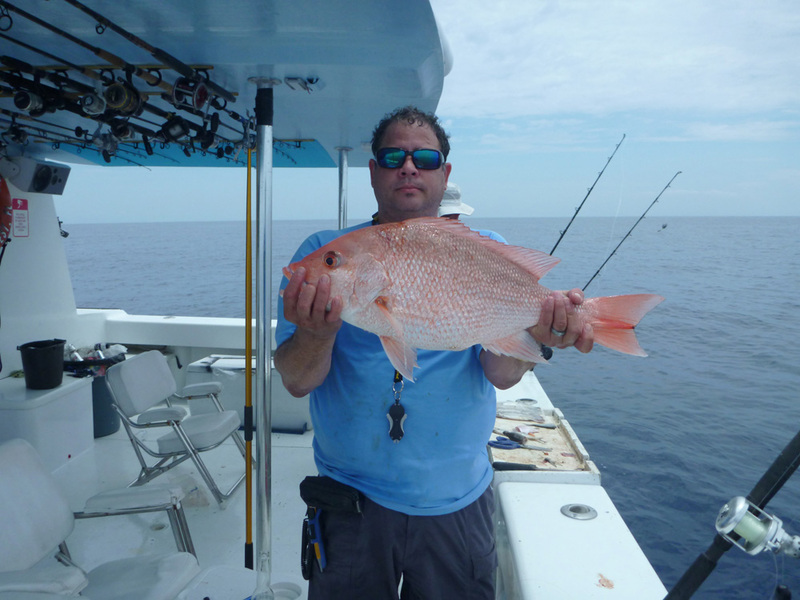 The rest of the morning we spent it catching yellow tails to make up our snapper limit. 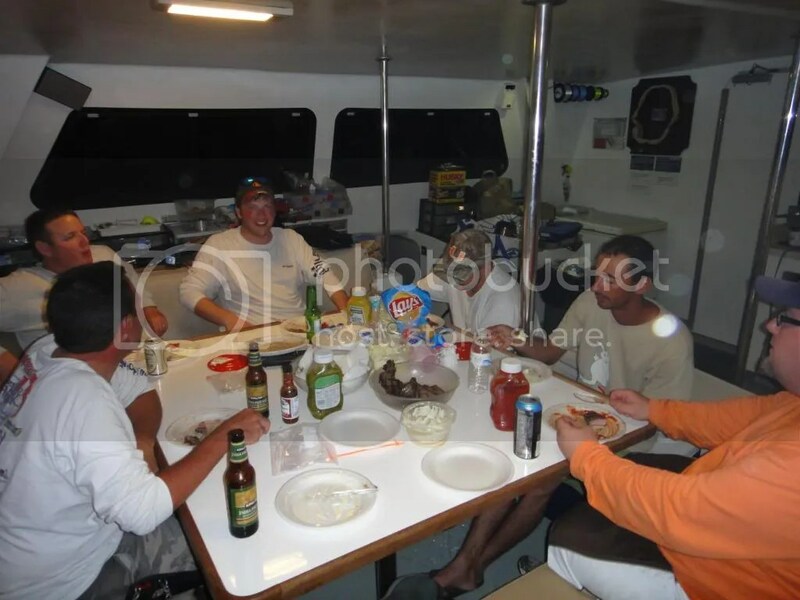 The Captain was kind enough to cook breakfast and dinner for us through out the trip. 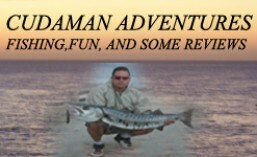 Normally he would do a breakfast and a dinner. 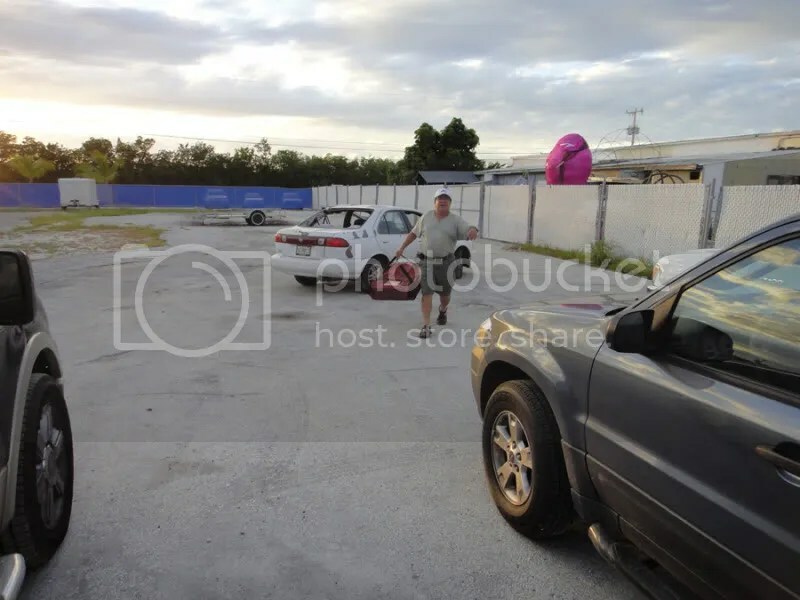 We thank him very much for going the extra mile with us. 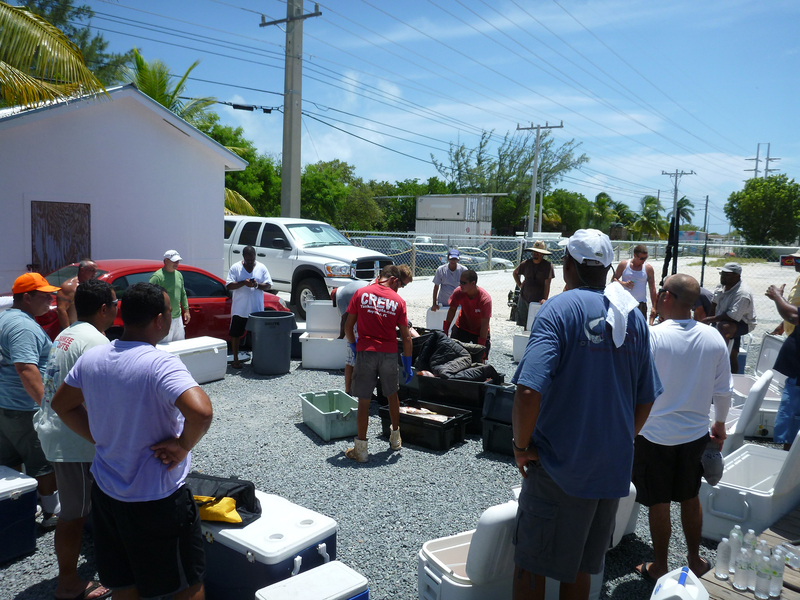 Back at the dock we laid our gear against the fileting station for a wash.
Our catch in garbage cans, there was more in the coolers as we were unloading from the boat. 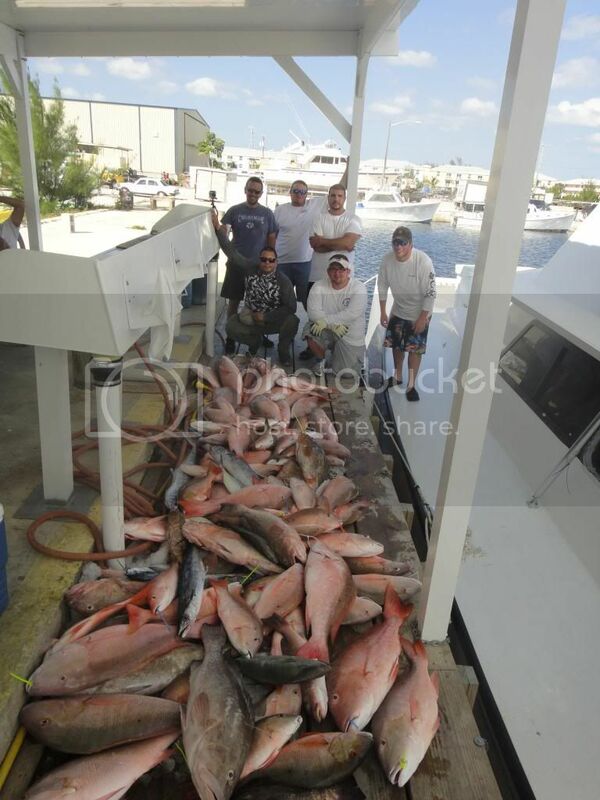 Our total catch picture is below. 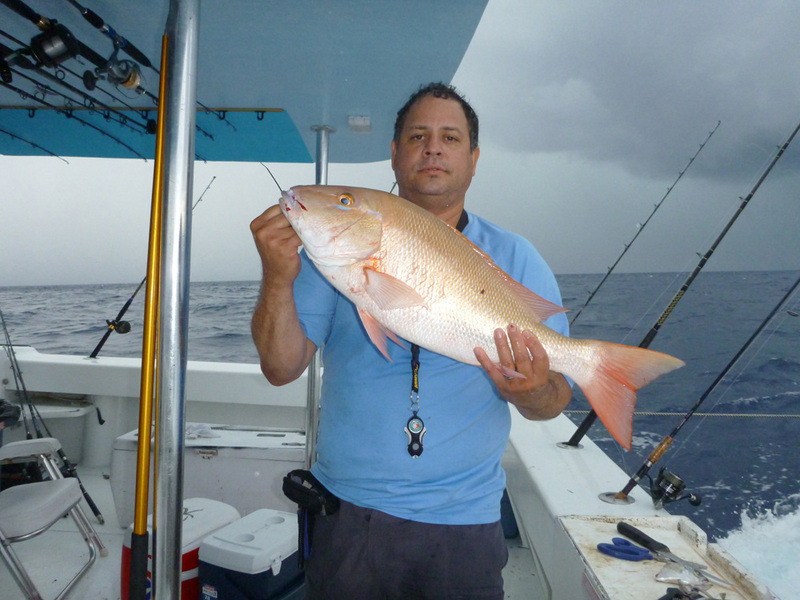 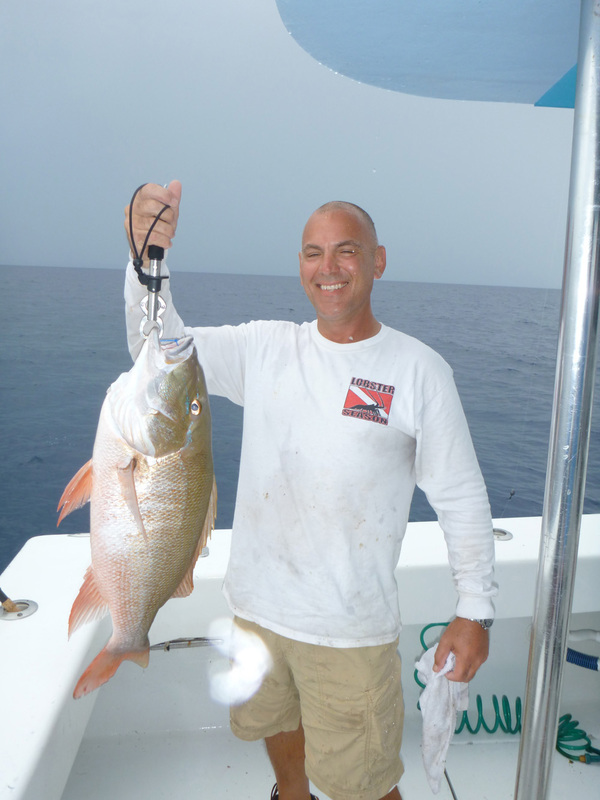 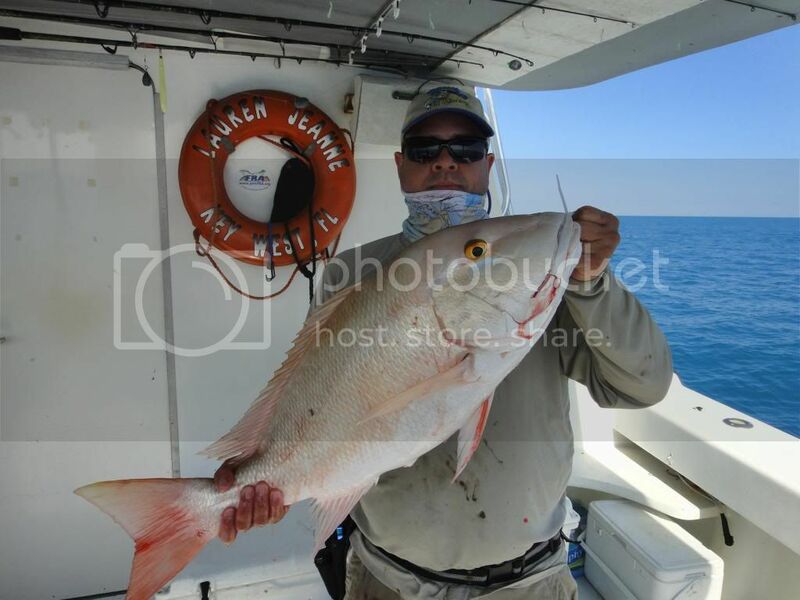 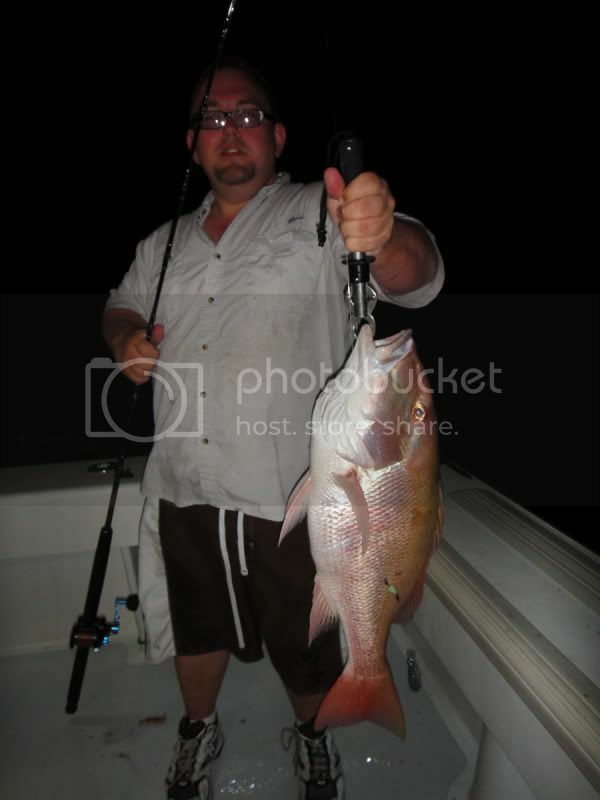 High Hook for Mutton Snappers went to Robert with about 10 Mutton Snappers. 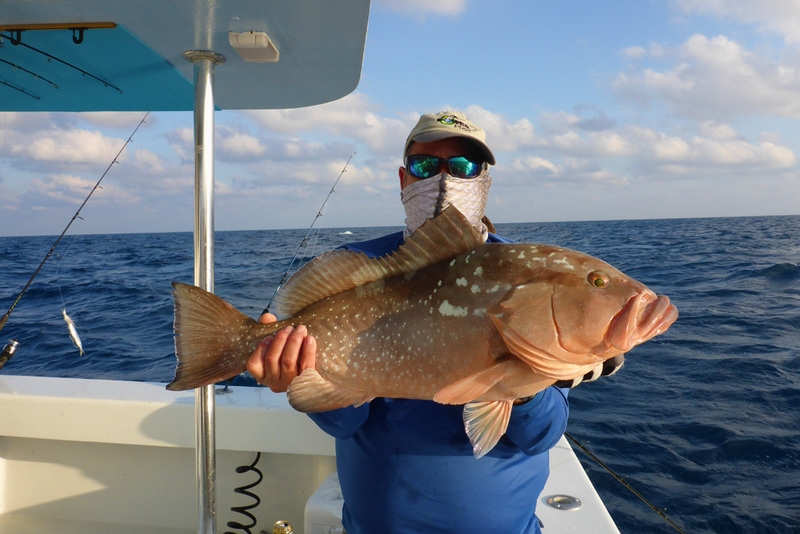 I was High Hook on Groupers with my limit of six and all by way of the Vertical Jig. Got over 15. 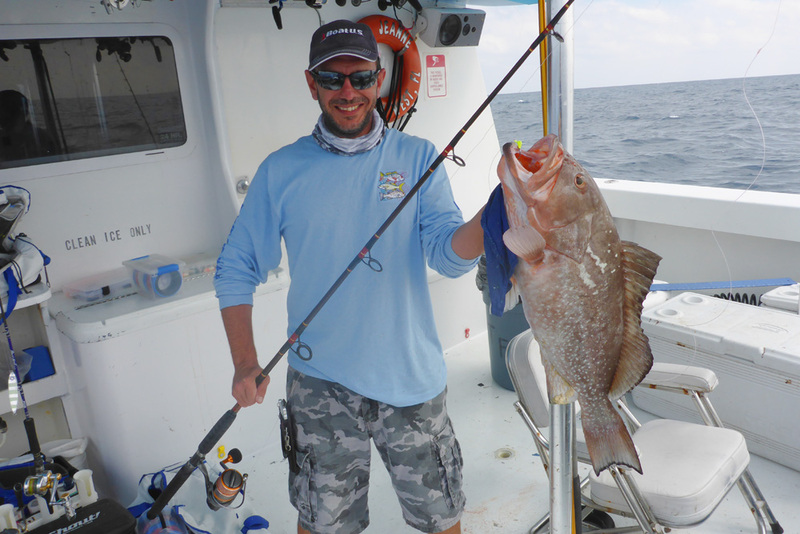 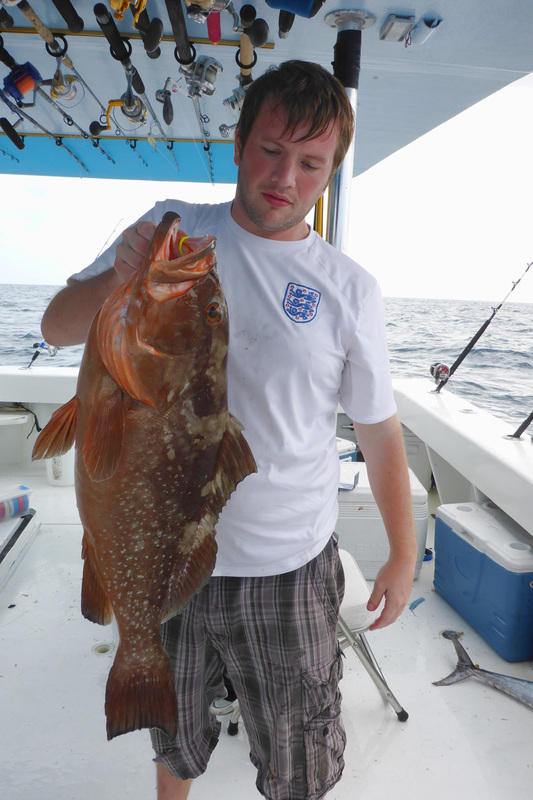 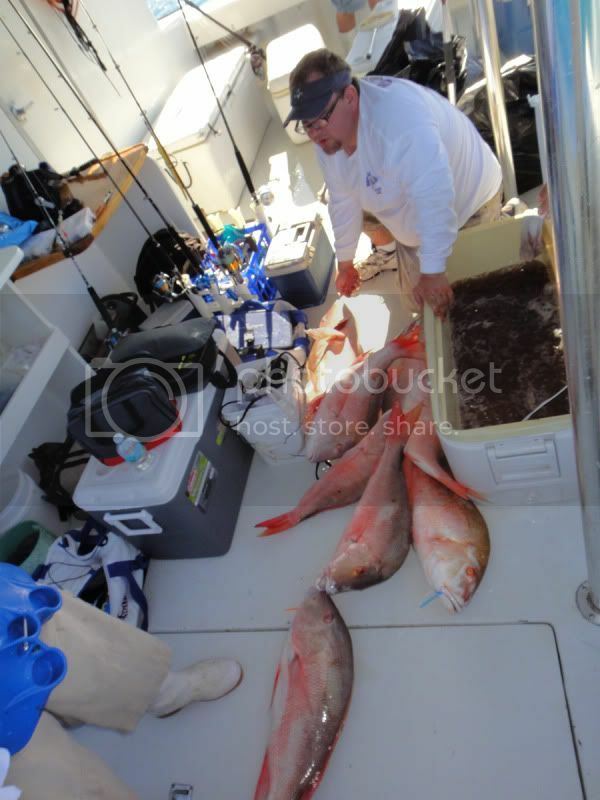 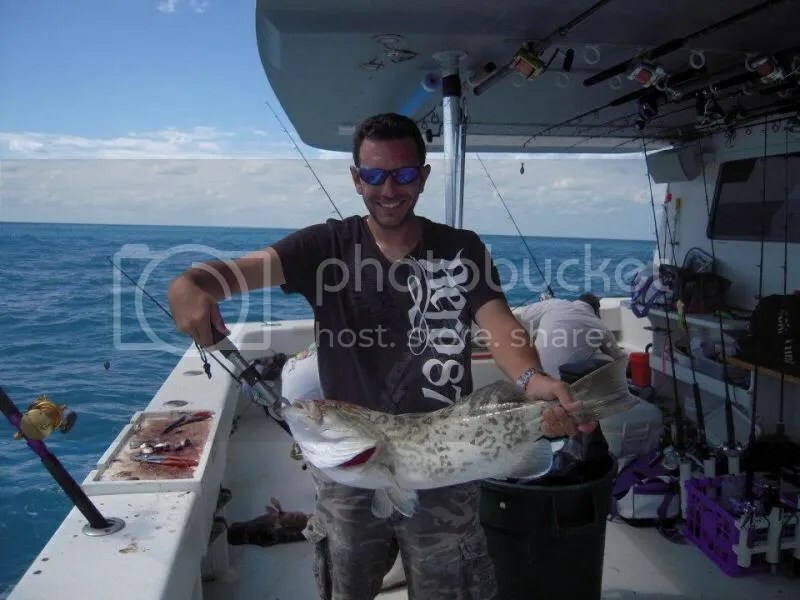 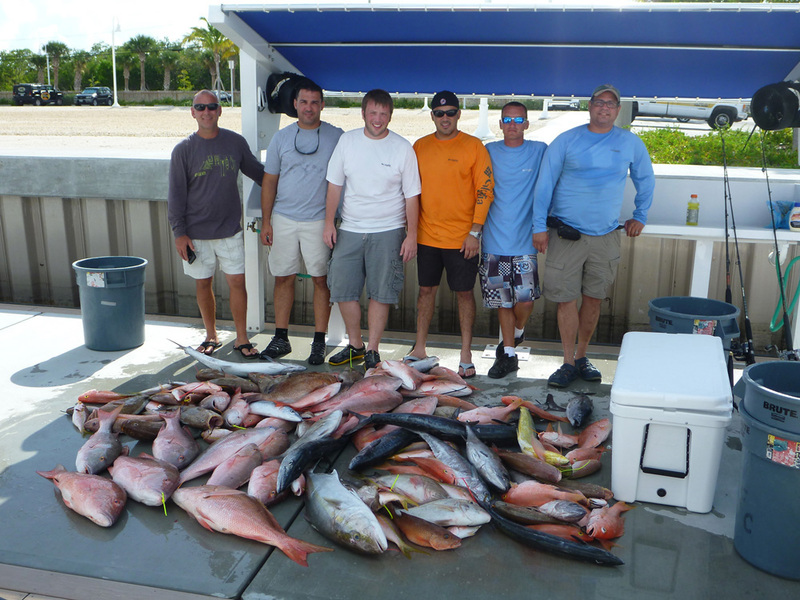 Rory also ended very high on the Groupers with 7 Red Groupers and one Gag Grouper. 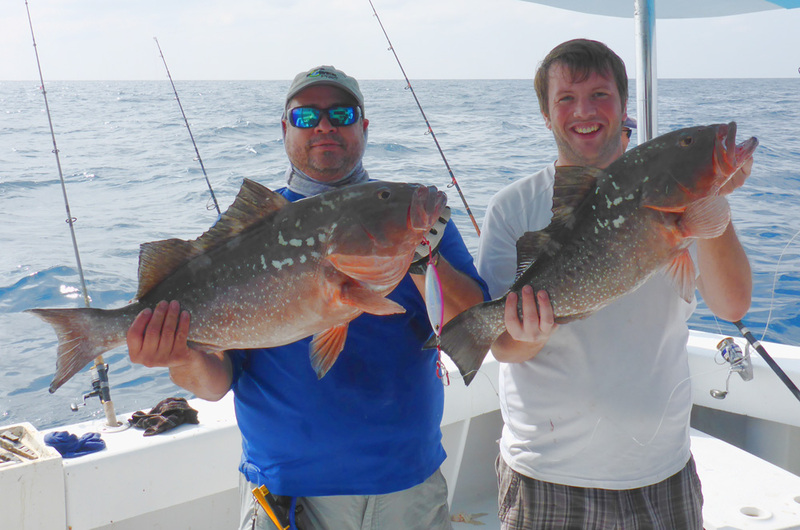 Biggest Fish, Biggest Mutton, and Biggest Grouper went to Adam. 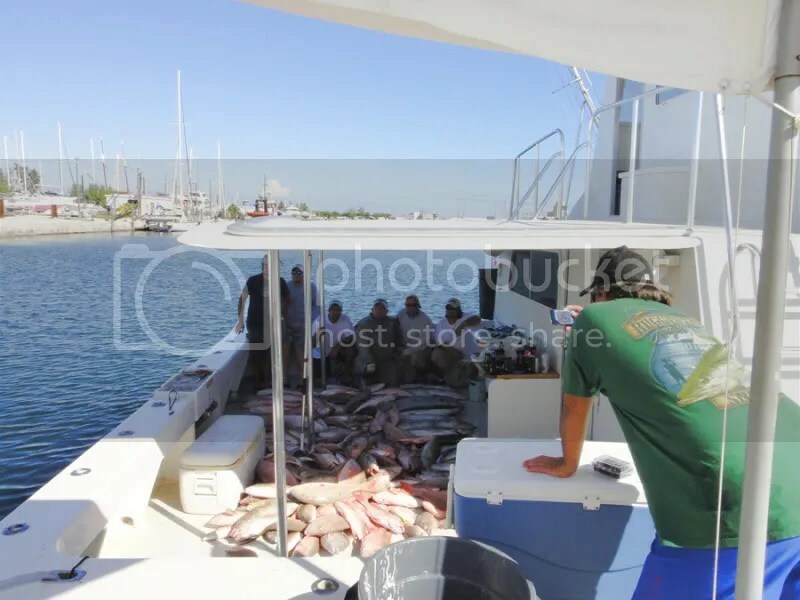 Stevie the Wonder fileting our catch for $35 bucks an hour, $5 more than last year. 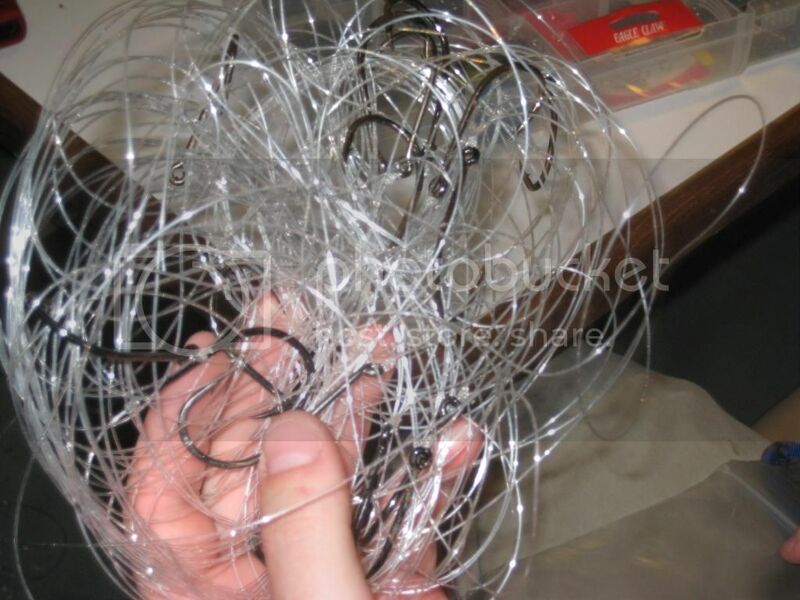 But it is worth the wait to make things easier when you get home. 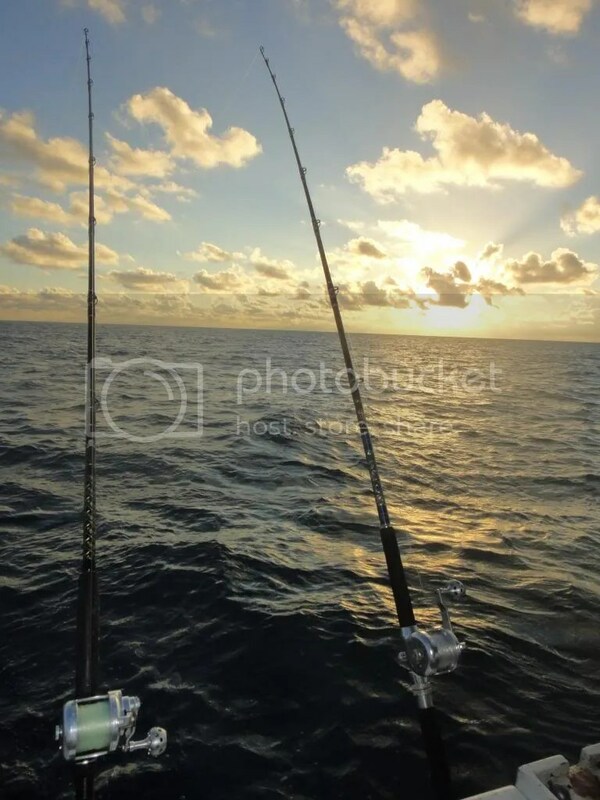 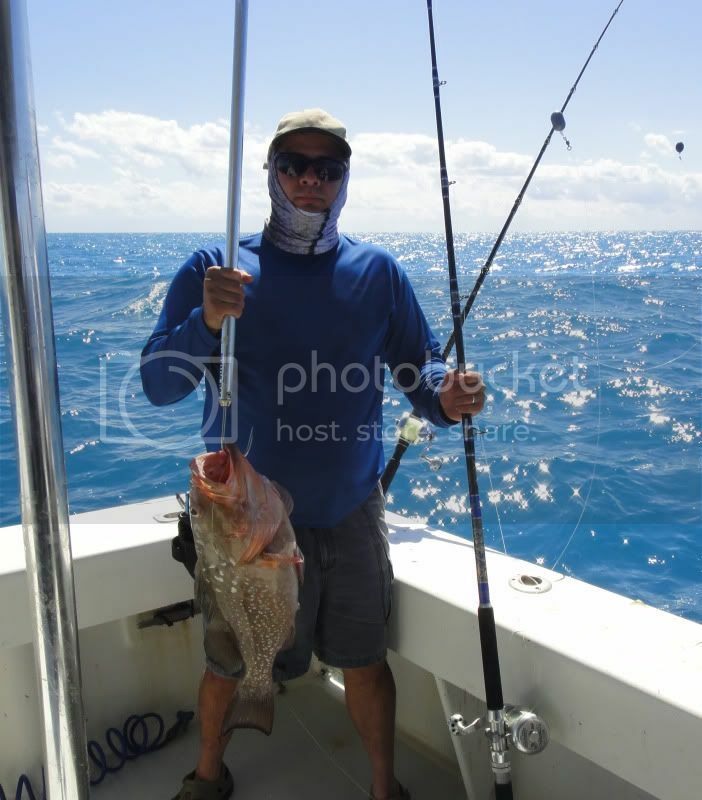 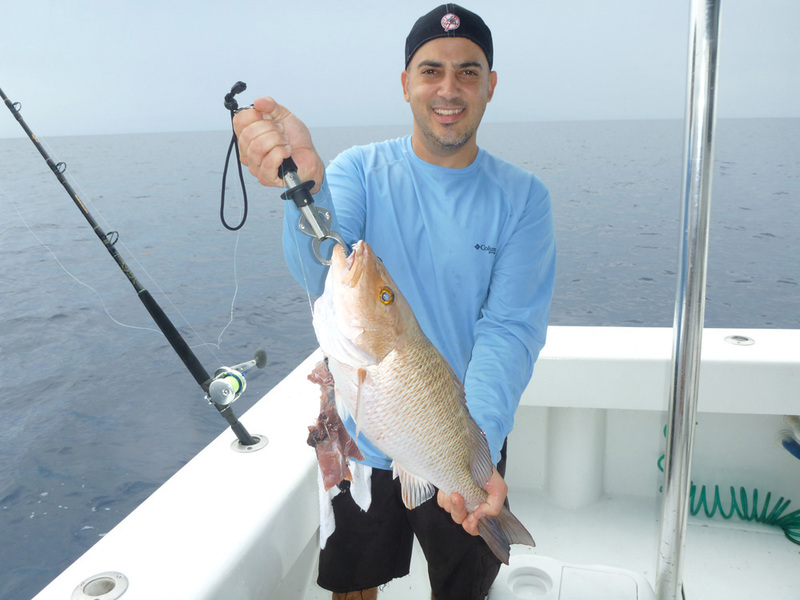 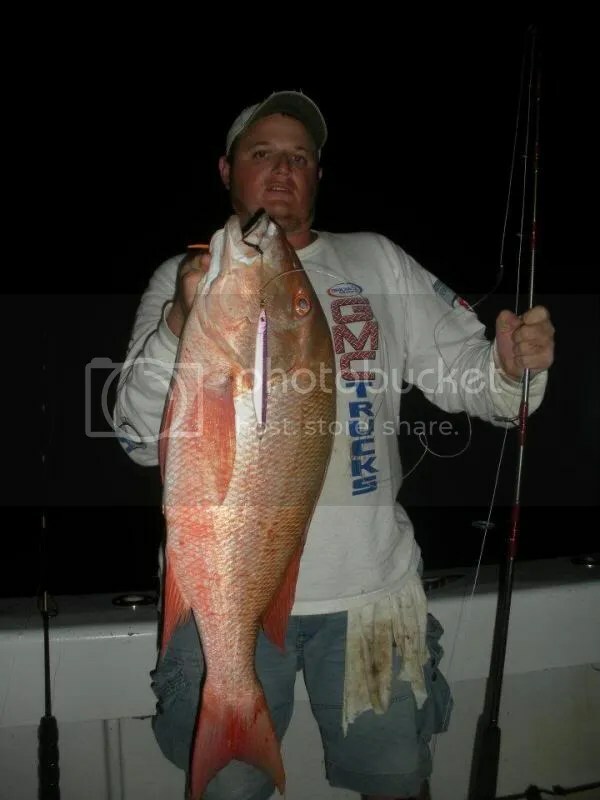 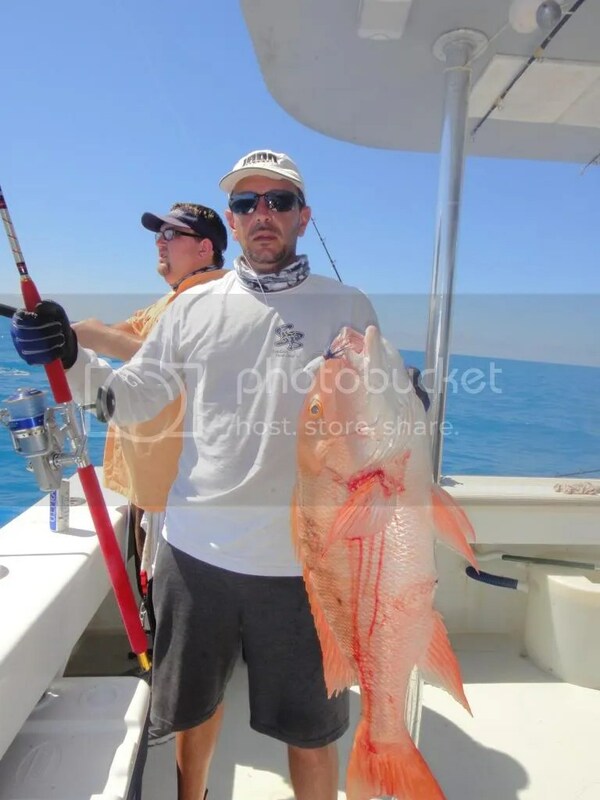 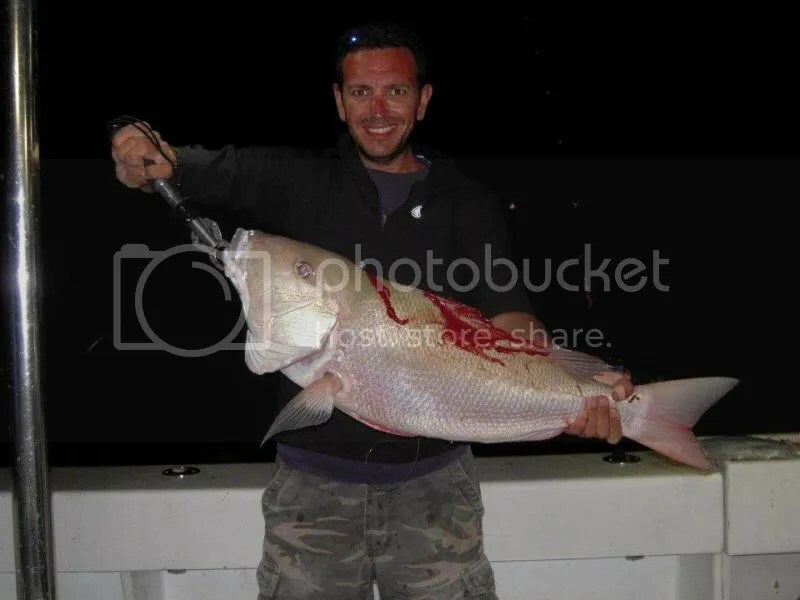 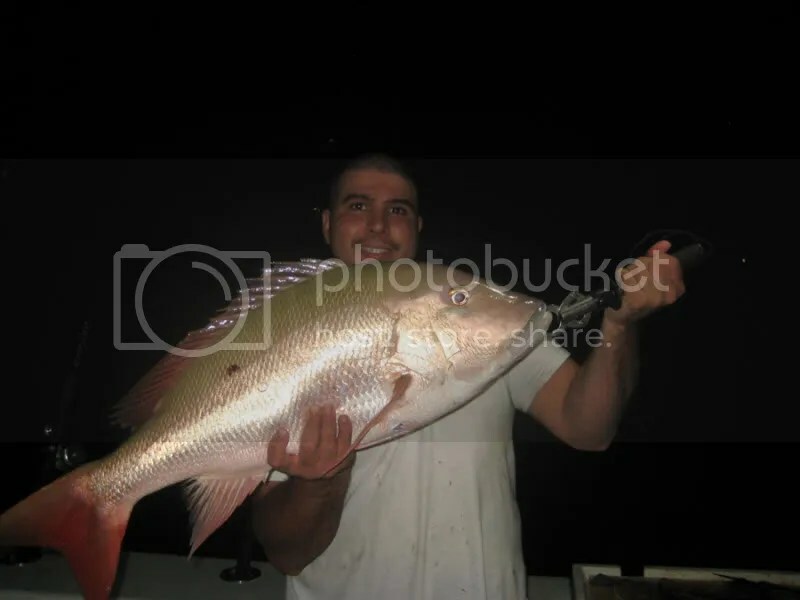 -Accurate BX600 4:1 w/ 80 lb braid, top shot 100 lb mono on a GF850H Calstar (30 to 80 pound class rod).For Groupers and doubled up as a Mutton Snapper rod at night. 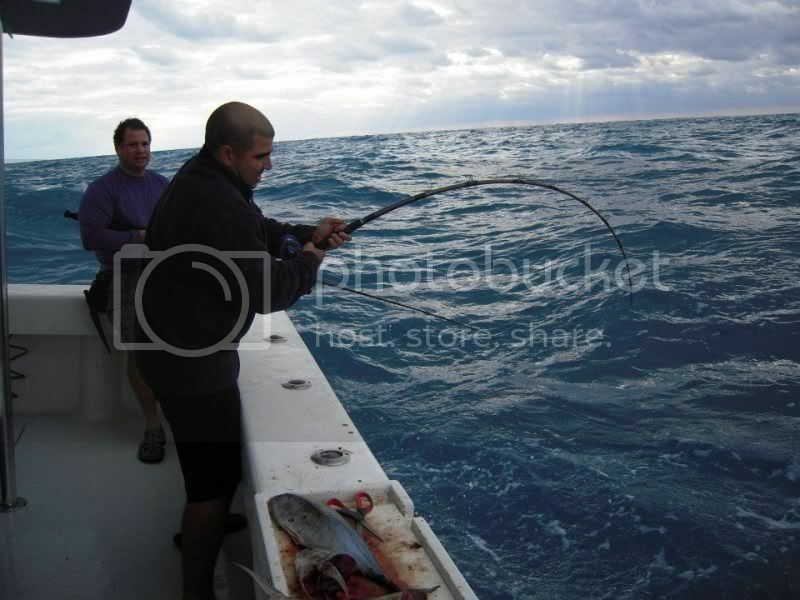 I had 80 lb braid backing and a short 100 foot top shot that I could change when night or daytime came. 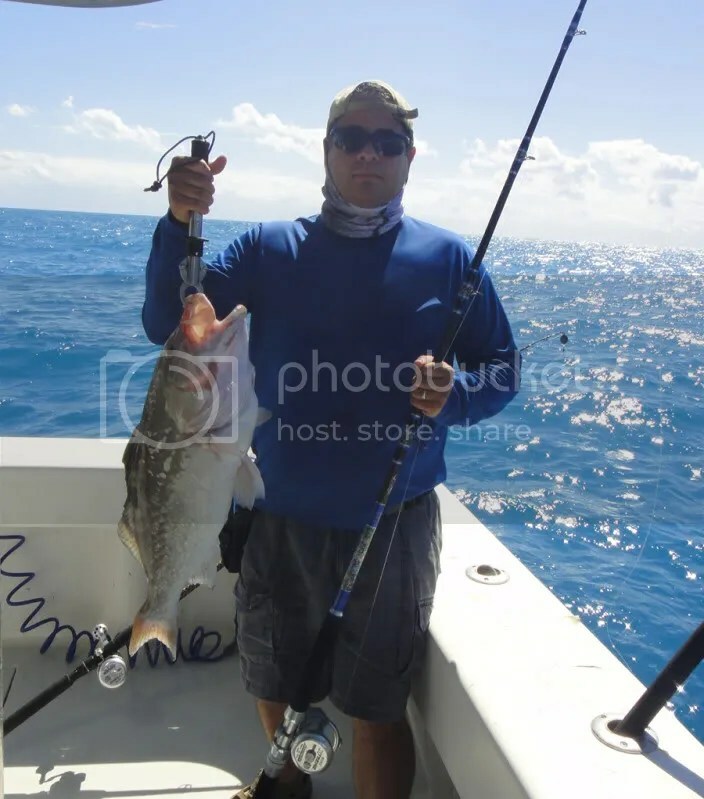 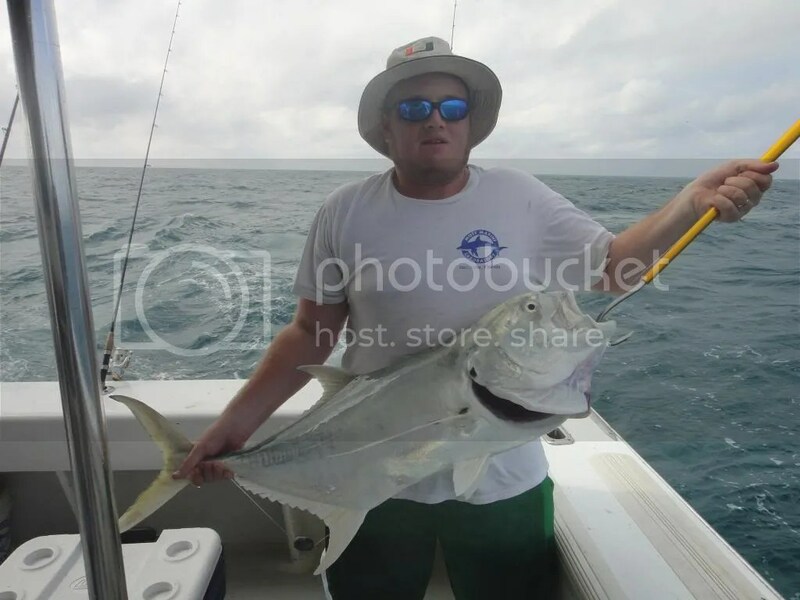 -Shimano Sustain 5000 with 15 lb mono line to catch Yellow Tails. 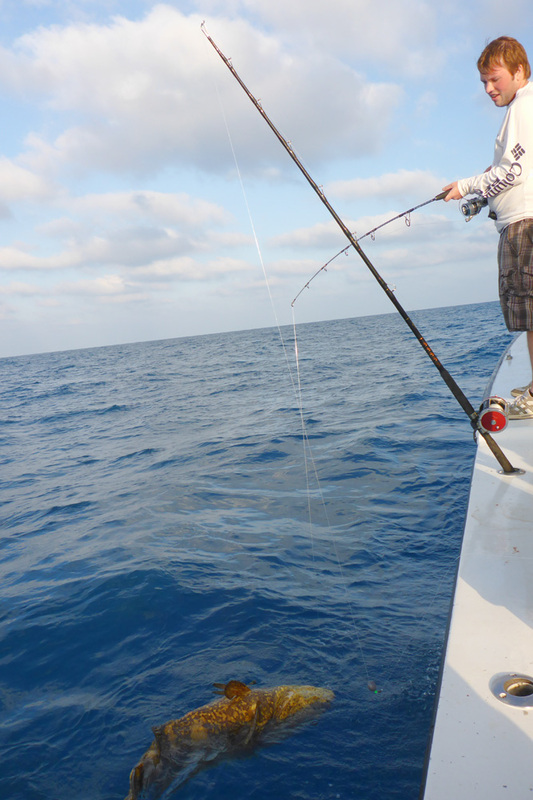 Next time will bump to 20 lb line. -Shimano Stella 8000SWPG on a factory Calstar 7 foot rod. 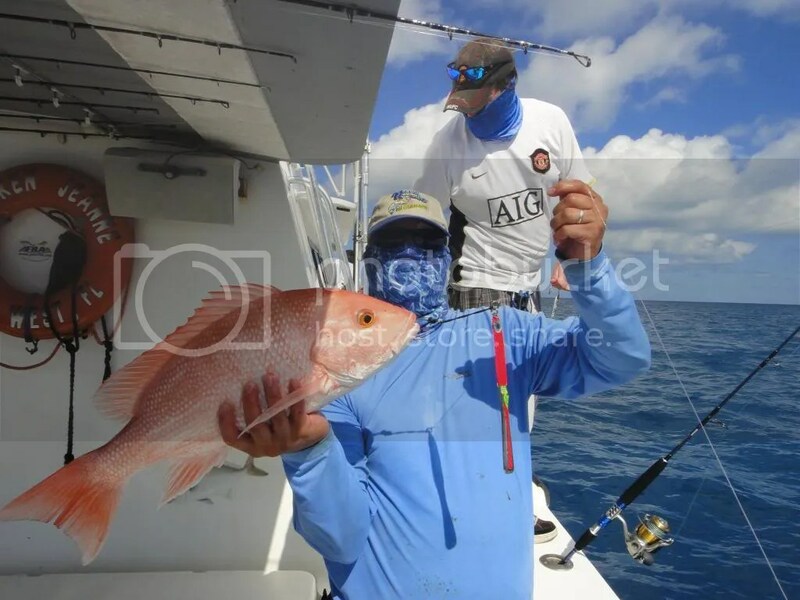 -Jigging Master PE3 filled with PE4 BB line with 40lb flourocarbon leader on a 200 gram Jigging Master Power Spell Jigging Rod. 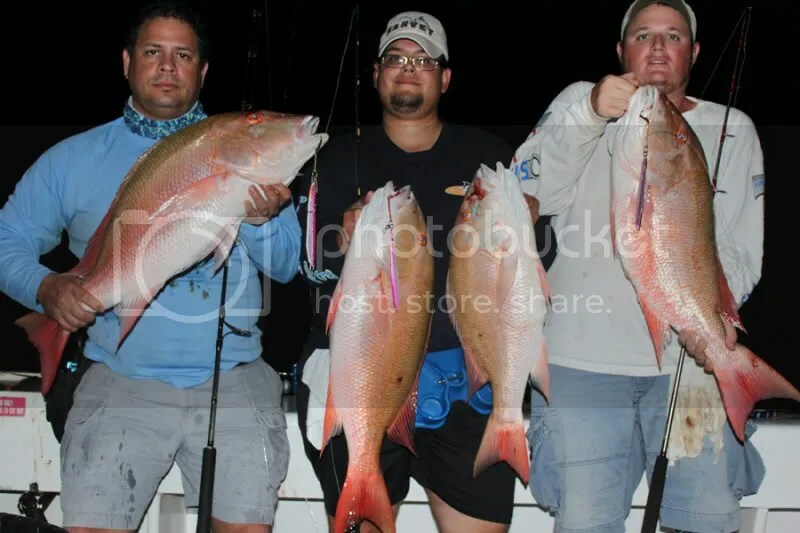 -Jigging Master Ocean Devil PE6 filled with 65lb Tuffline XP and and 60 lb leader on a Jigging Master Terminator 400 gram rod.